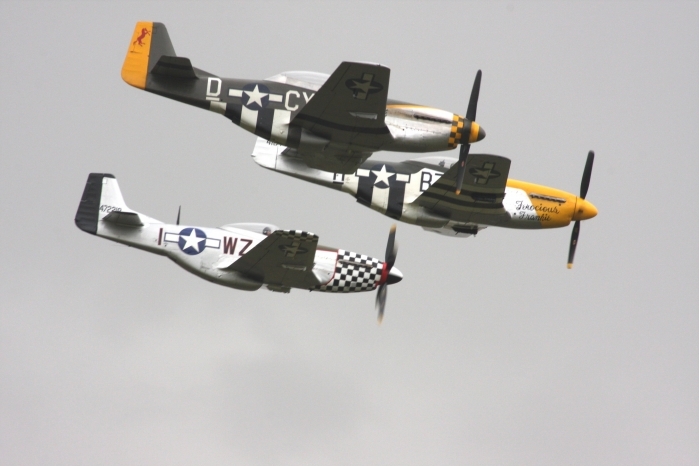 Duxford's Flying Legends Air Show is held every year in July. 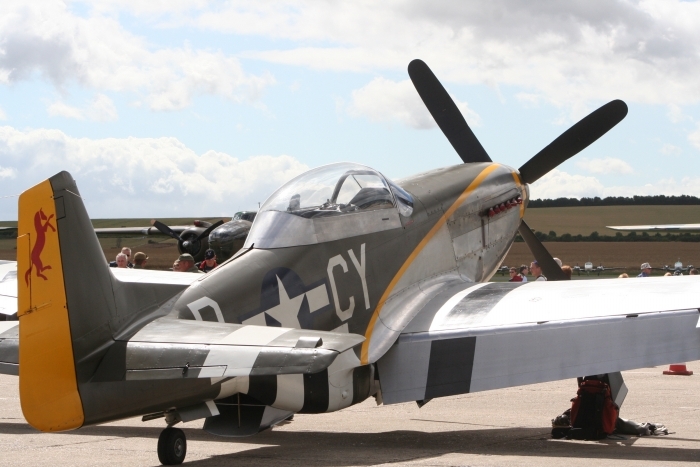 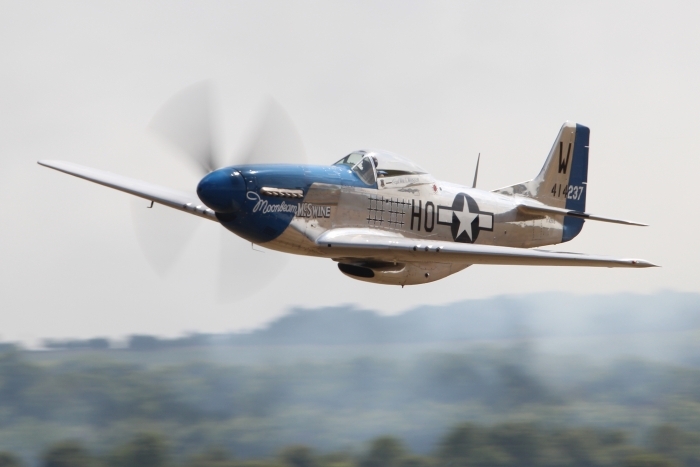 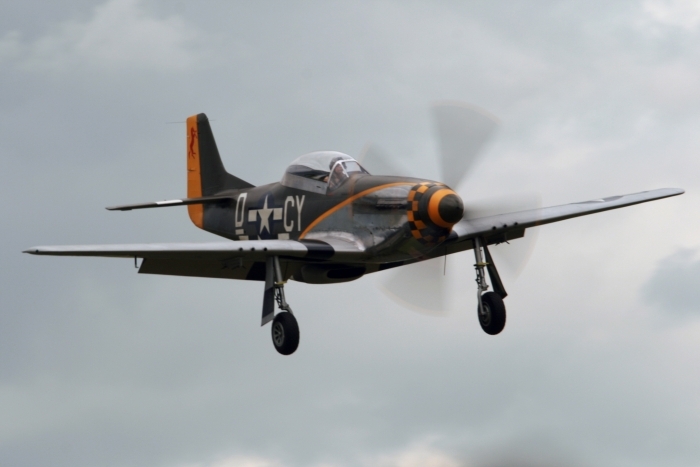 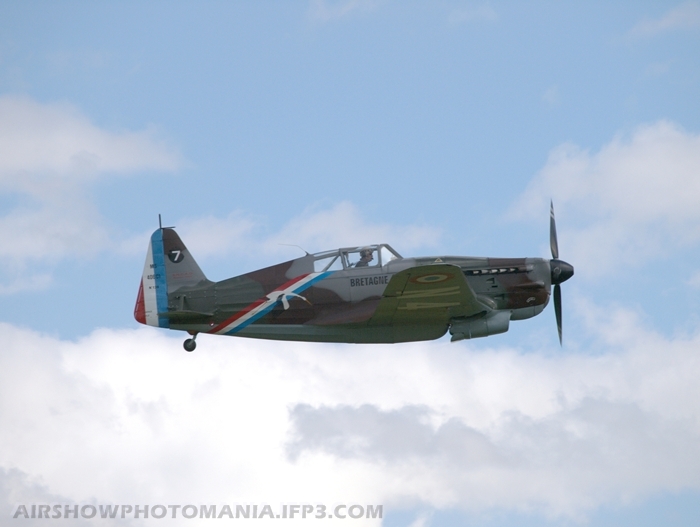 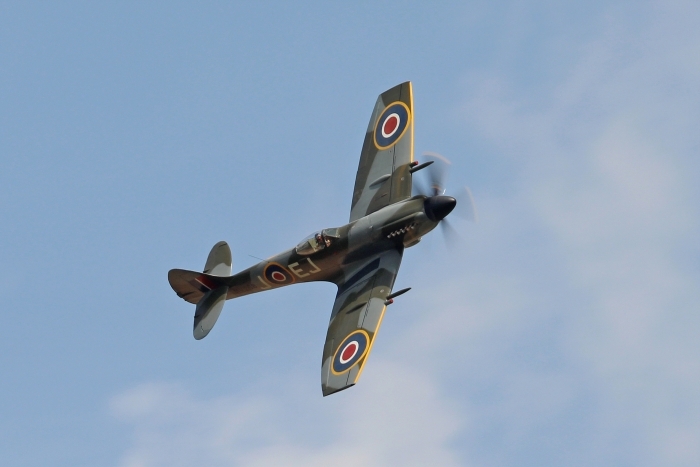 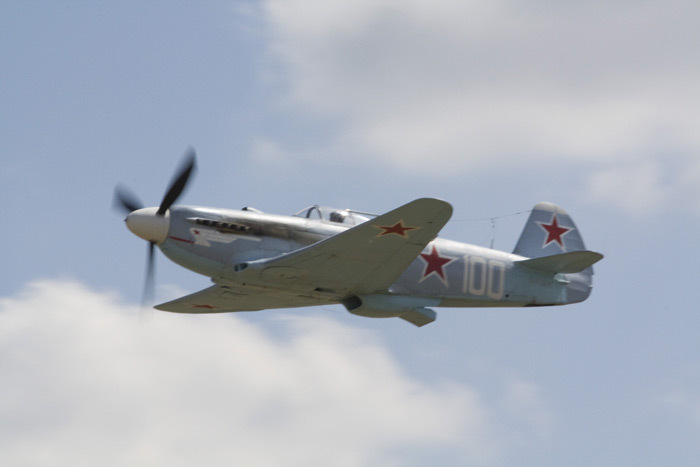 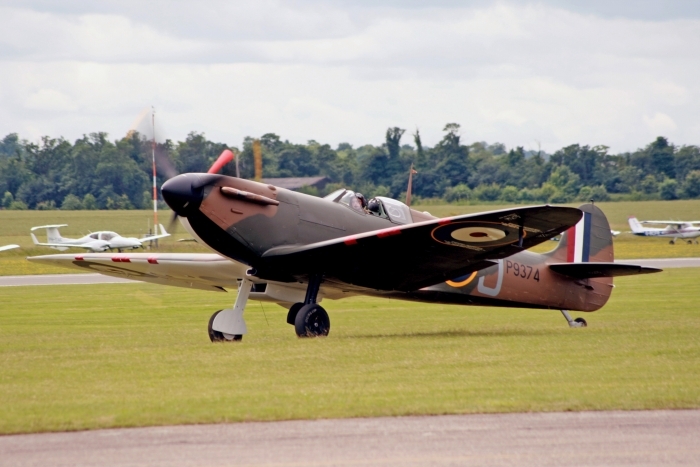 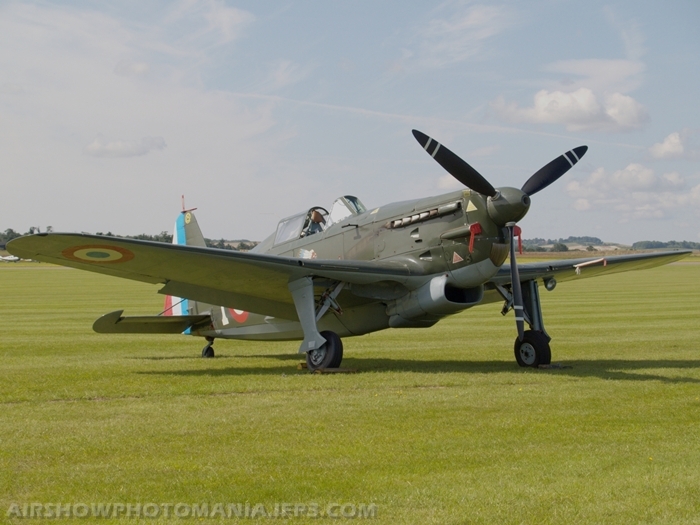 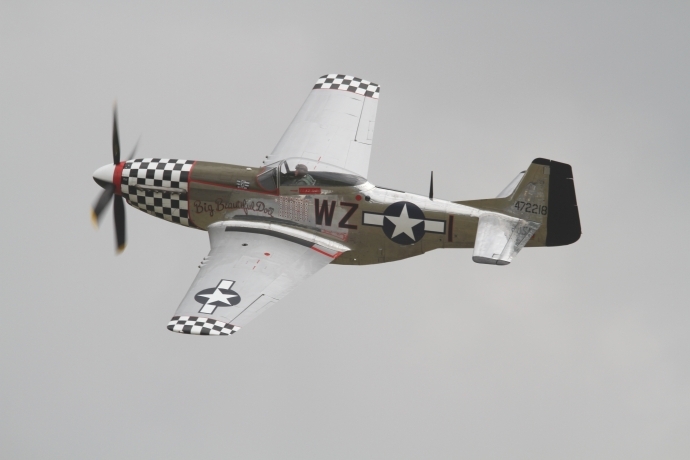 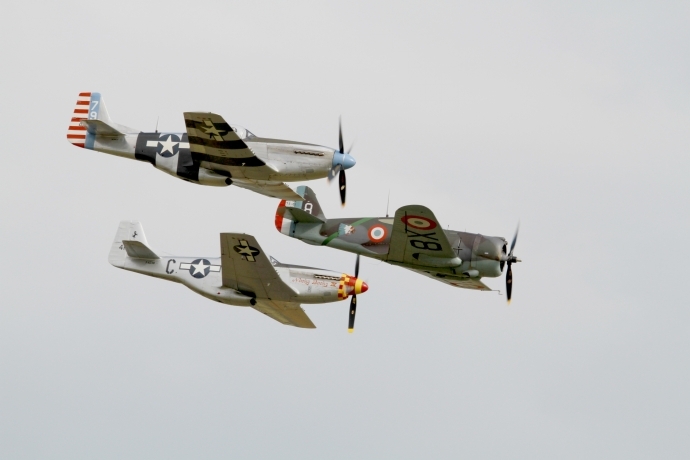 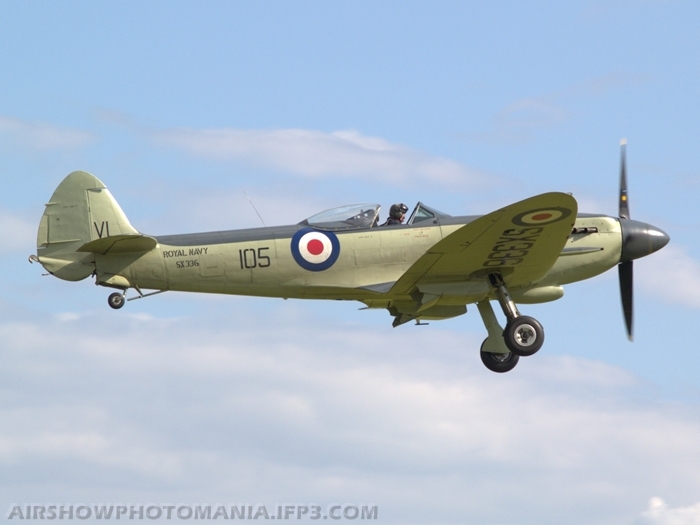 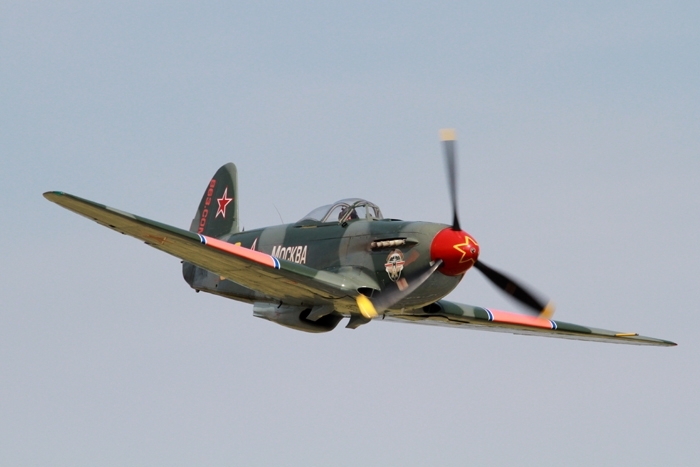 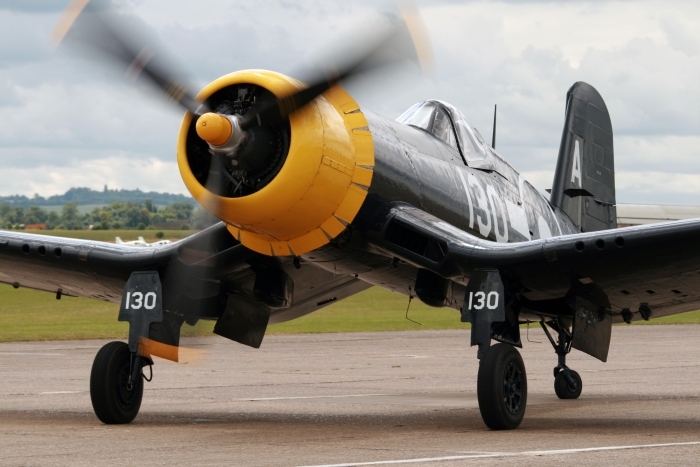 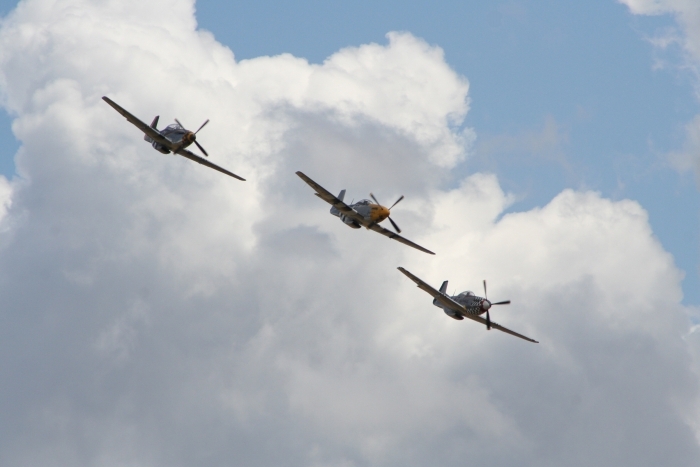 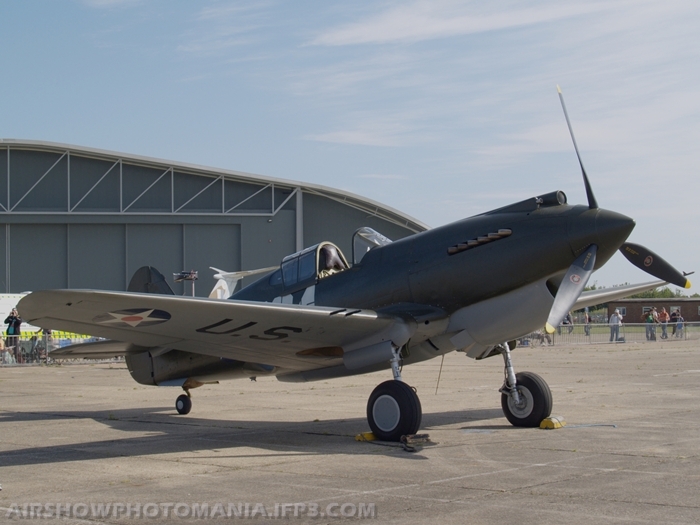 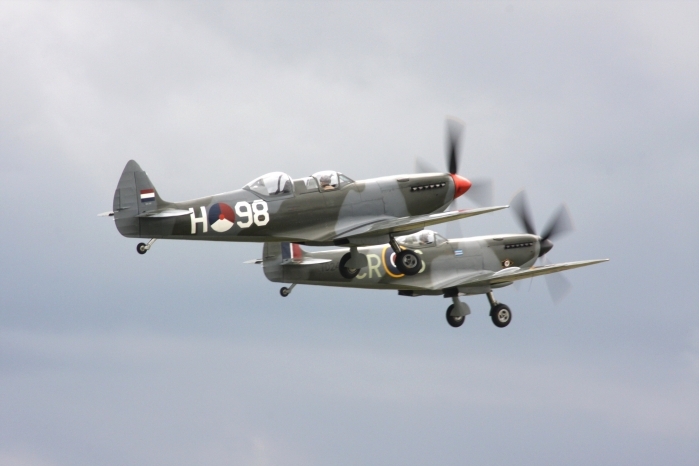 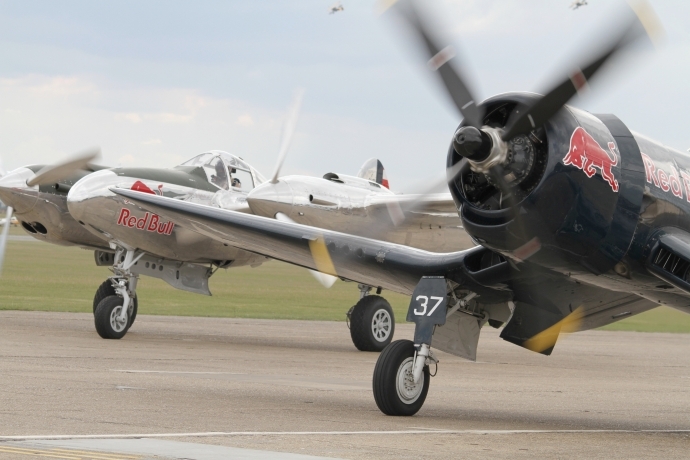 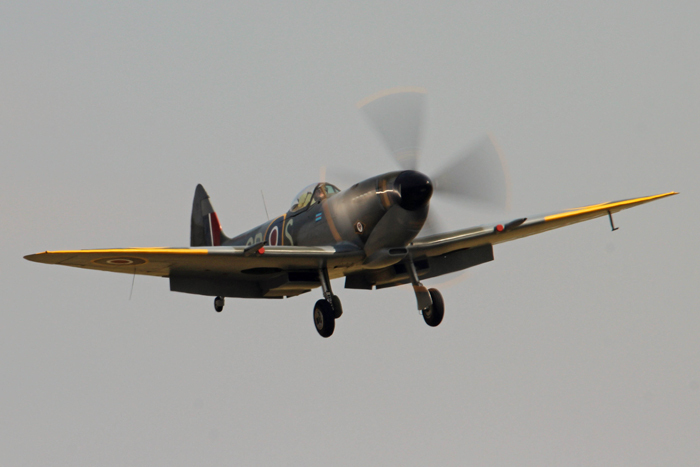 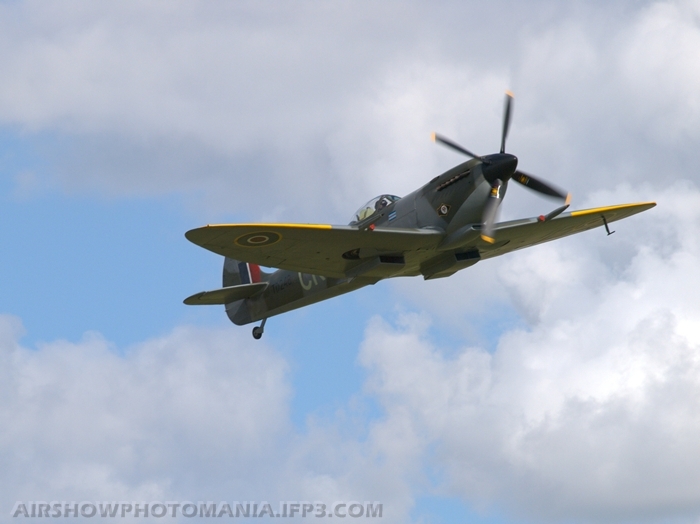 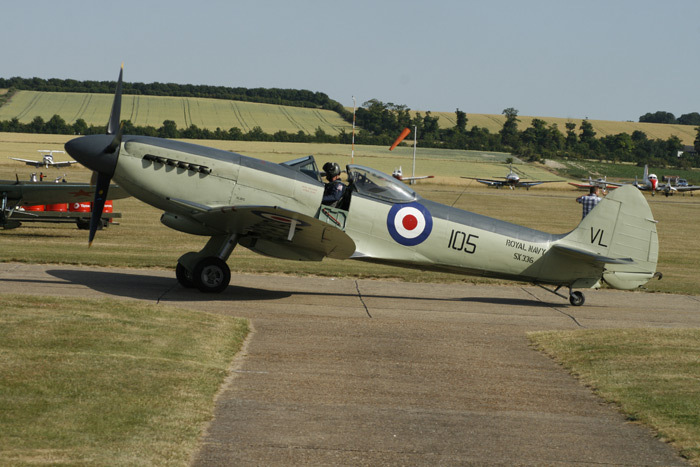 Possibly one of the most interesting and crowd gathering events in the UK, Duxford's Flying Legends features a plethora of impressive classic American and European aircraft such as the Hawker Hurricane, P-51 Mustang and Supermarine Spitfire to name just a few. 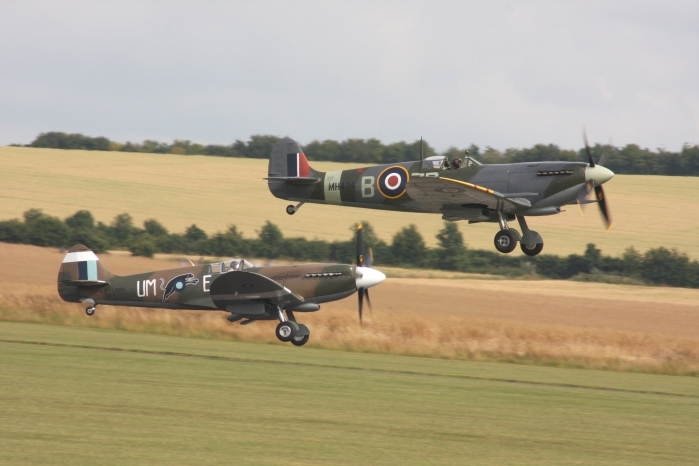 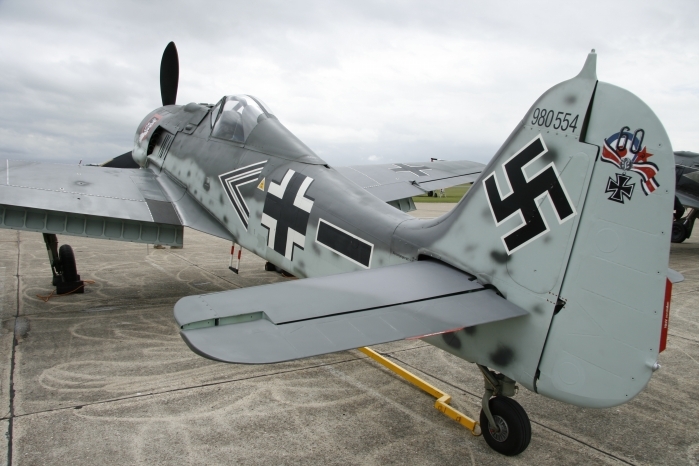 The atmosphere and nostalgia of Flying Legends are intensified even more so by the historic value of the Duxford Aerodrome and the events that took place upon it during World War II. 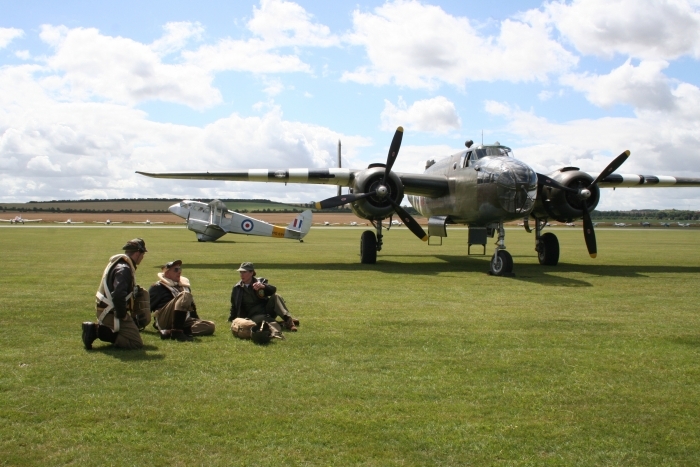 Also you will find specialist traders, Second World War crew re-enactors, flight simulators and much, much more throughout the aerodrome with the added bonus of a walk round Duxford's hangars to view the aircraft and exhibits. 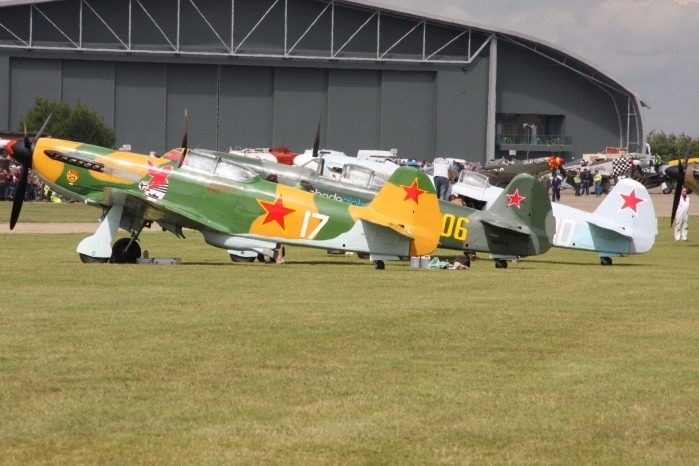 This year’s show was dealt a late blow by severe weather on the near continent. 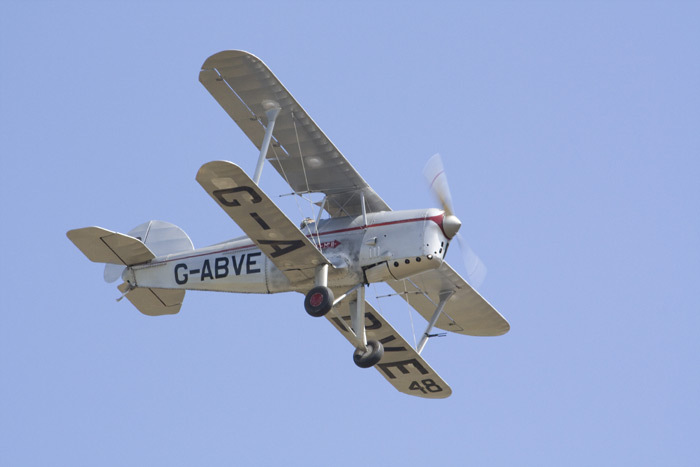 The extent of this was demonstrated by continental weekend visitors at Fowlmere and Cambridge being down 80% from last year. 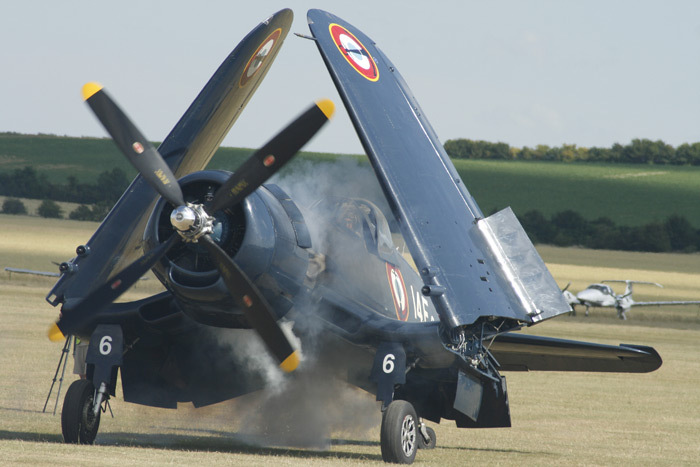 More directly affecting the show was the loss of all but two of the expected participants from Austria, France, Germany and Switzerland. 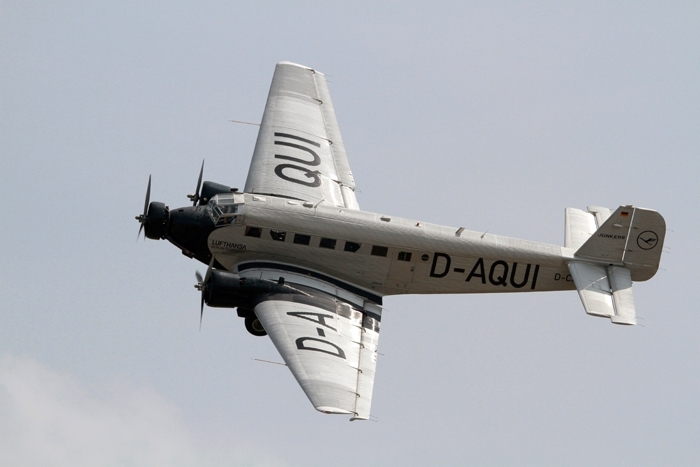 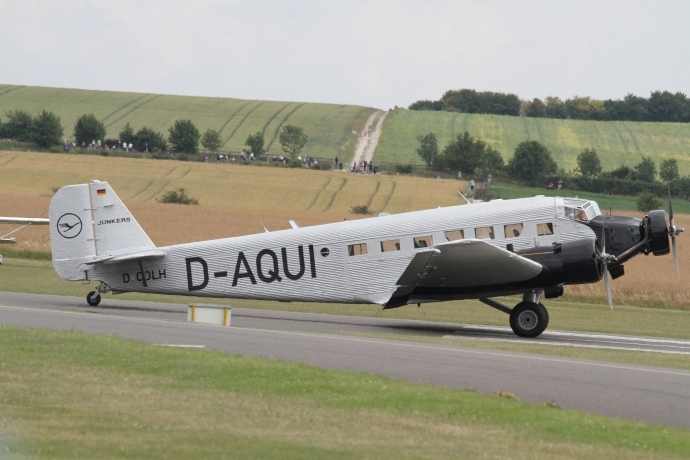 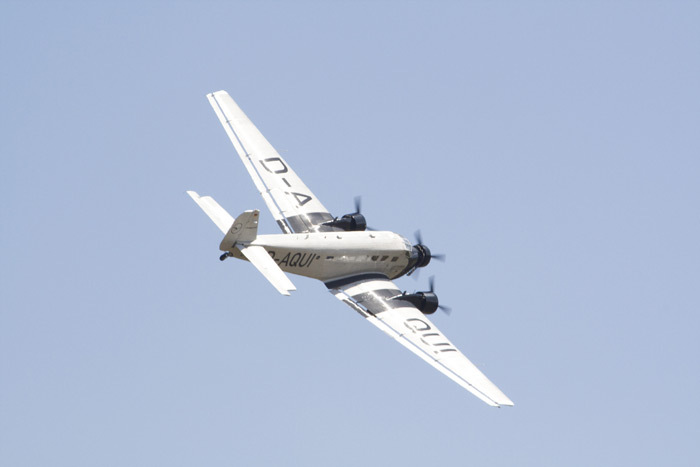 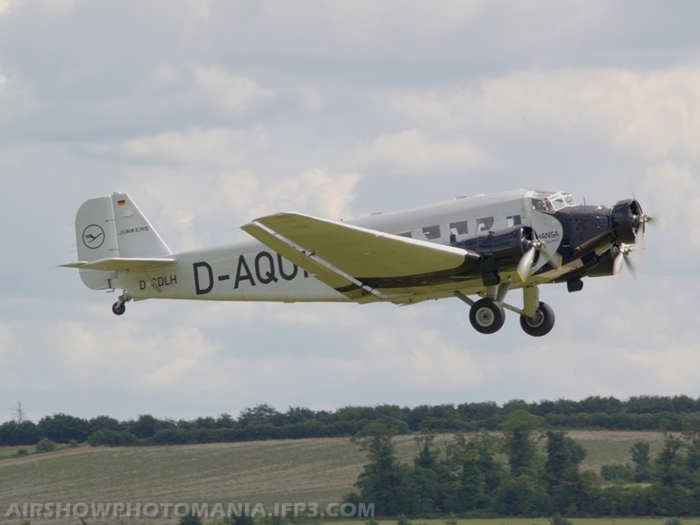 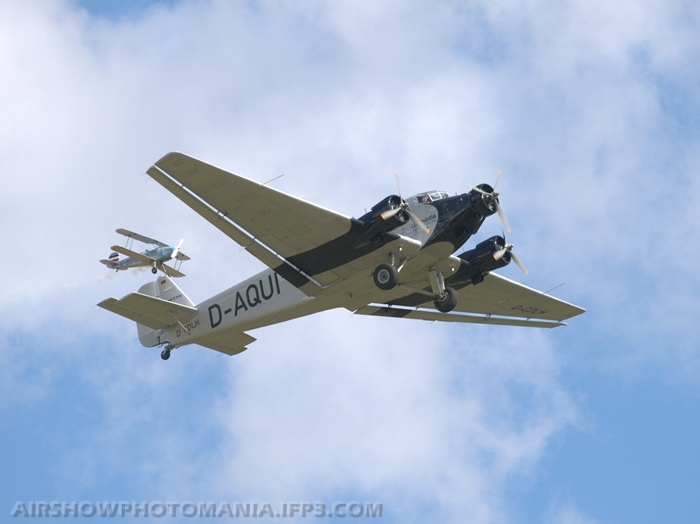 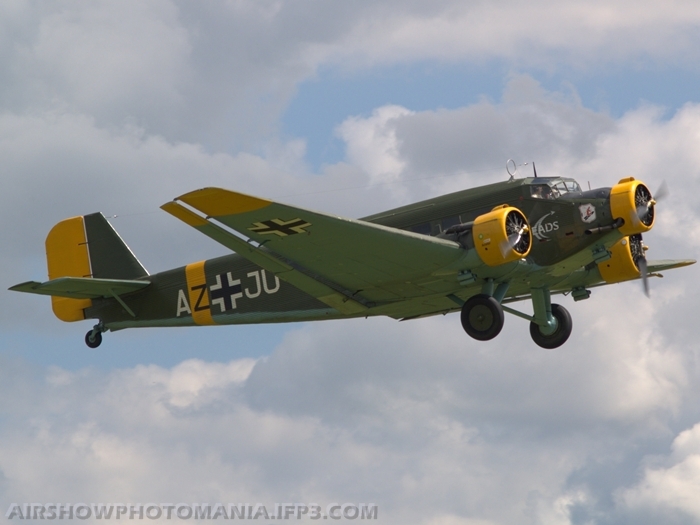 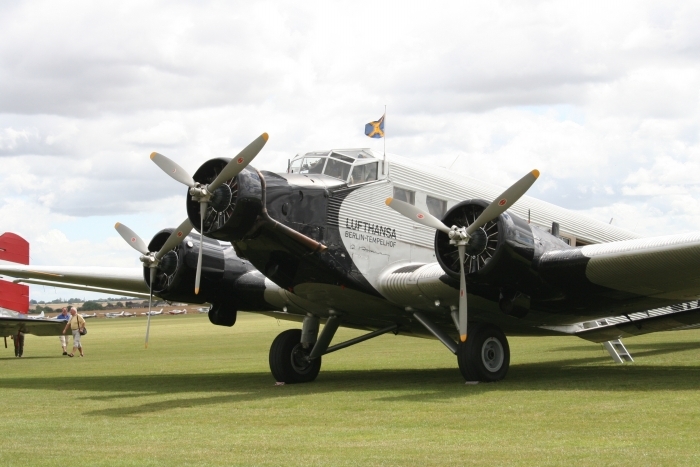 This had a major impact on the planned programme including the loss of both Ju52s. 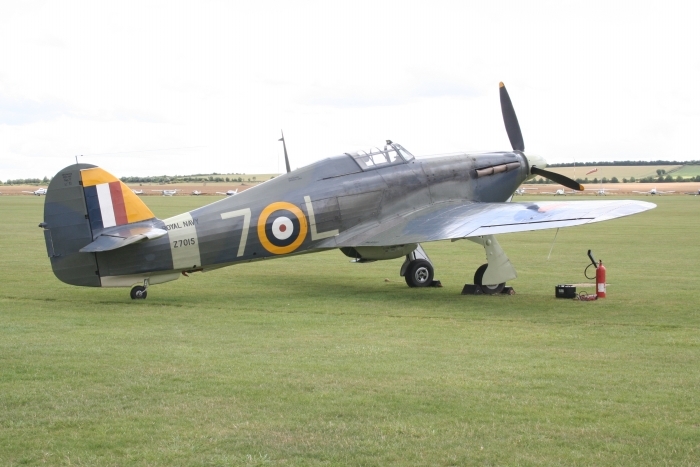 However, as usual, there were the special items that make Flying Legends unique and very high on the “not to be missed” list. 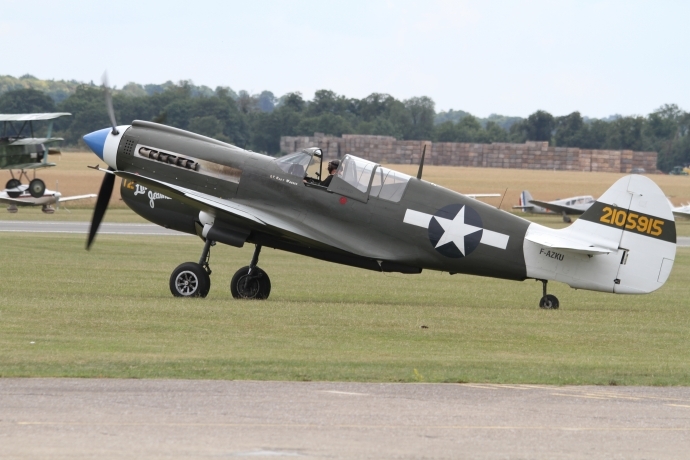 This year’s show saw the debut of the latest resident, the P-40C, in its gleaming natural metal finish. 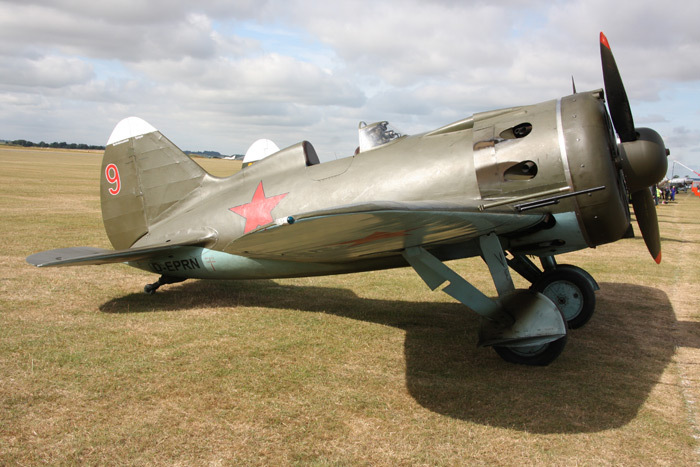 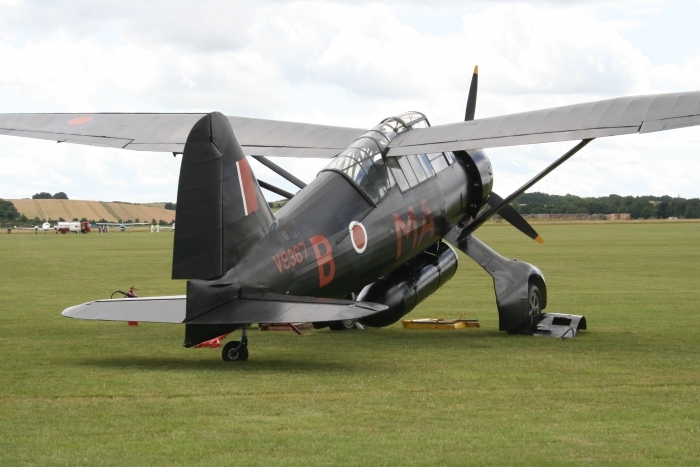 It was given a special place in the static display and later made an interesting contribution to the flying display. 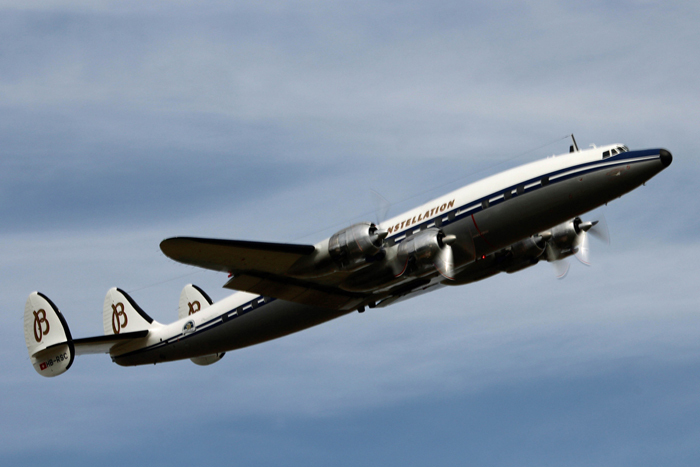 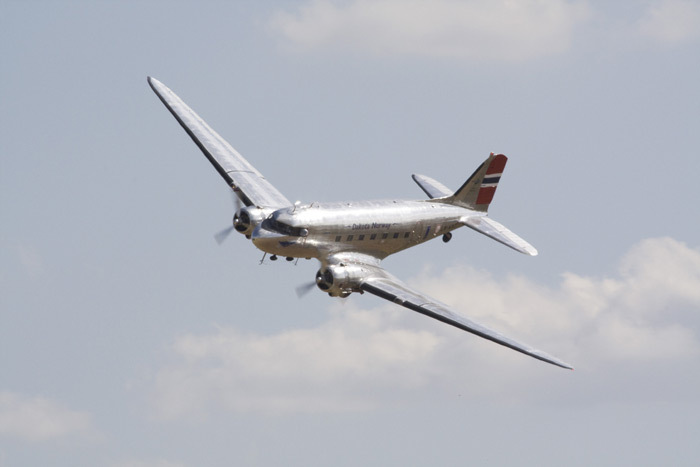 One of the continental contributions to arrive in time for the Saturday display was SFCA’s Lockheed L-1049C Super Constellation; although its inbound flight was delayed by a weather diversion to Farnborough. 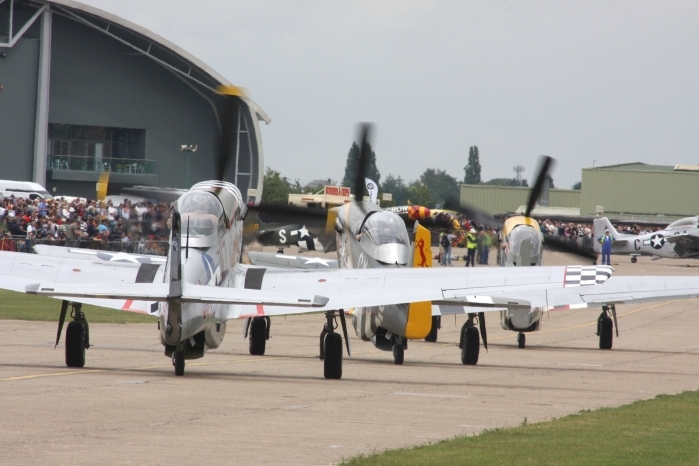 The spectacle of the start of the 4 Wright R-3350 engines was followed by an impressive display by what is probably the largest aircraft ever to perform at Flying Legends. 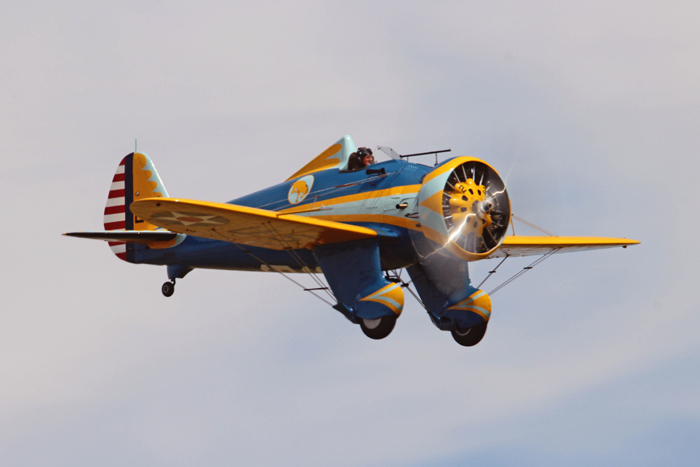 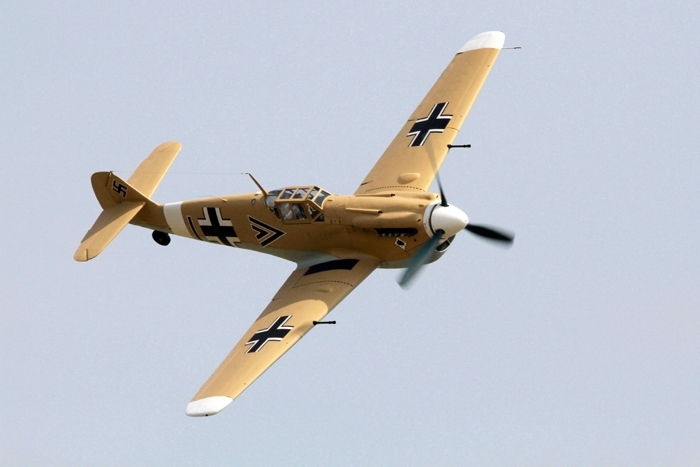 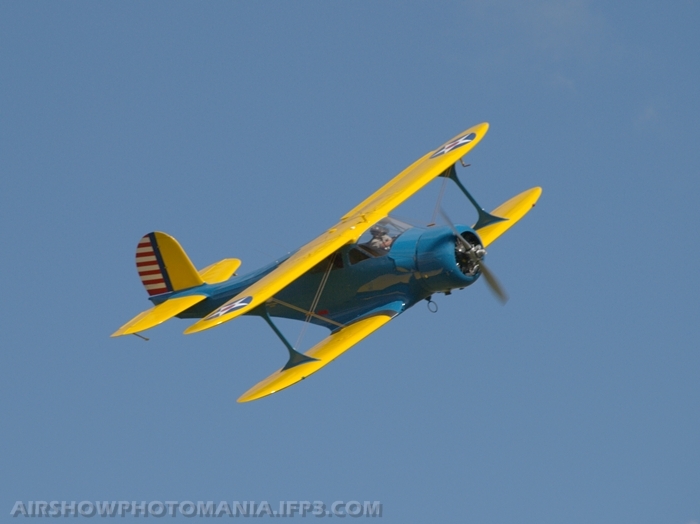 In contrast, the star of the show in many eyes was the world’s only airworthy Boeing P-26A. 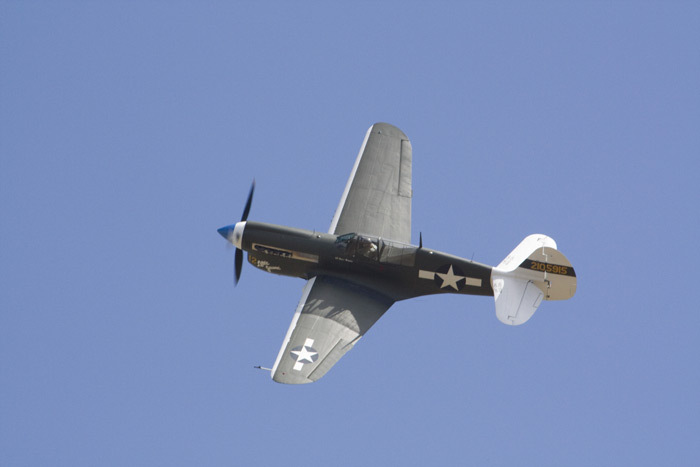 The tiny mid-thirties fighter had been brought to Europe from Planes of Fame at Chino, CA, solely for Flying Legends. 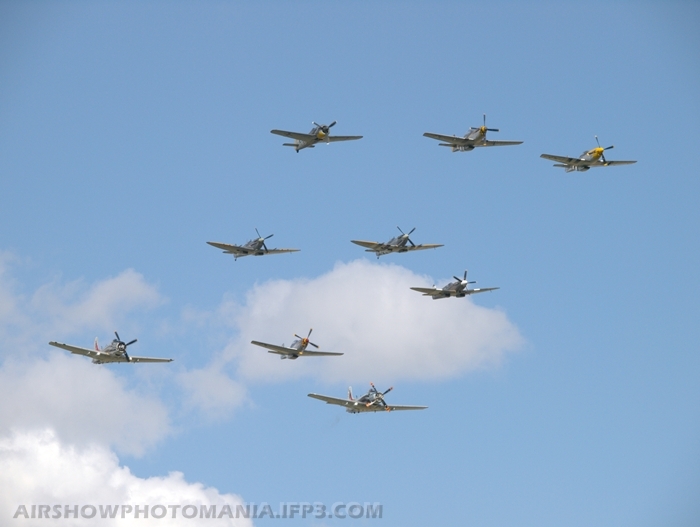 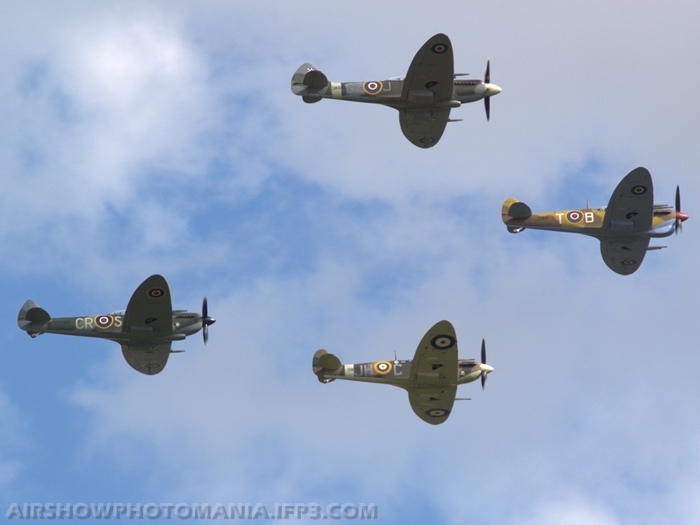 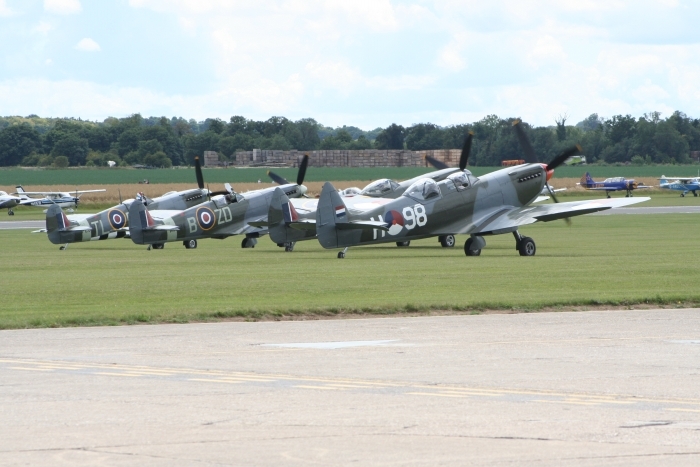 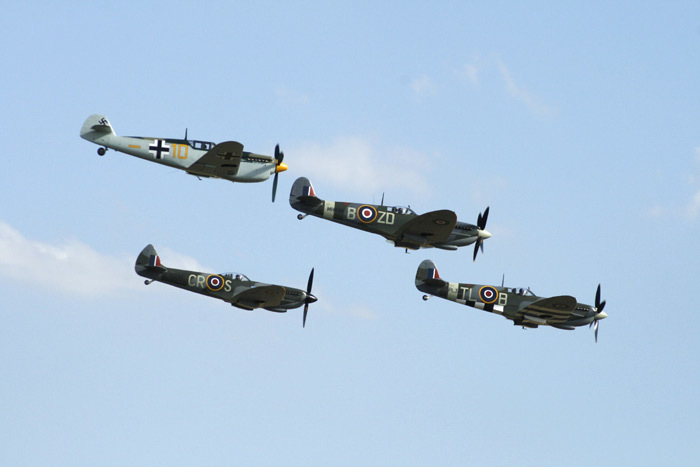 The show opened with a formation of 11 Spitfires led by all 4 airworthy Mk1s; a sight not seen since World War 2. 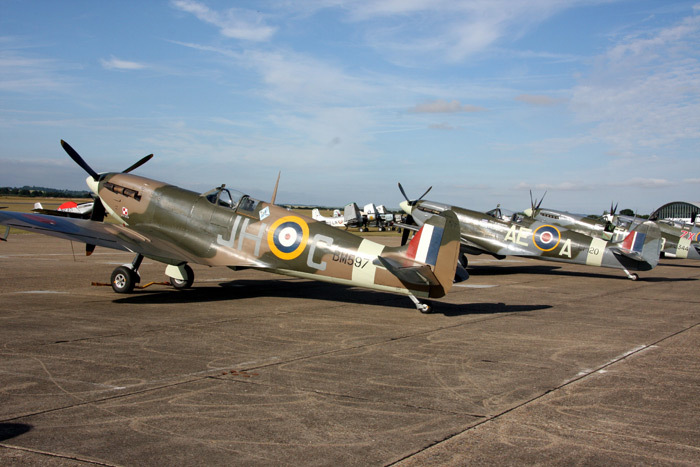 Three Spitfires with D-Day stripes heralded a theme within the show which was followed up in the next item when BBMF Spitfire LFIXe MK356 with stripes accompanied the Lancaster. 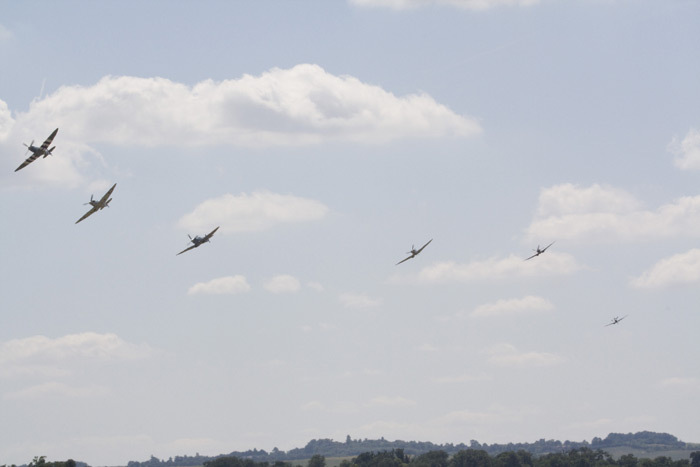 Three Piper cubs then celebrated the contribution of AOP and utility aircraft to the invasion and the subsequent Normandy campaign. 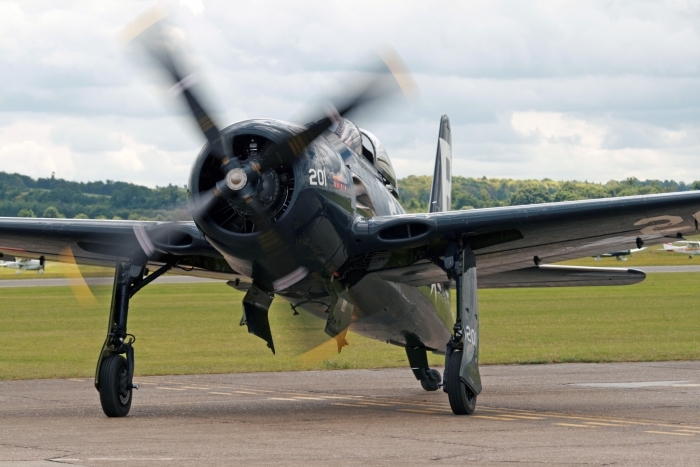 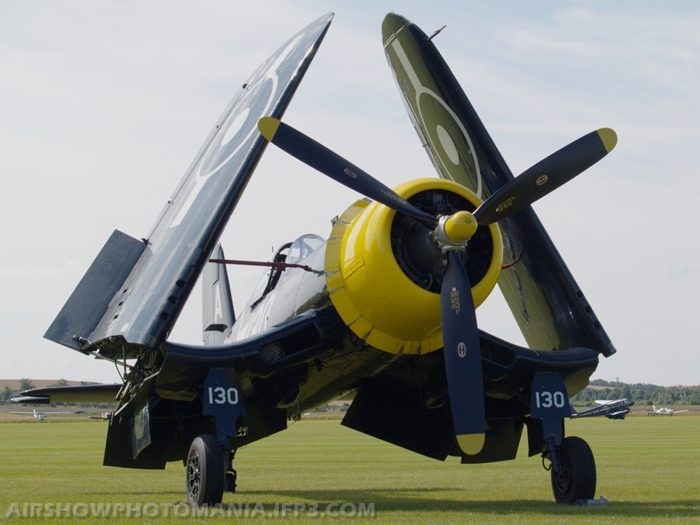 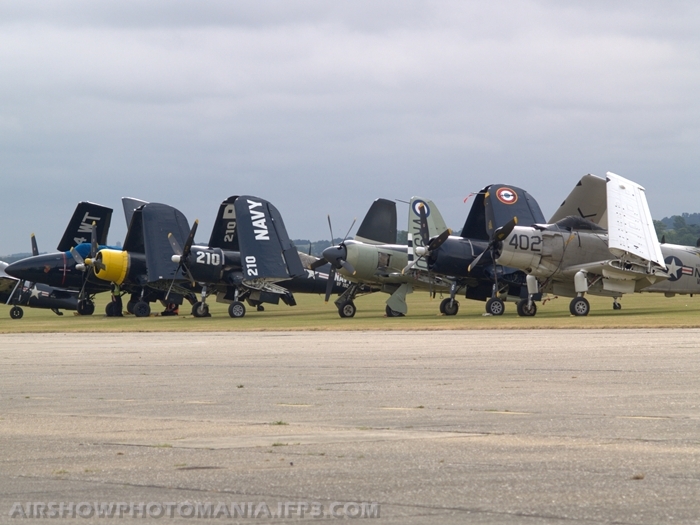 Marking a change in power to large radials were 4 American built naval aircraft, the Wildcat, Hellcat back displaying after 6 years, Bearcat and Corsair. 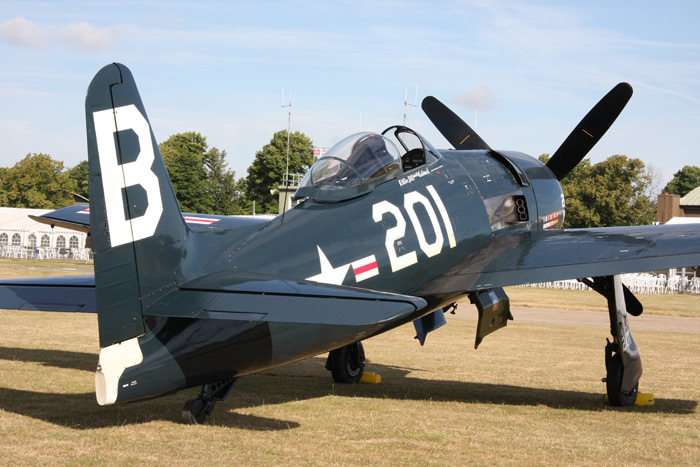 It was not widely known at the time that this show would be the last appearance of the Hellcat which would soon be on its way to the USA. 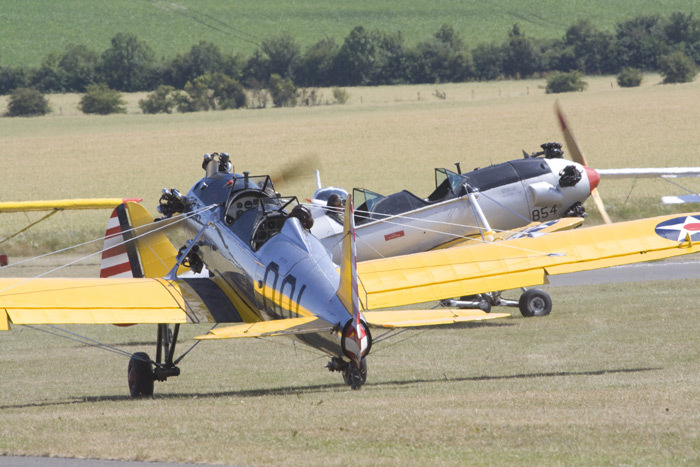 They were followed by the P-26A, a striking sight in its bright blue and yellow colours; demonstrating “a missing link” between braced wings and metal monoplanes that is not represented in Europe’s warbird population. 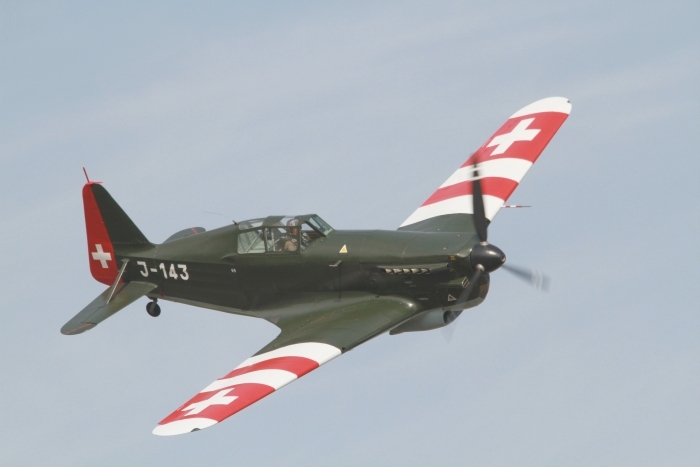 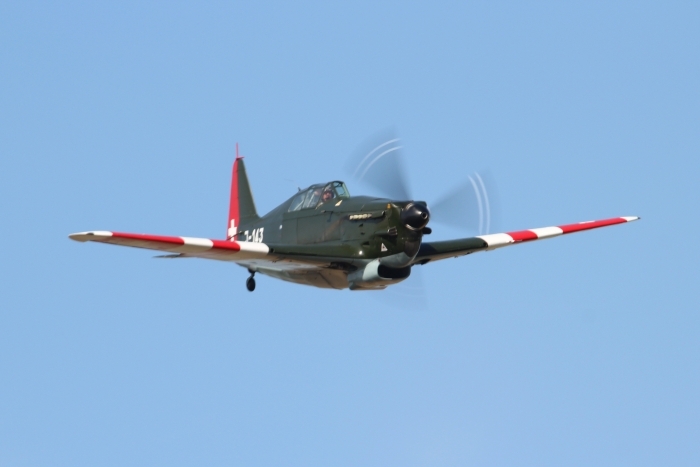 Following the P-26A, both in the air and historically, and Illustrating 3 distinct phases of the development of the Curtiss Hawk family, were the Hawk 75, P-40C and the P-40F. 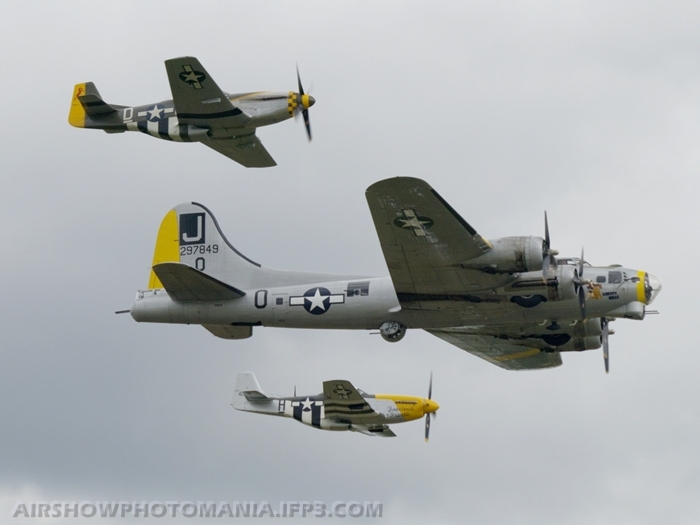 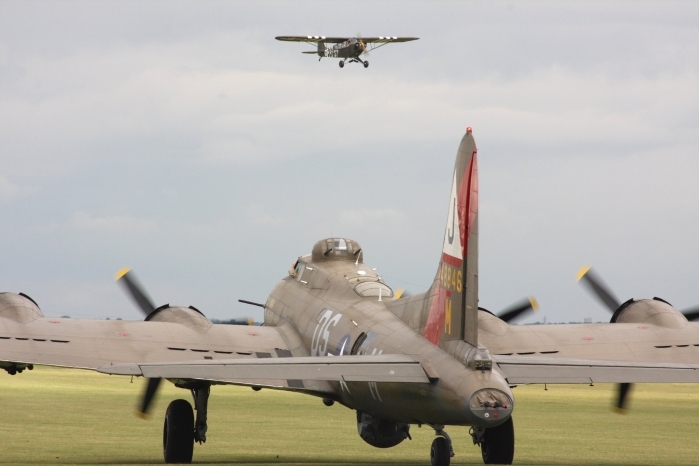 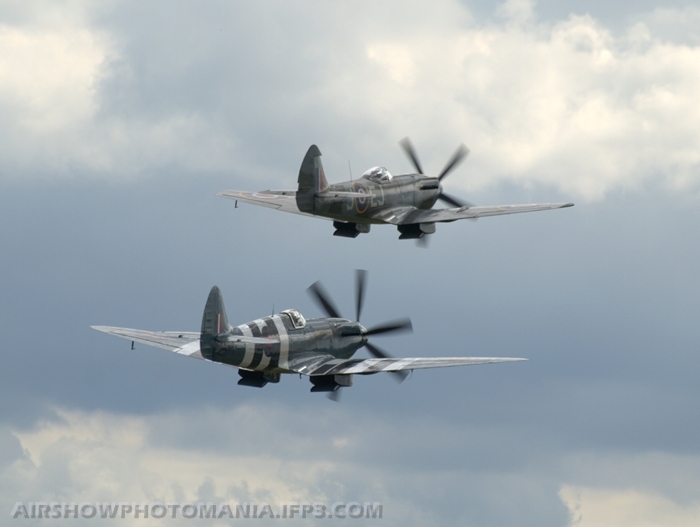 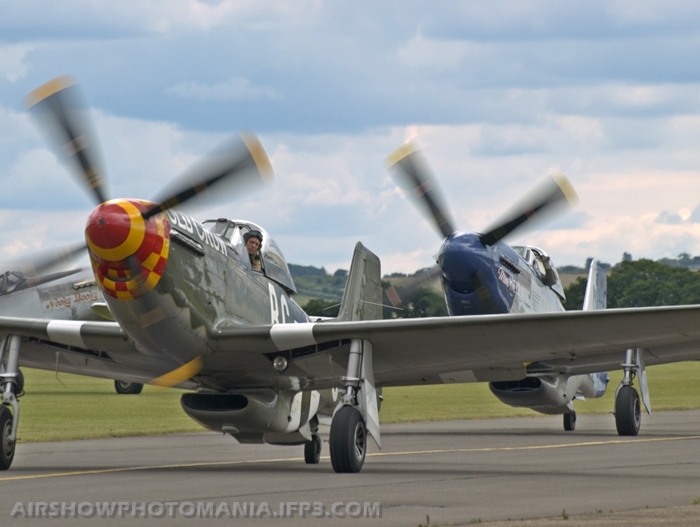 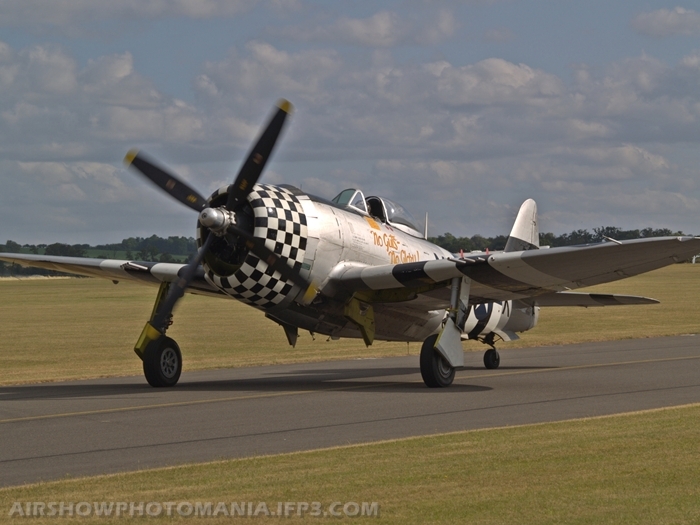 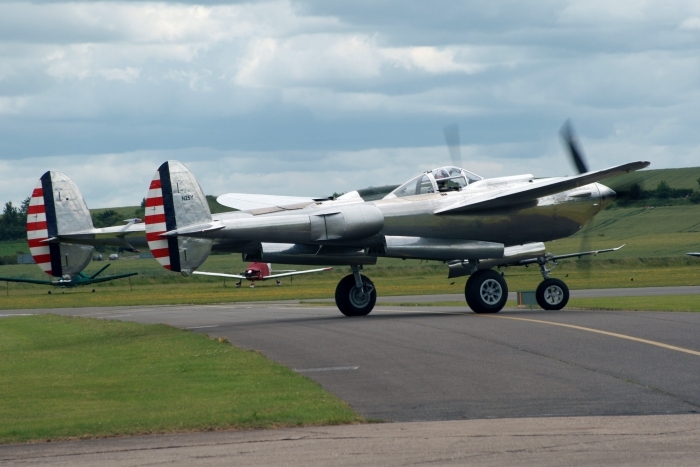 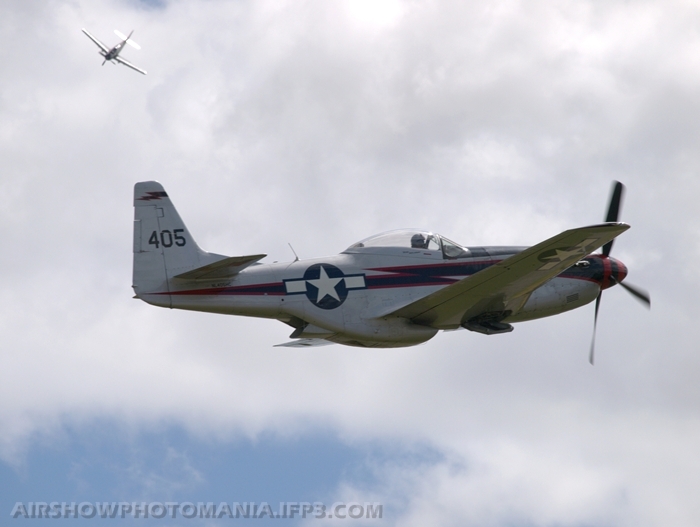 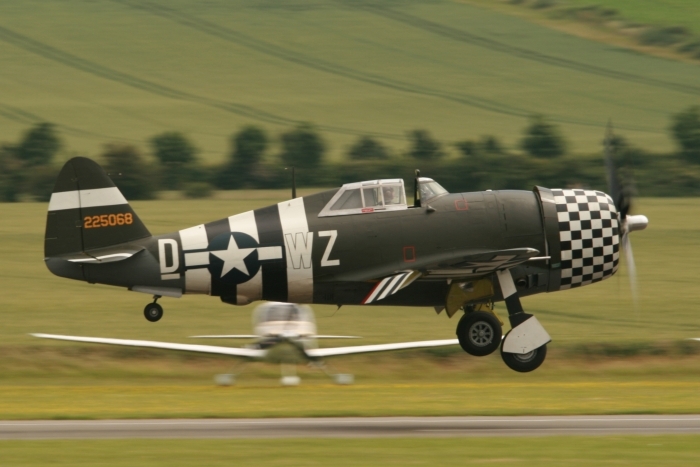 A pair of Mustangs contributed to the next 2 items, firstly tail-chasing with a pair of Buchons before playing the role of Sally B’s “little friends”. 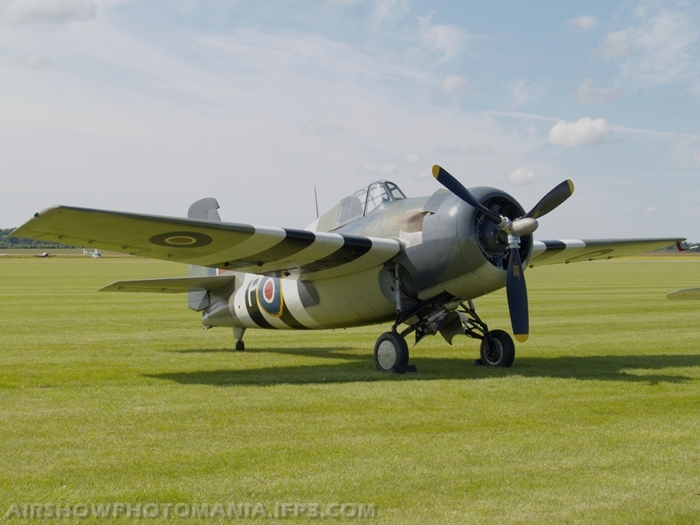 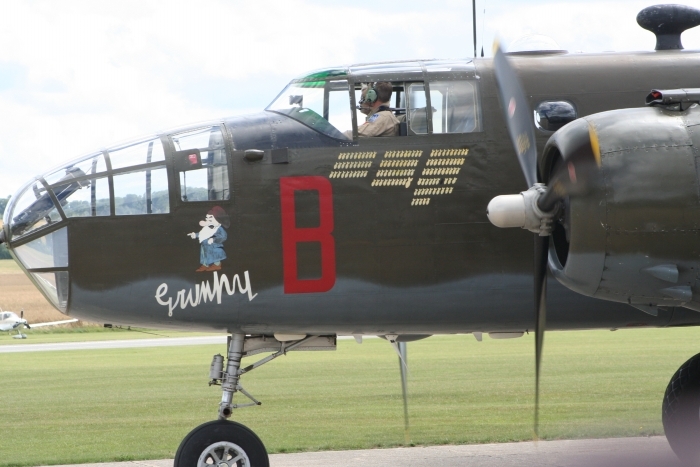 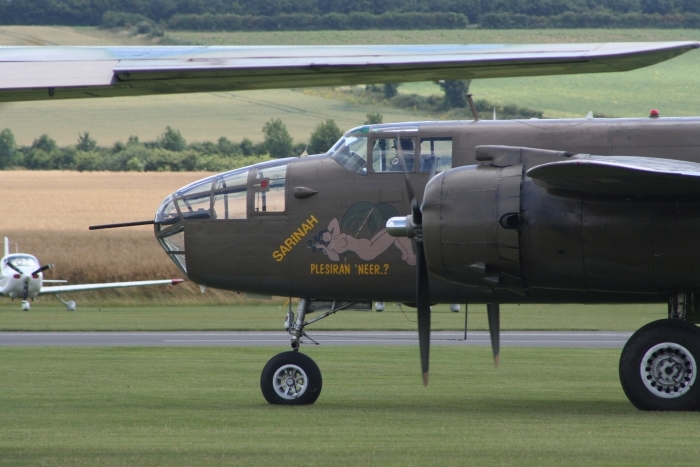 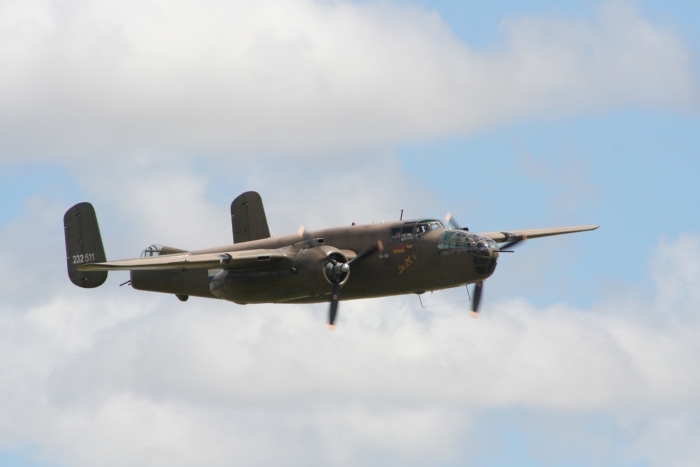 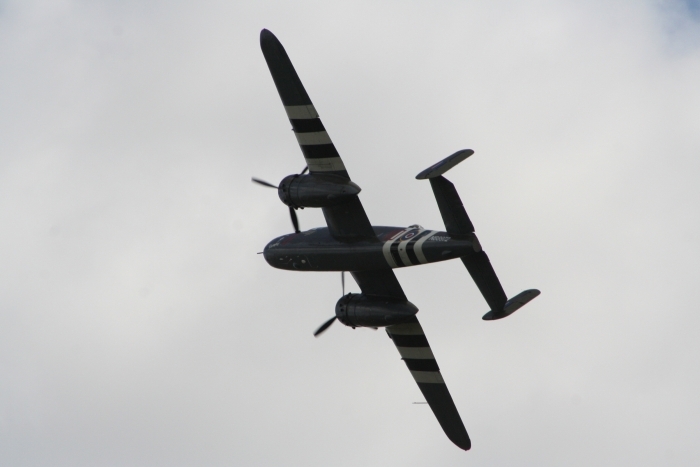 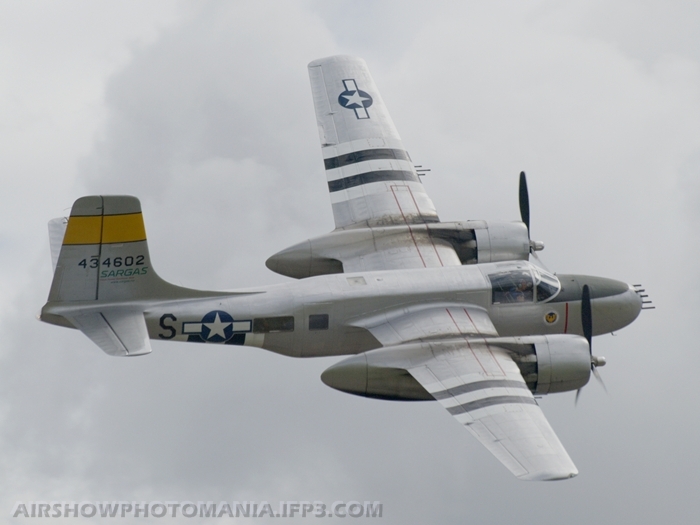 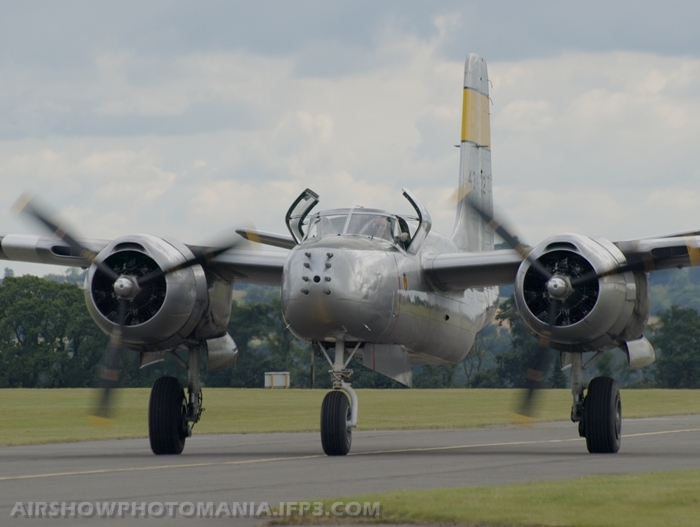 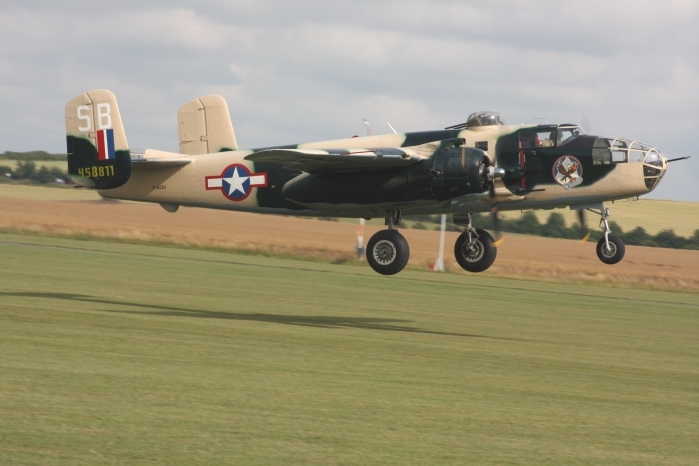 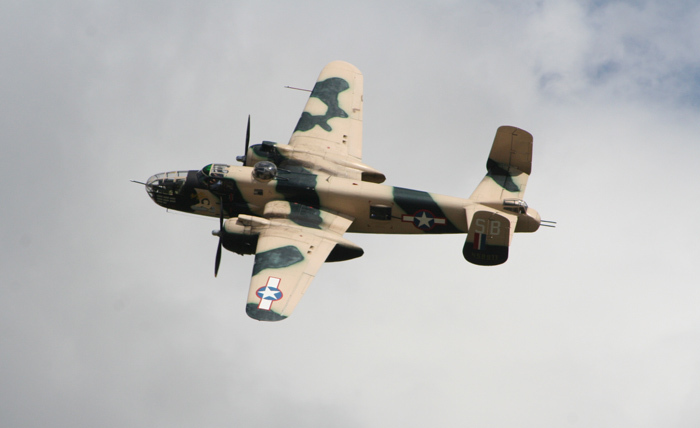 The latter was followed by the immaculate highly polished Flying Bulls’ B-25J Mitchell. 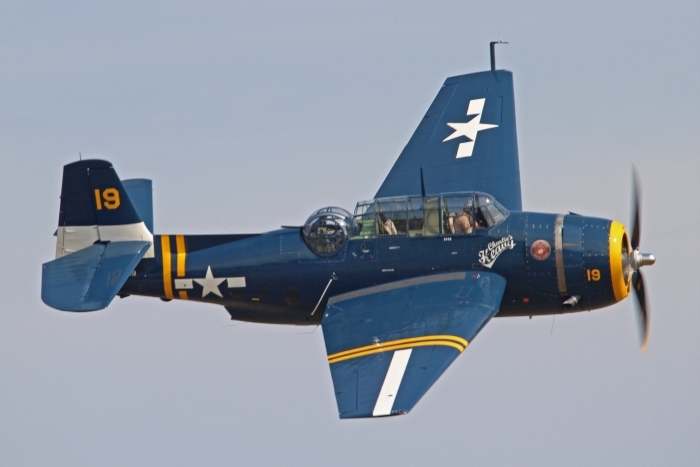 Returning to British aircraft were 3 contemporaries of the P-26. 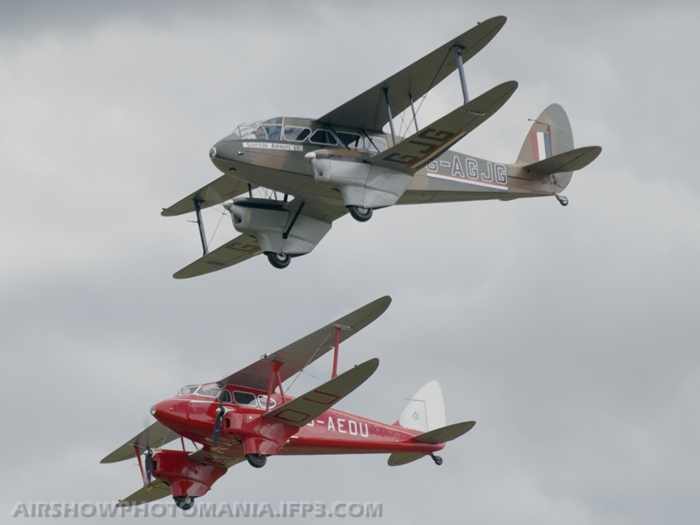 The Nimrod 1 and two Gladiators, the latter carrying the colours of 72 Sqn and 73 Sqn. 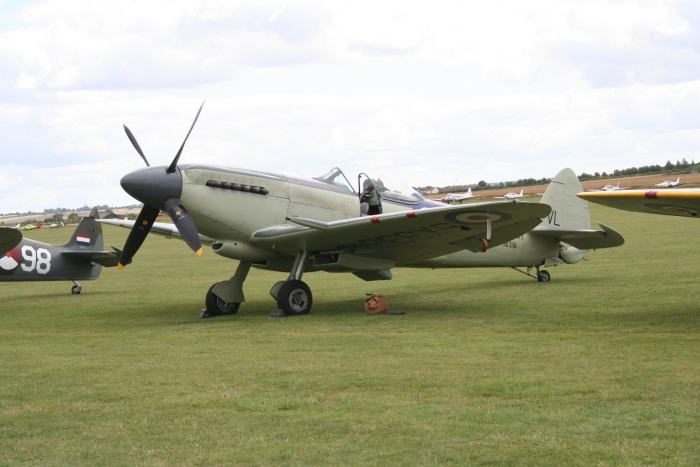 While these aircraft were completing their display Hurricane IIA P3351 arrived having escaped the weather but too late to display on Saturday. 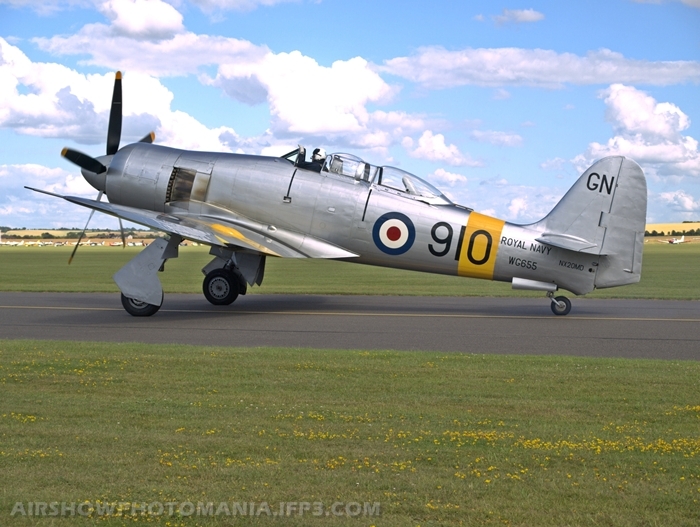 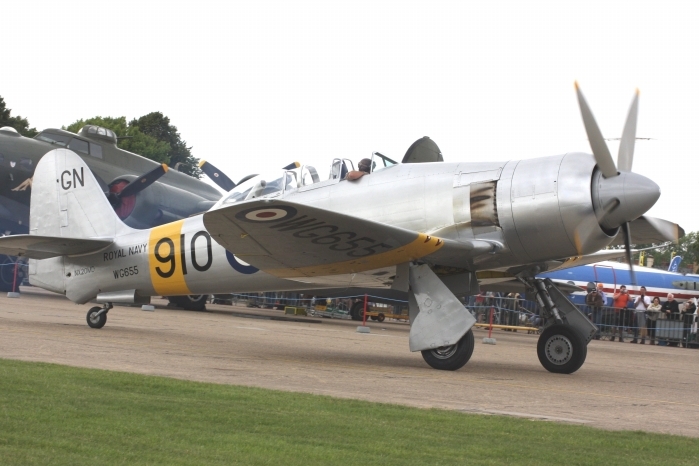 Next the final member of Hawker piston-engined fighter family was represented by the RNHF Sea Fury T20 VX281 which was sadly to be damaged during the Culdrose Air Show less than three weeks later. 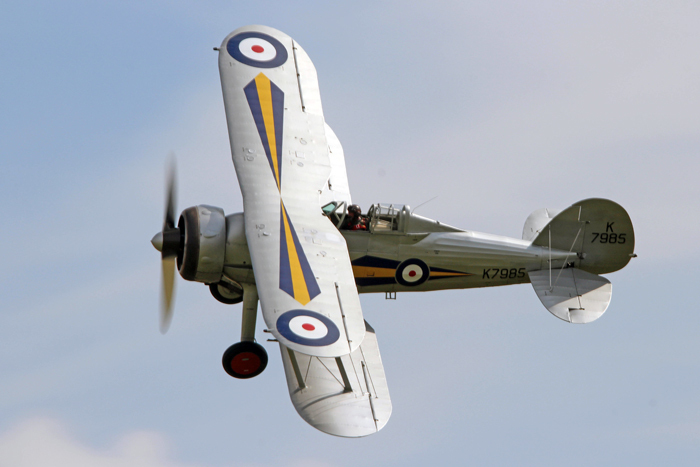 In contrast to the power of the Sea Fury, Anna Walker gave her usual graceful performance in the Jungmann. 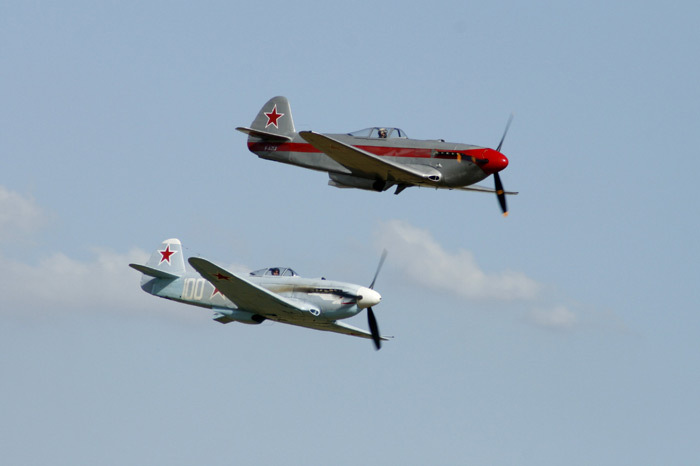 The last individual items in the show were two airliners with military pedigrees. 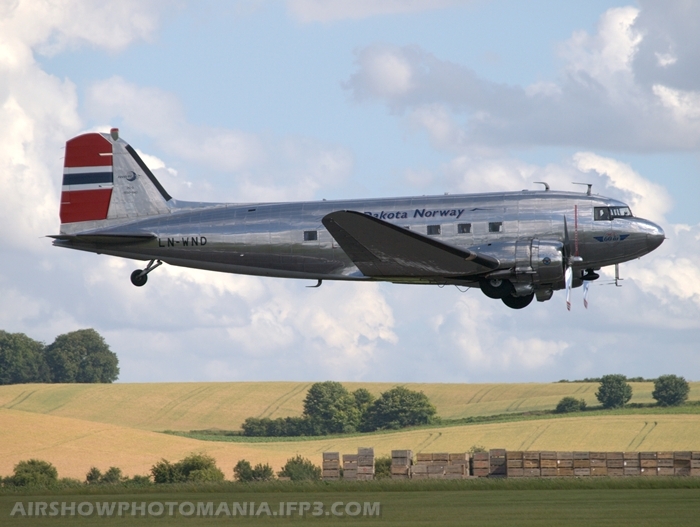 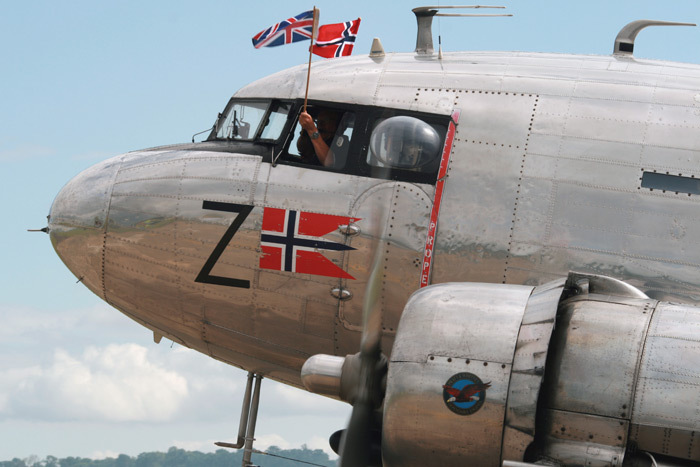 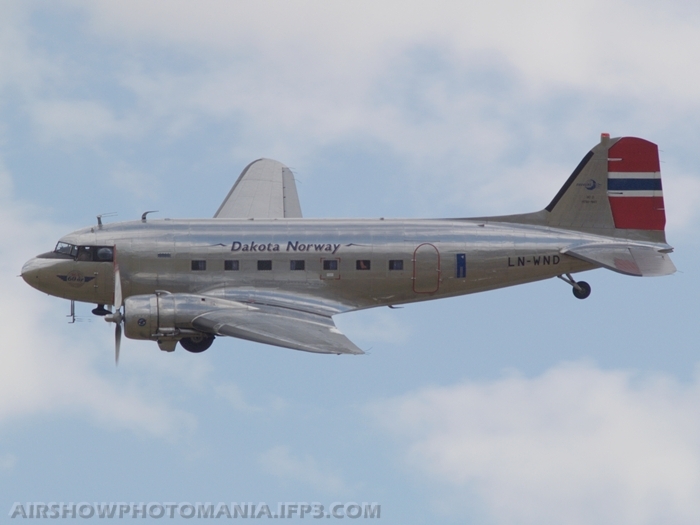 The Super Constellation (built as a C-121C) was followed by the Norwegian C-53D giving its usual spirited performance. 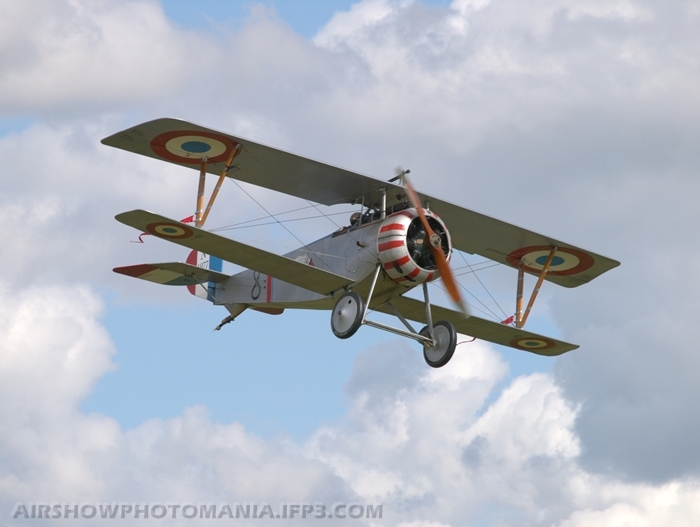 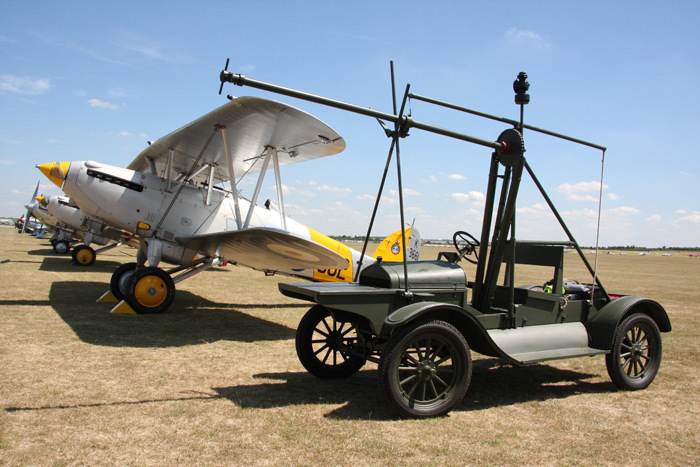 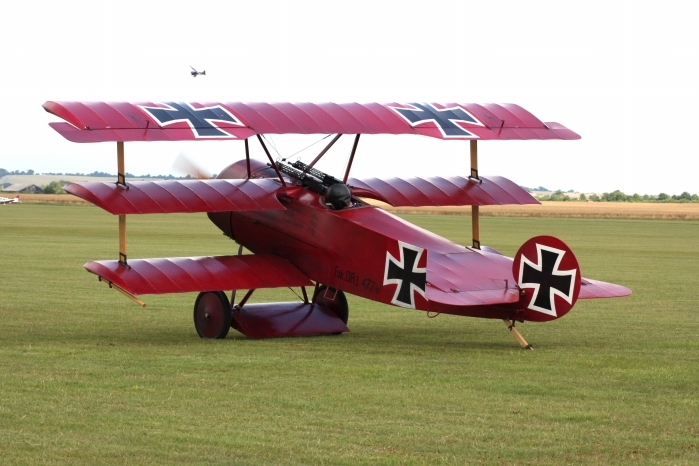 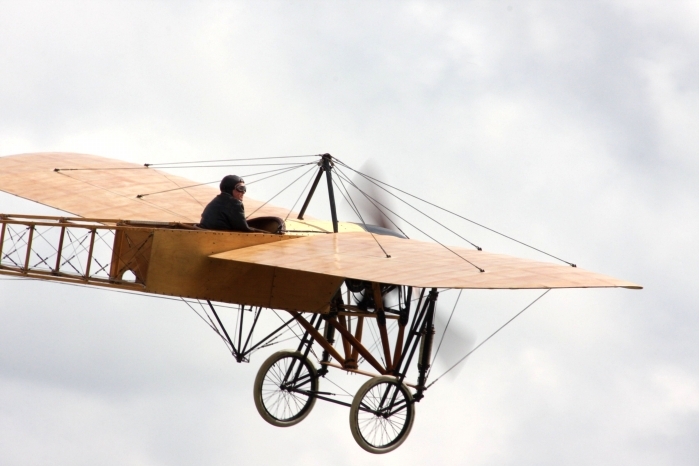 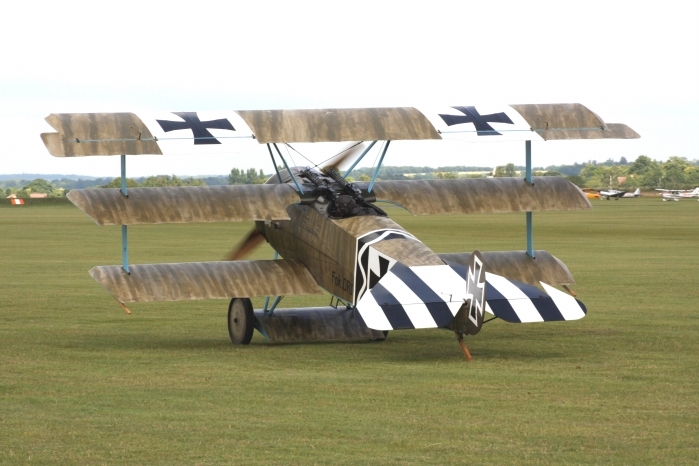 While the Balbo was forming, the traditional Joker display was flown by Nick Grey in the Gladiator II. 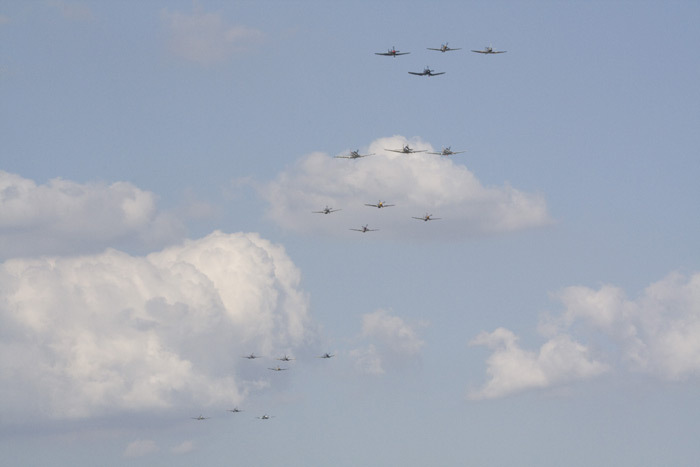 The Balbo itself was somewhat thin, with only 18 participants, but still provided a fitting finale to a show the highlights of which will remain in the memory for a long time. 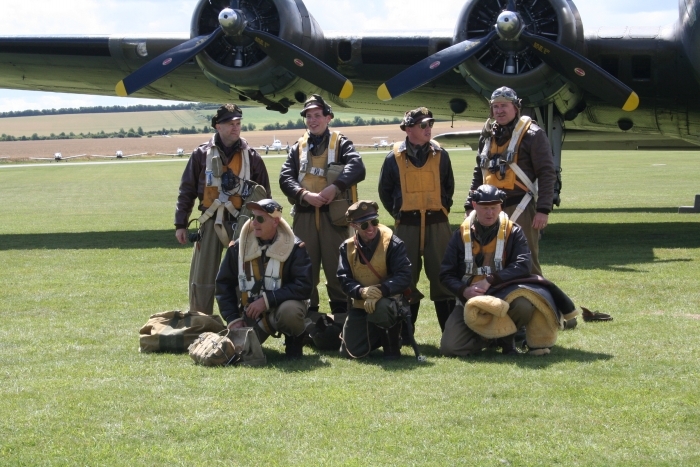 Well done to the Flying Legends team for delivering an excellent show in the face of severe challenges. 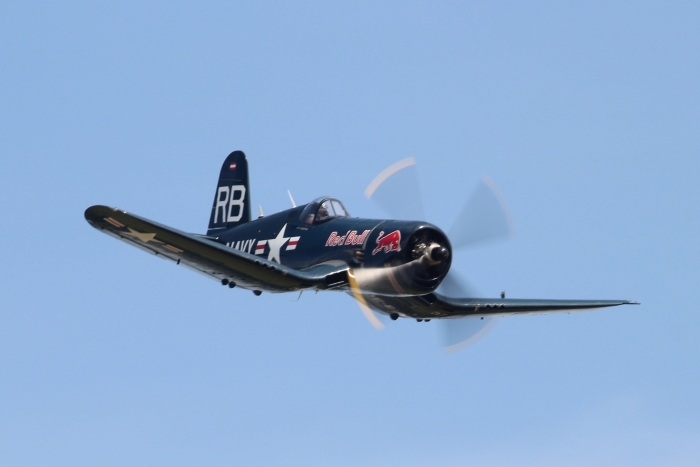 The two-day event was blessed with some superb weather conditions with temperatures getting up to the high eighties. 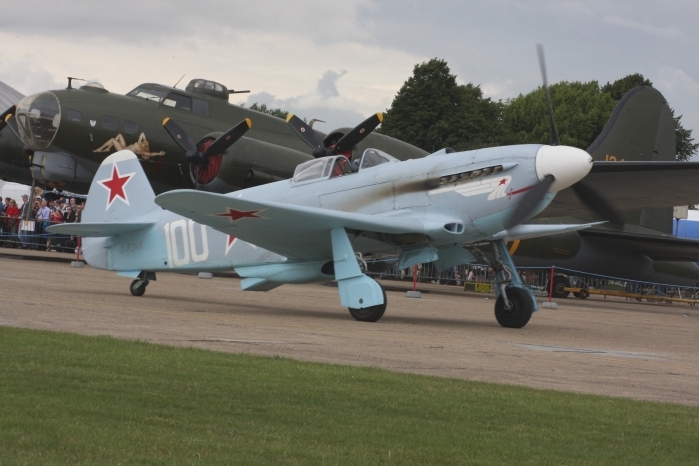 As with previous shows it was nonstop action at Legends from the start of the show until the last aircraft has landed from the Balbo. 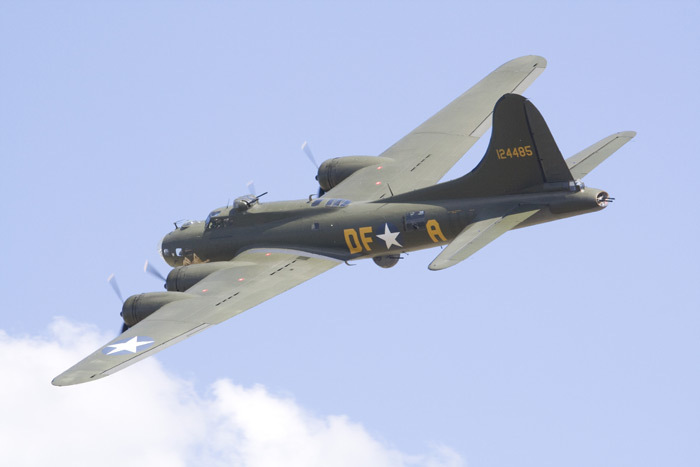 The largest aircraft at Legends included B-17 Sally B, The Battle of Britain Flight's Lancaster, Junkers Ju-52 and a DC-3. 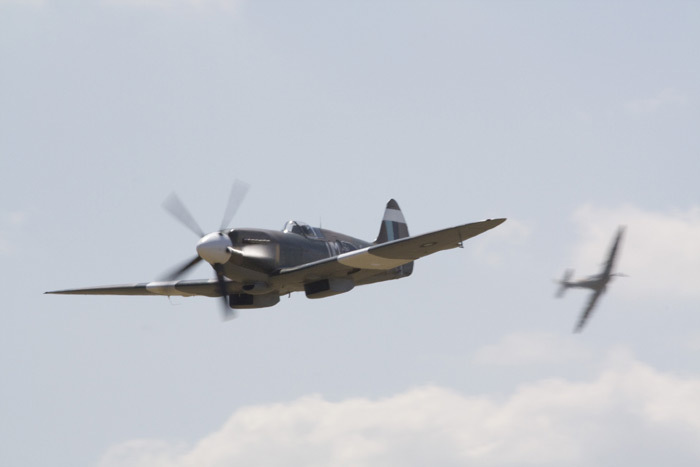 Undoubtedly the highlight of the event was the return of the Bremont Horsemen Flight Team, performing its worldwide debut Spitfire display flying a trio of Supermarine Spitfires. 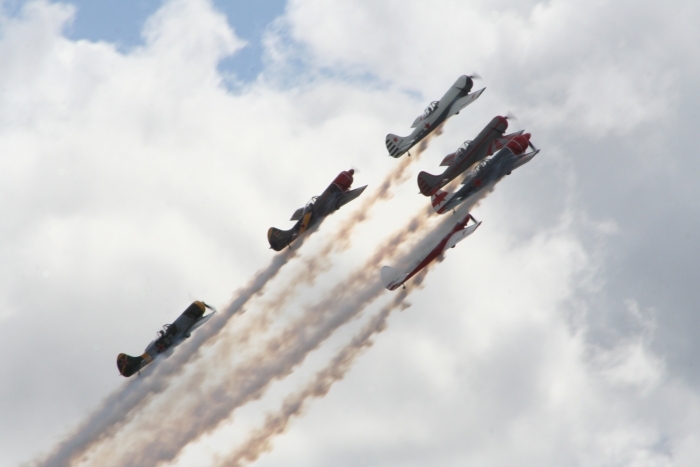 Something a little different was the Aerostars Display Team flying their six Yak-50 aircraft, as usual treating the crowds to a polished display of formation flying and aerobatics. 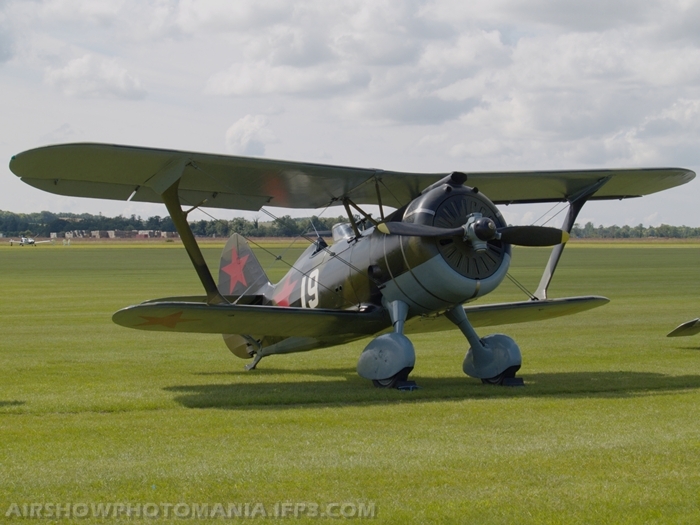 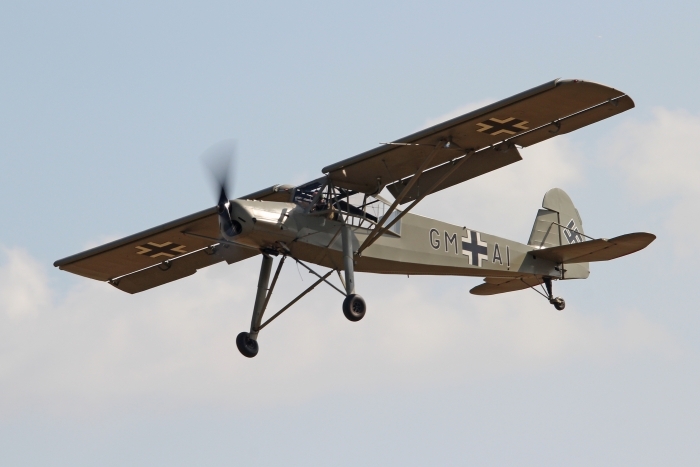 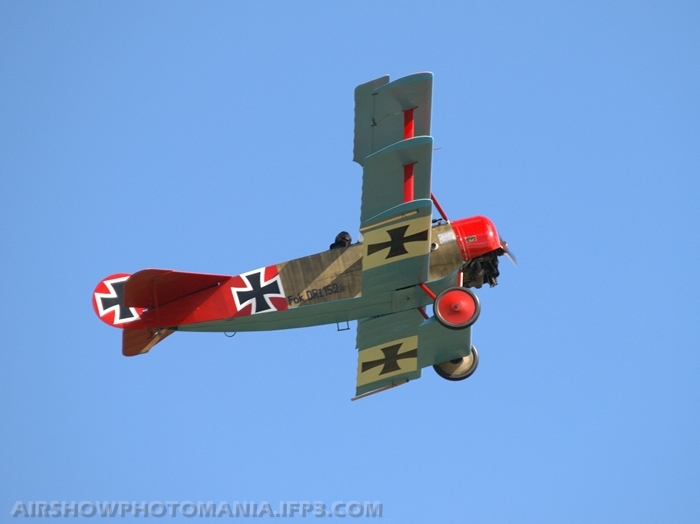 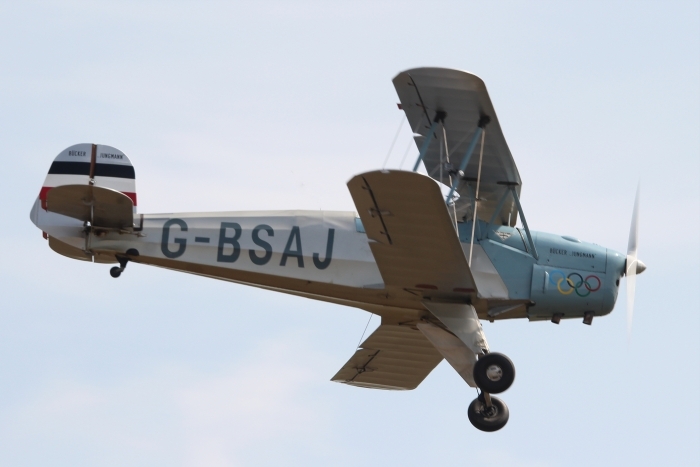 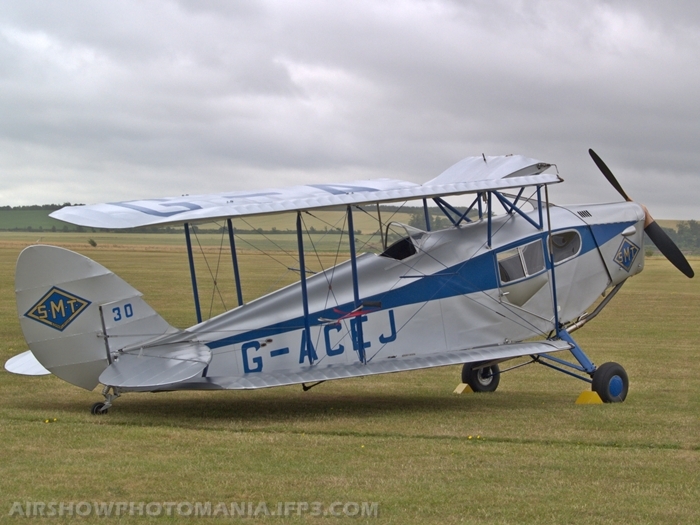 Also another Duxford regular was the Bucker Jungmann with a series of well coordinated aerobatics. 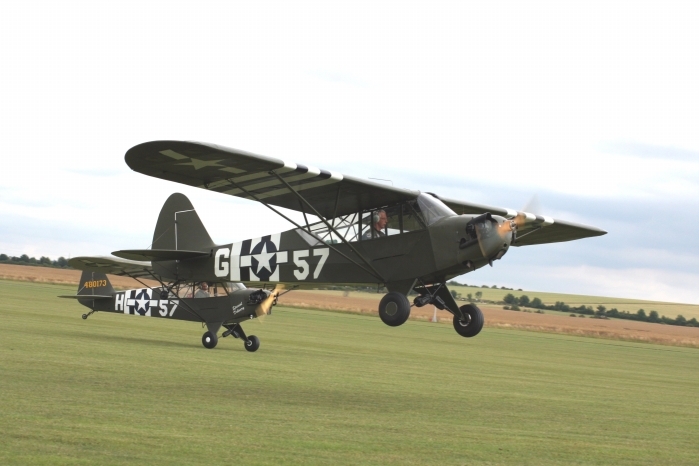 Over from Old Warden were the Storch and Lysander, and finally the L-4 Cubs demonstrating their low speed manoeuvrability. 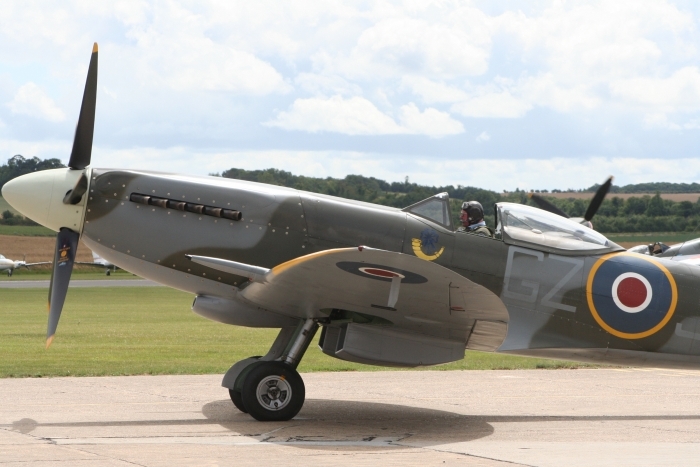 Throughout the weekend Duxford was treated to mostly a fast moving programme, including numerous Spitfire and Mustang aircraft with the added bonus of the Sea Fury, Hurricane, P-47 Thunderbolt and various other classic aircraft. 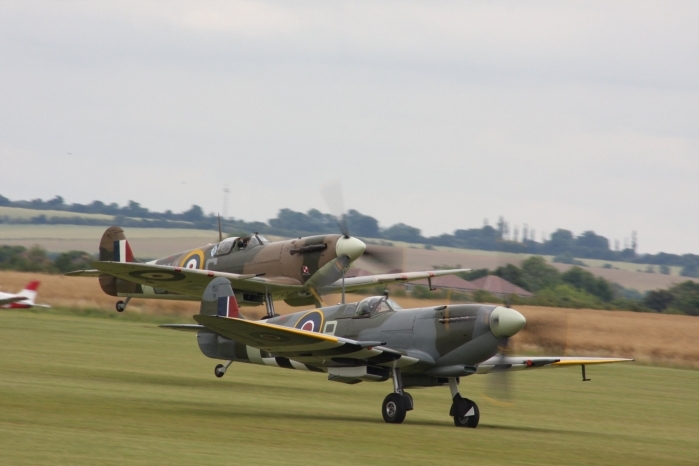 A thoroughly enjoyable weekend and a credit to Stephen Grey and his team who year after year manage to put together what has to be one of the world's best classic air shows. 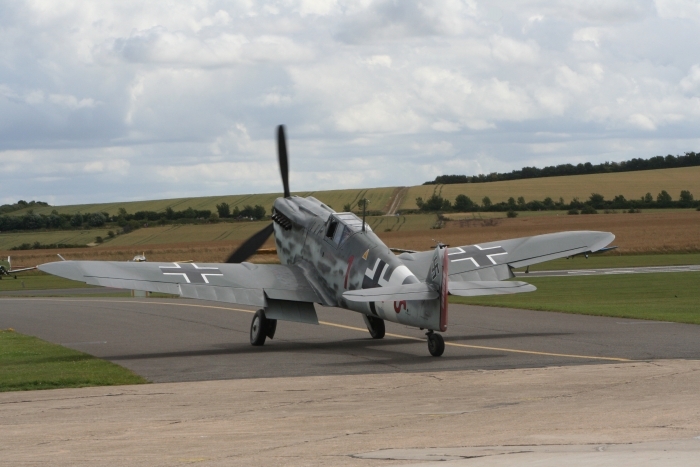 Flying Legends arrived with the weather outlook looking pretty bleak, but Duxford escaped reasonably well. 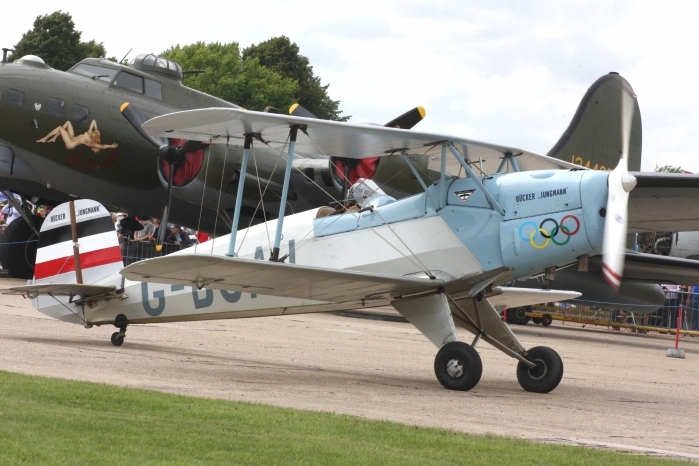 As usual there were plenty of interesting aircraft to look at. 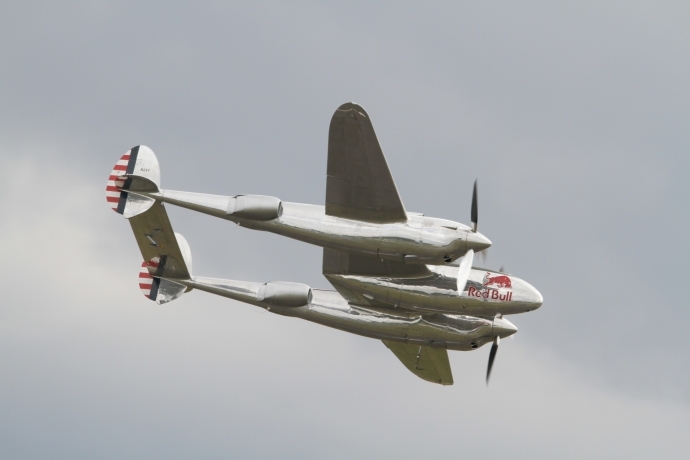 Back for the second year was the P-38 Lightning from The Red Bulls, this aircraft puts on a display of high-speed flypasts and long loops and is very photogenic. 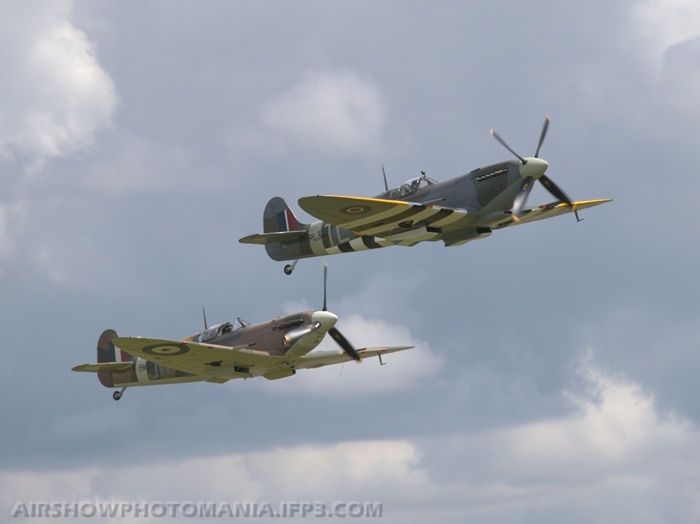 Also gracing the Duxford skies were three Mk I Spitfires, on the subject of Spitfires no less than nine Spitfires of various Mks did some serious formations and tail-chasing. 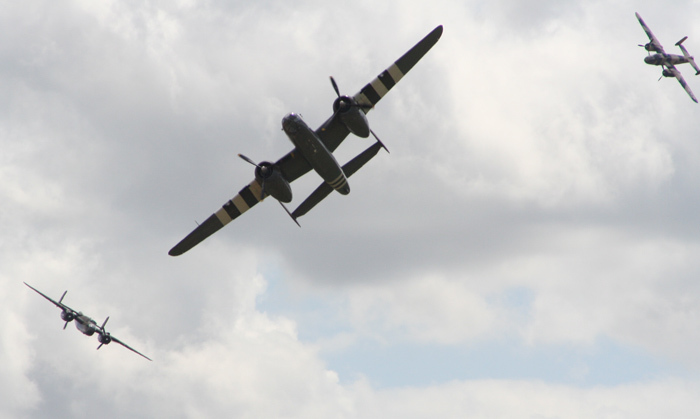 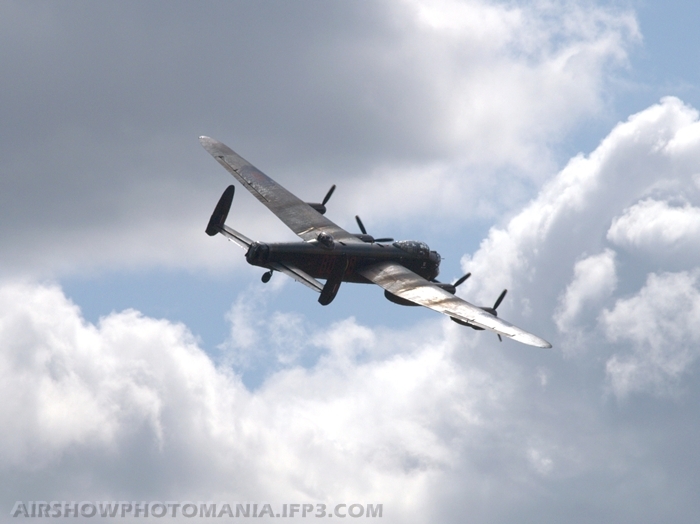 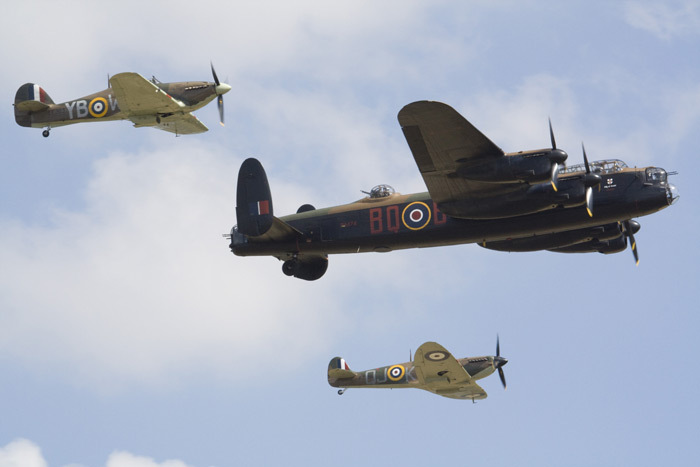 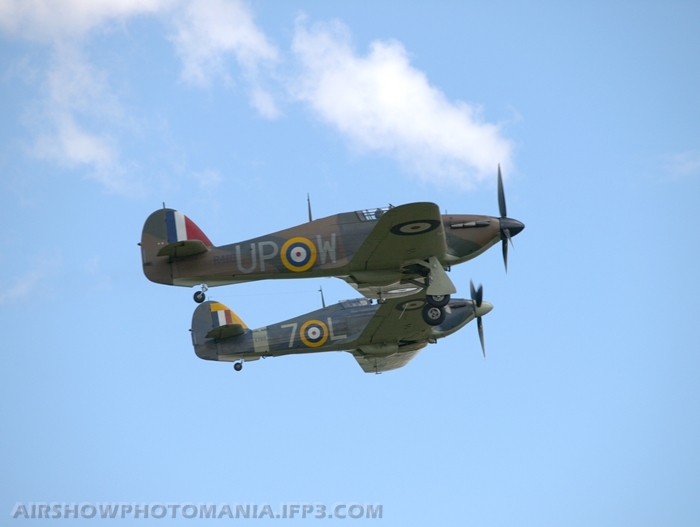 The BBMF put in an appearance with the Lancaster and unusually a pair of Spitfires, the latter displaying as a pair. 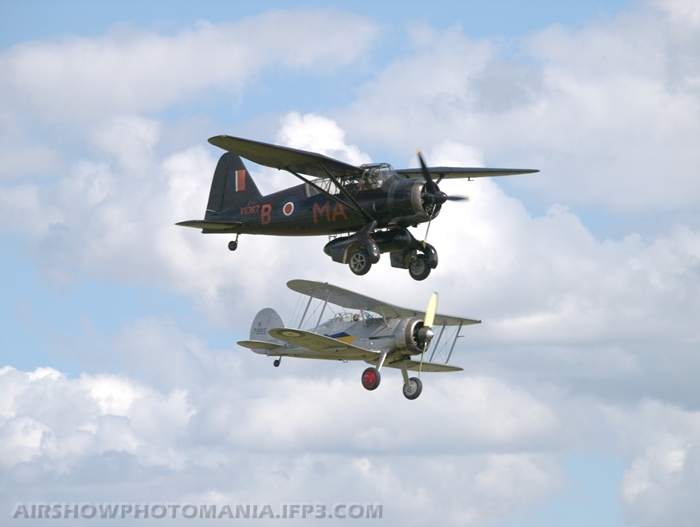 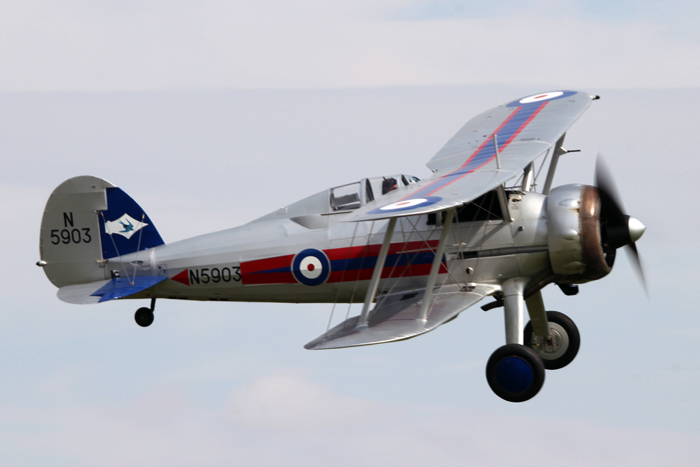 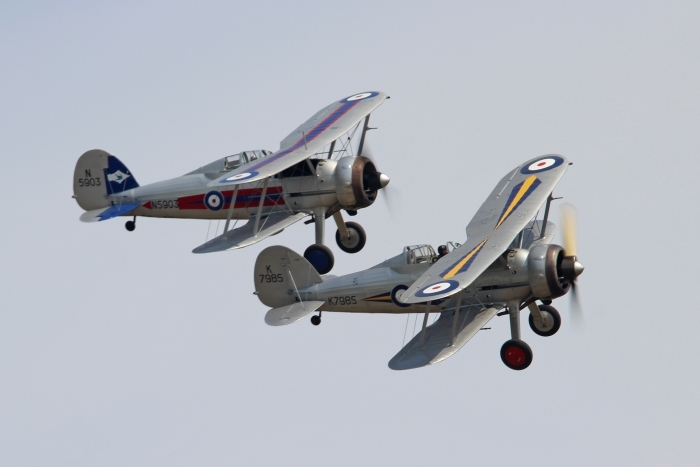 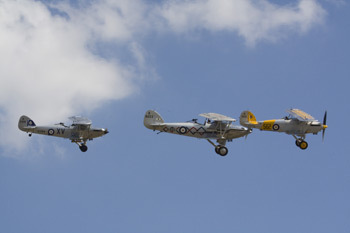 The Hawker Nimrods performed a well coordinated and precision display for the age and size of the aircraft. 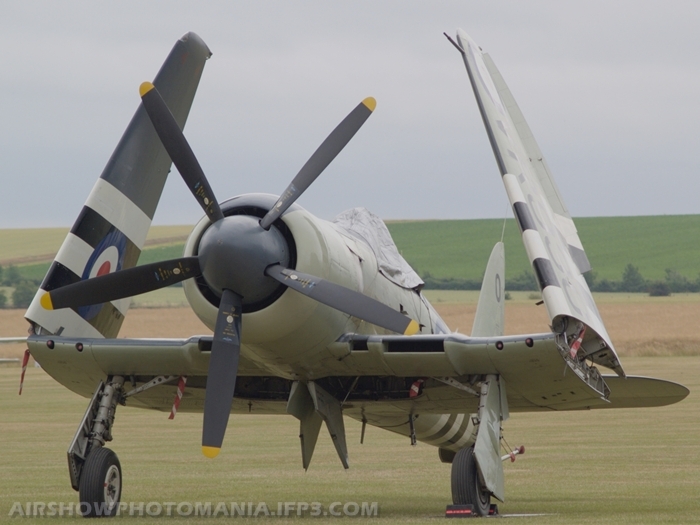 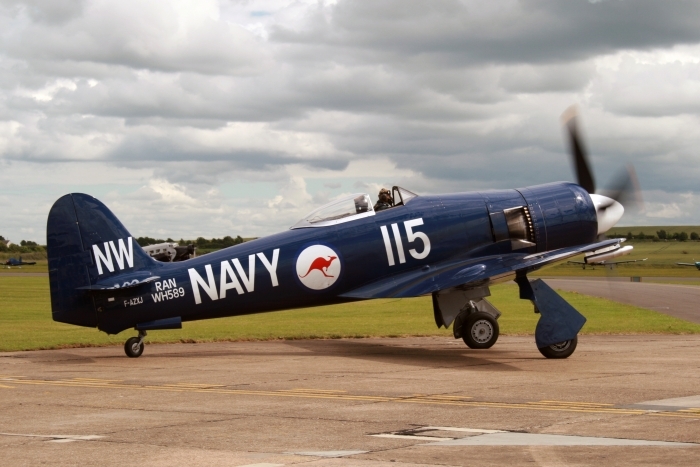 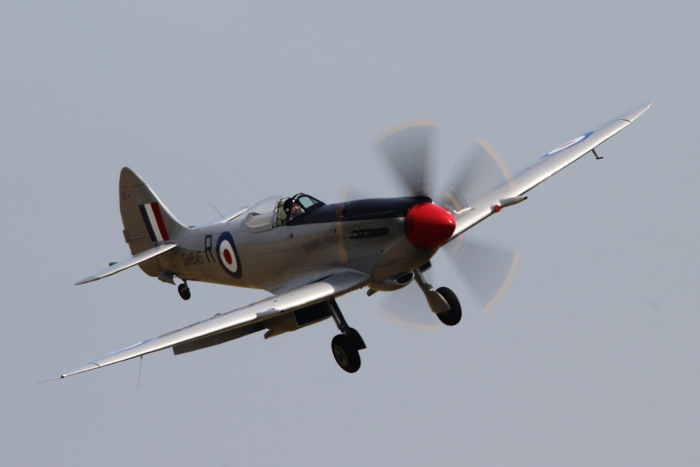 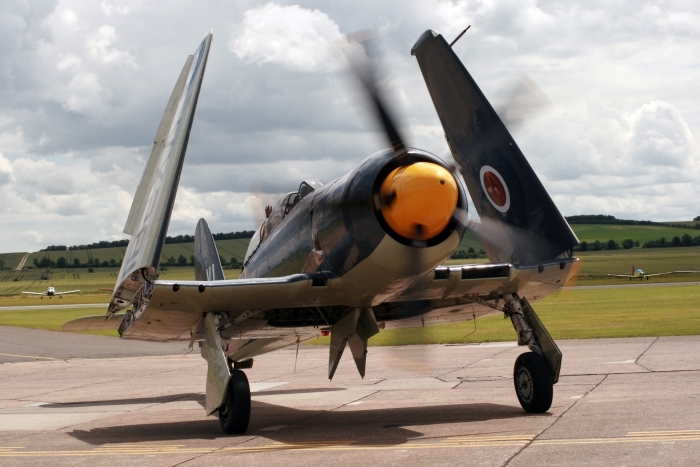 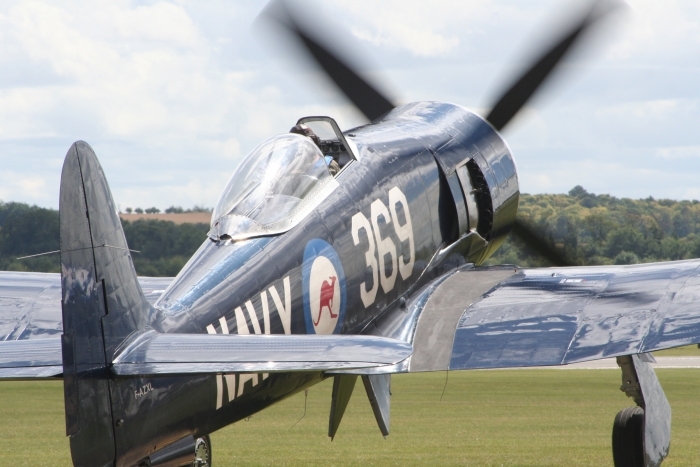 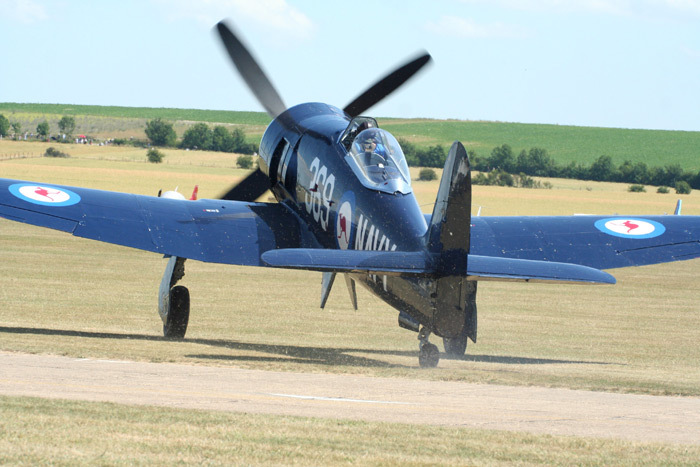 One of the stars of the show was the Hawker Sea Fury which was fitted with smoke generators on the wing tips. 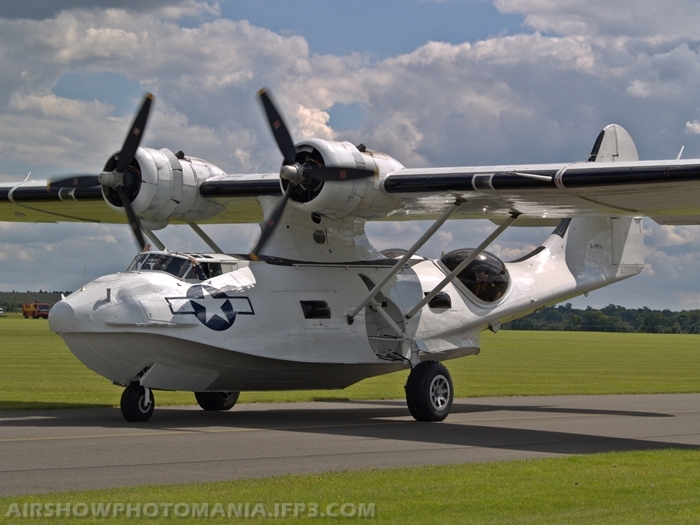 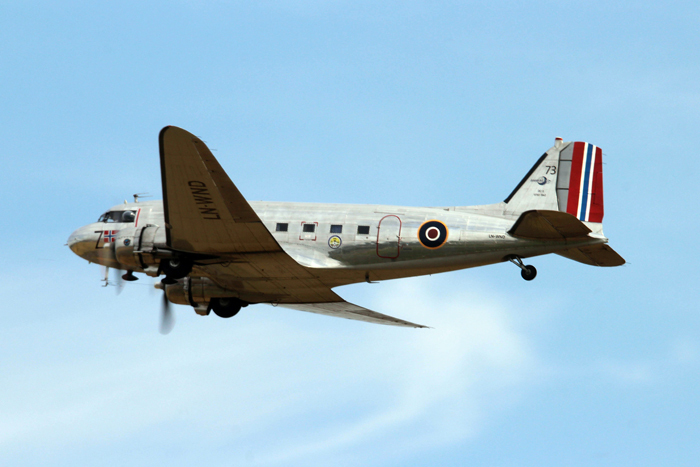 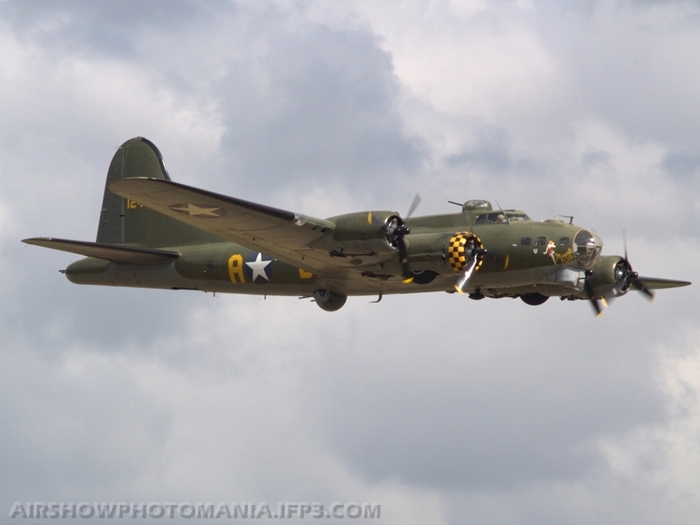 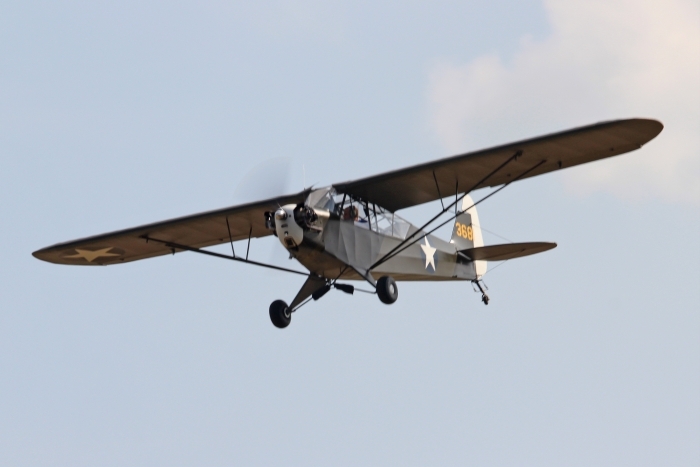 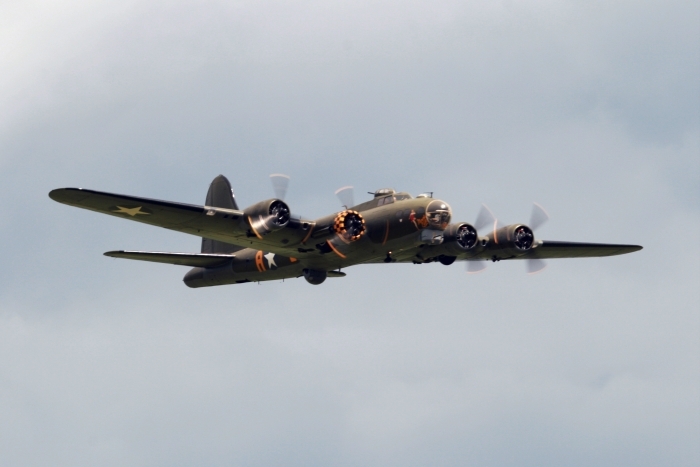 Other aircraft taking part were the B-17 Sally B, Catalina and Swordfish. 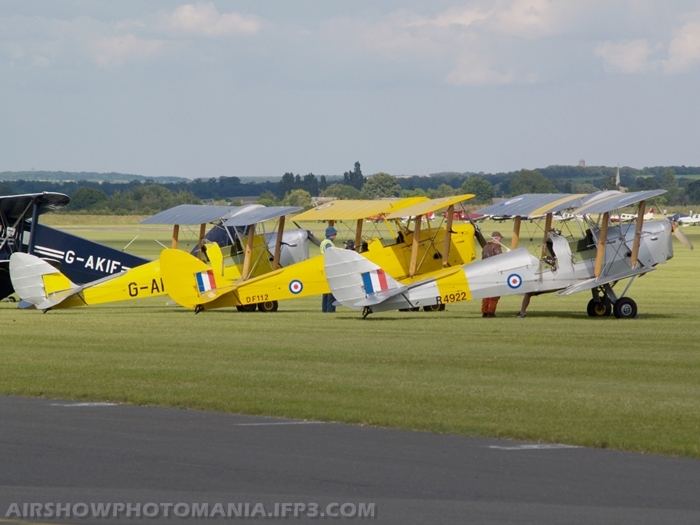 Display teams included the Breitling Wingwalkers and the ever popular Aerostars. 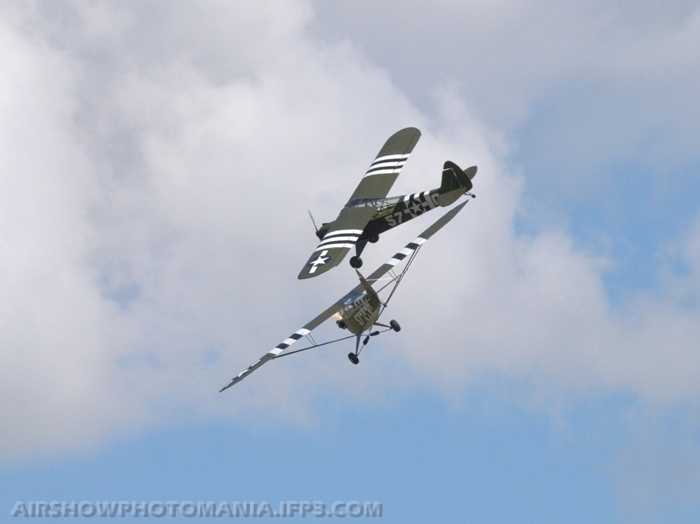 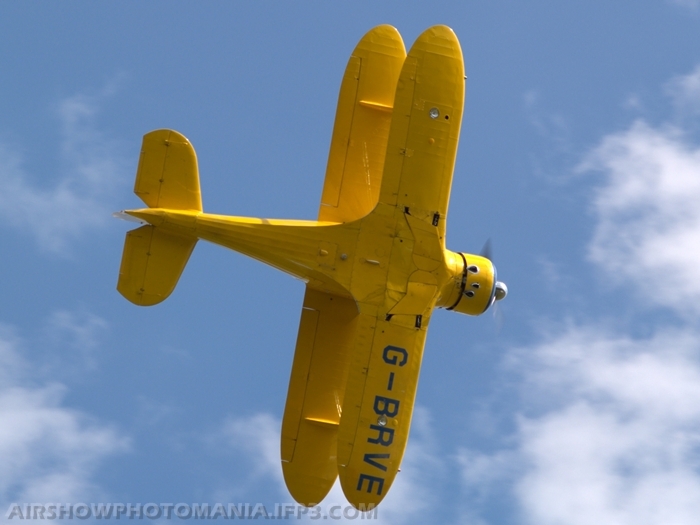 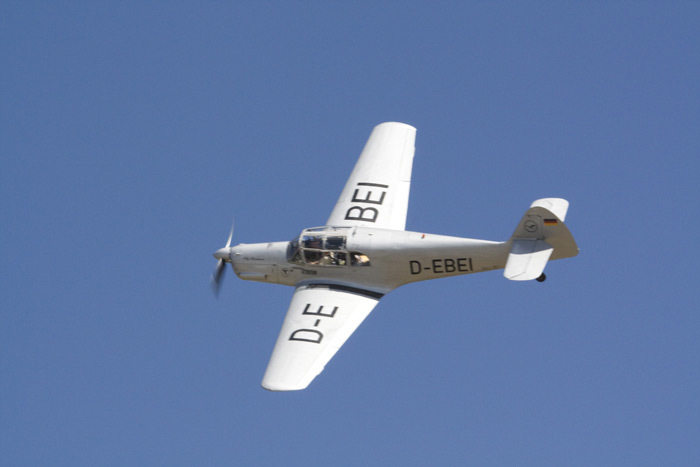 Finishing the flying display as usual was the Flying Legend's Balbo which ended a superb weekend's flying. 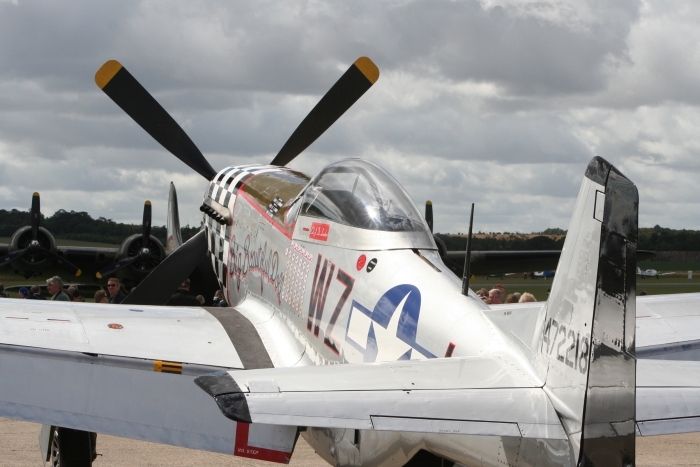 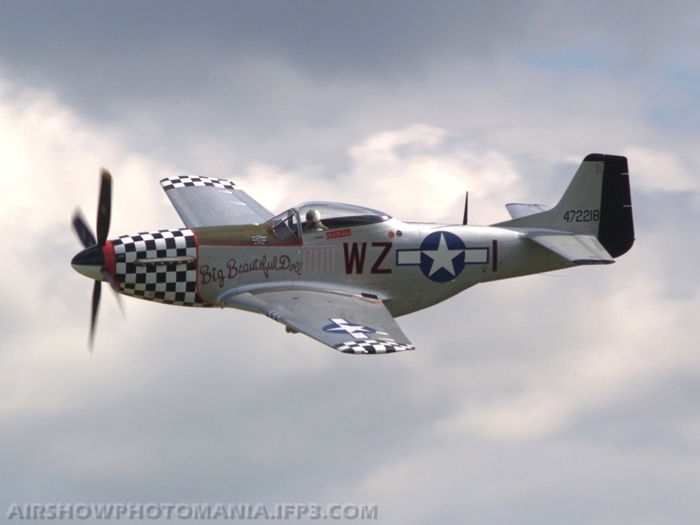 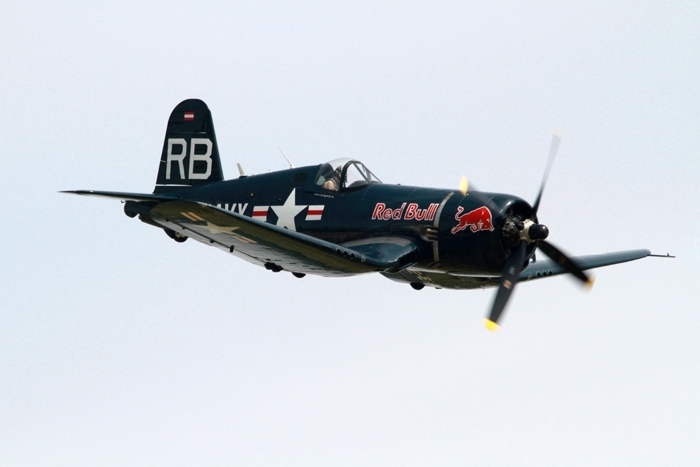 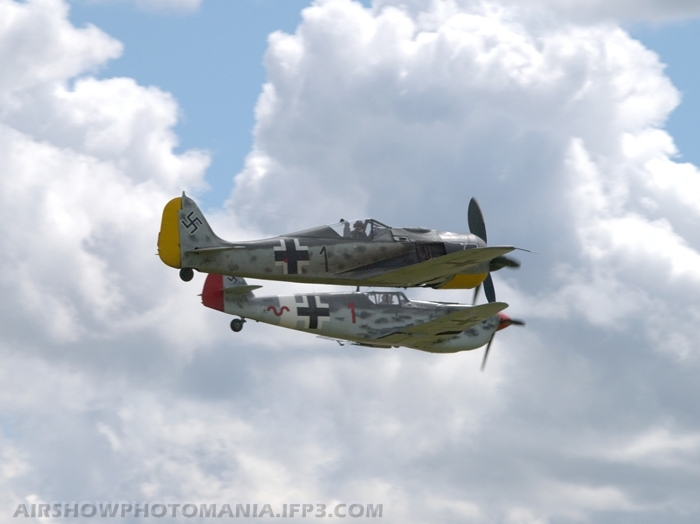 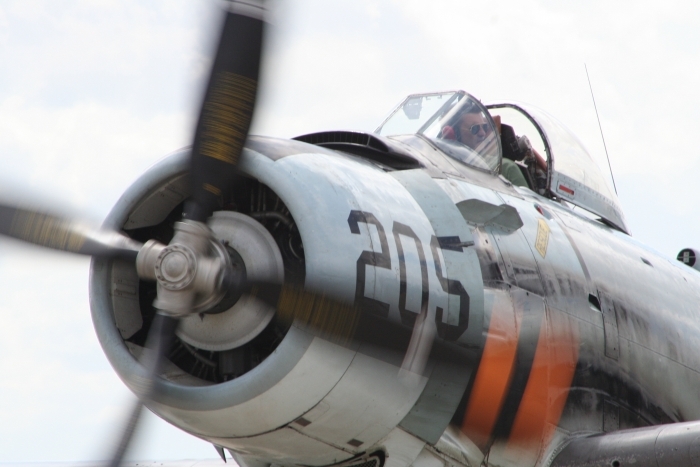 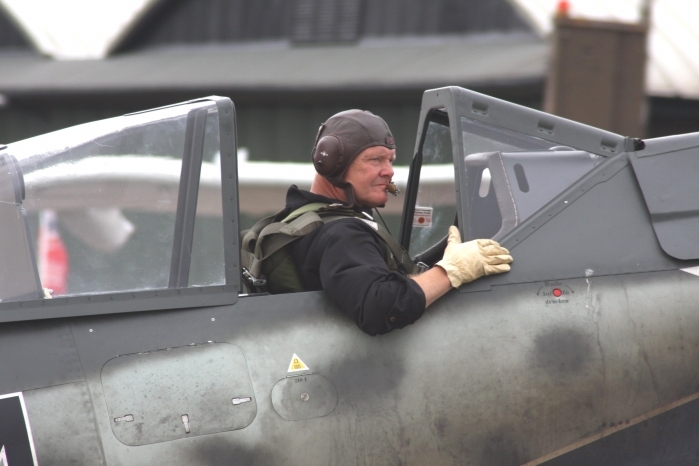 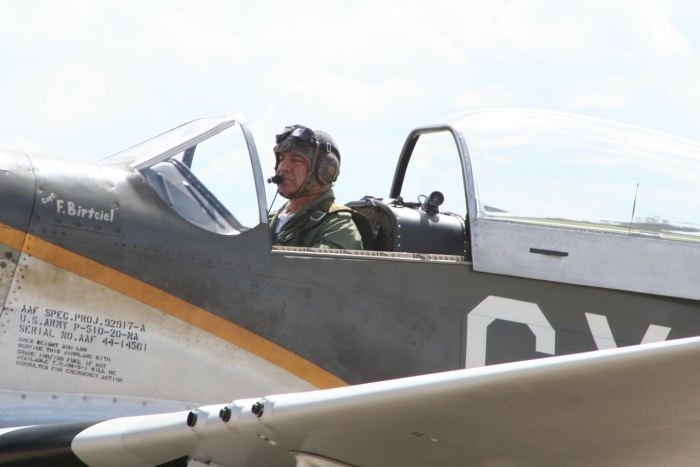 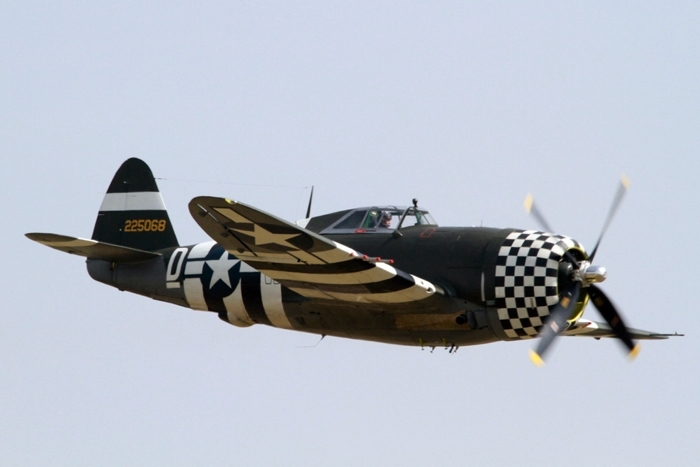 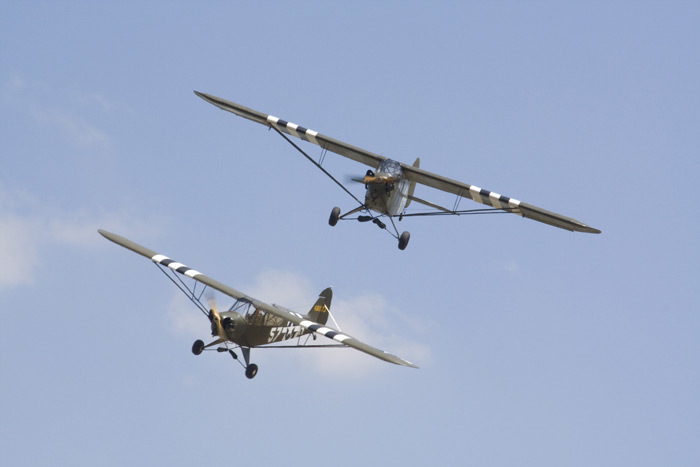 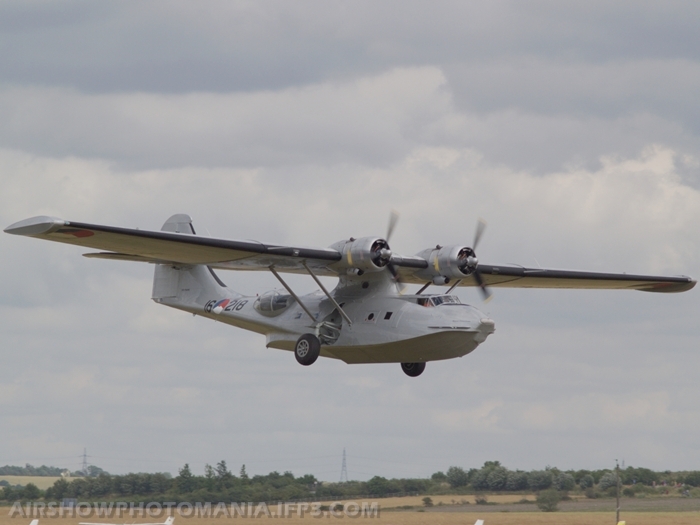 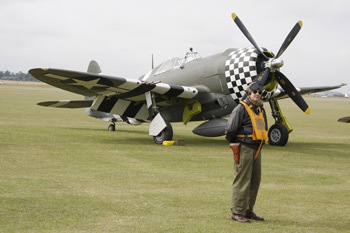 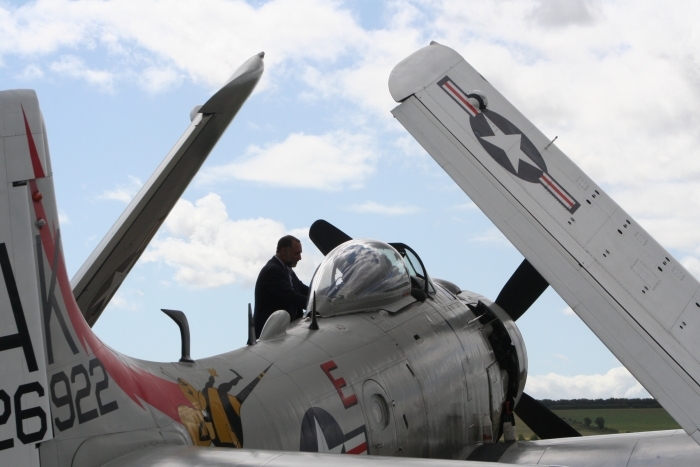 Flying Legends Air Show is no doubt one of the world’s greatest air shows. 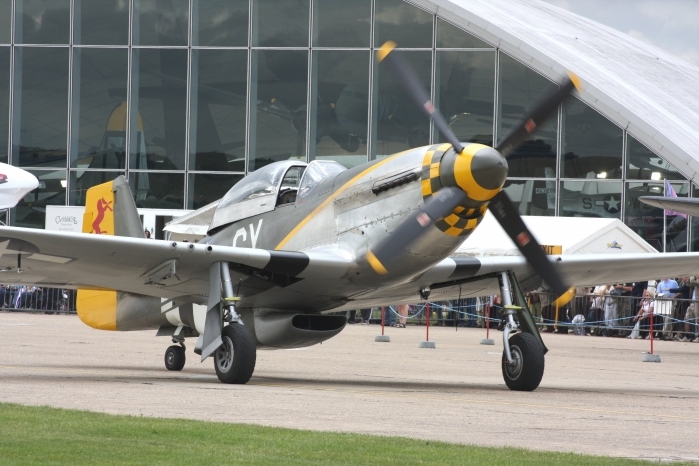 Held at the Imperial War Museum (Duxford's World War II airfield in Cambridgeshire) the air show brings together classic aircraft from all around the world. 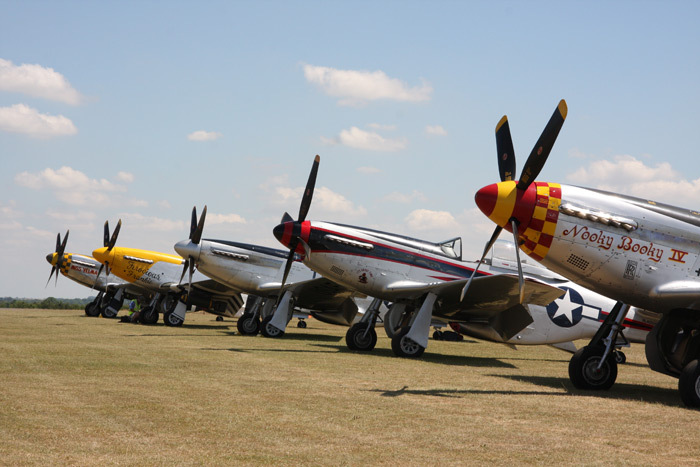 The two day show is one not to be missed and attracts visitors from all corners of the globe. 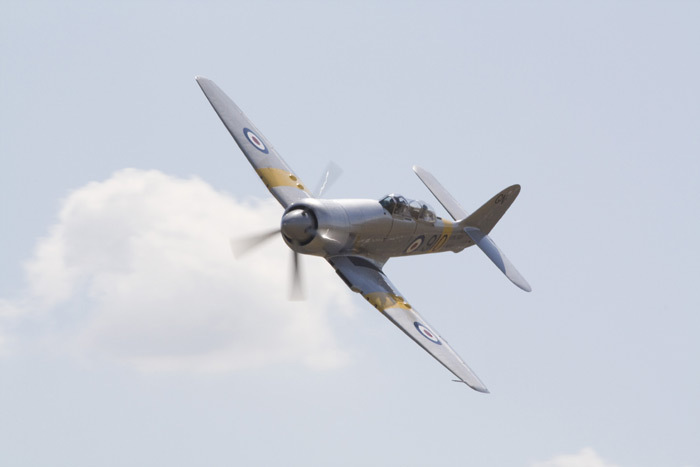 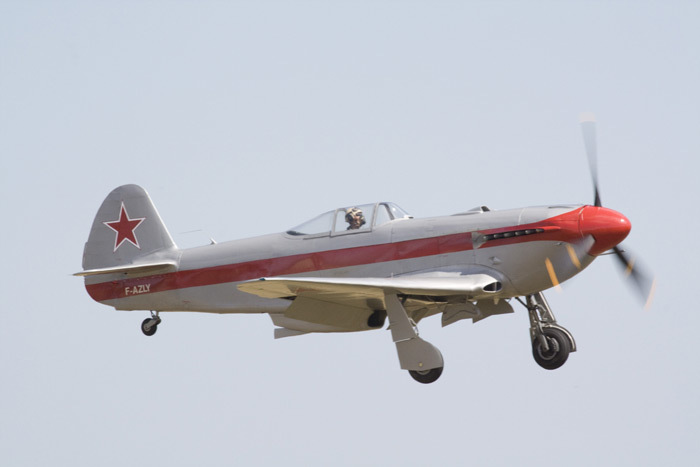 With new aircraft expected from The Fighter Collection and The Red Bull's P-38 Lightning and Corsair the excitement showed in the watching crowds. 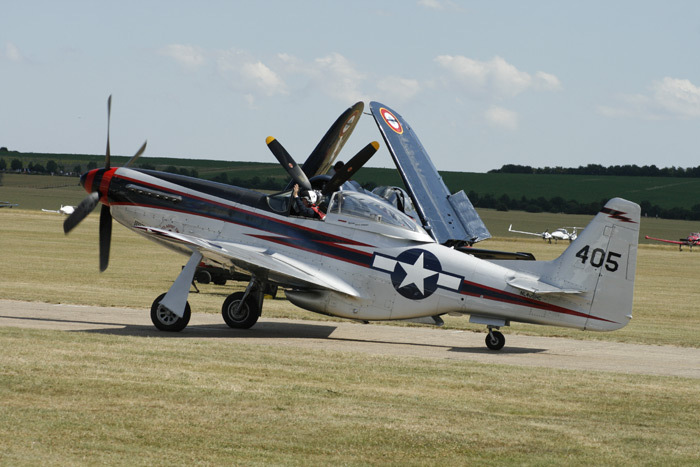 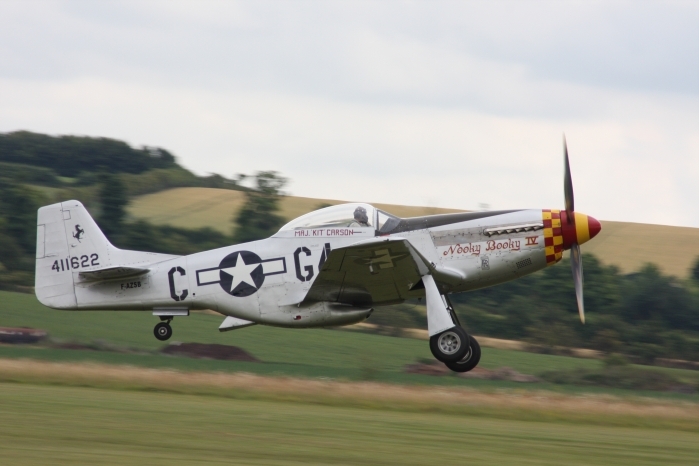 With the added attraction of the P-51 Mustangs of The Horsemen Aerobatic Team imported from the USA, 'Fragile but Agile' and 'February' flown by Ed Shipley and Dan Friedkin, who put on a terrific show as a duo and later flew with four other Mustangs. Another first for Duxford was the four-ship formation of Hawker biplanes consisting of Hawker Nimrod I and II and Hawker Demon and Hind. 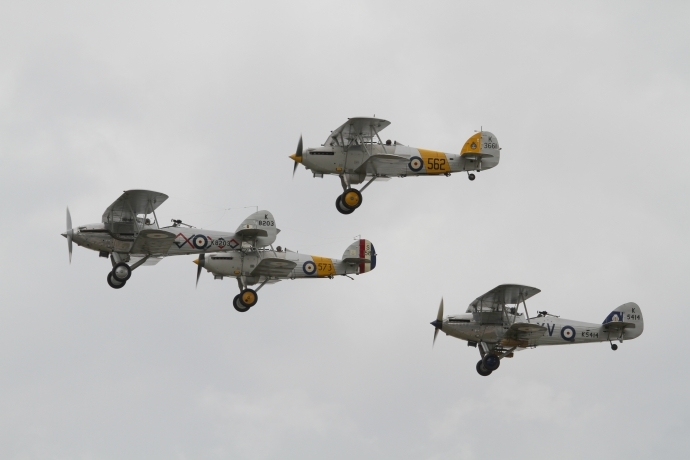 These aircraft have not been seen flying in a formation like this for many a year. 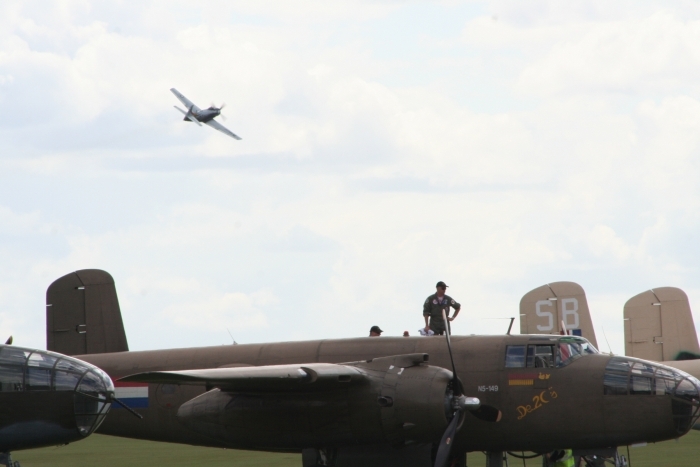 Overall another fantastic two day show with the added bonus of Sea Furys, Spitfires and Buchons, and on the larger side a very interesting pairing of a pair of Dakotas, who carried out a well synchronised demonstration of precision flying for such large aircraft. 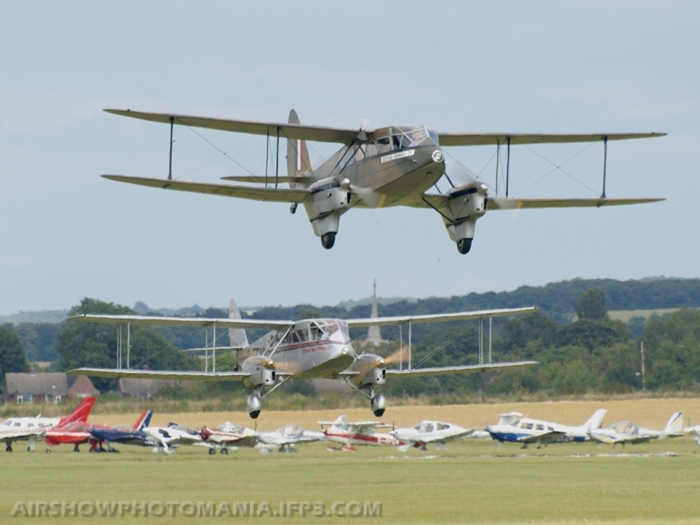 There were many more aircraft taking part at Legends but as usual both days finished with an over twenty aircraft balbo. 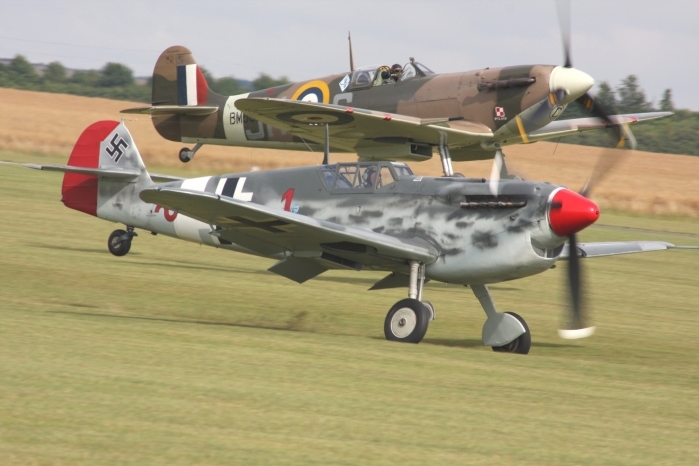 Overall a well presented flying display both days, with a big thank you to Stephen Grey and all his team at The Fighter Collection for the tremendous effort put in. 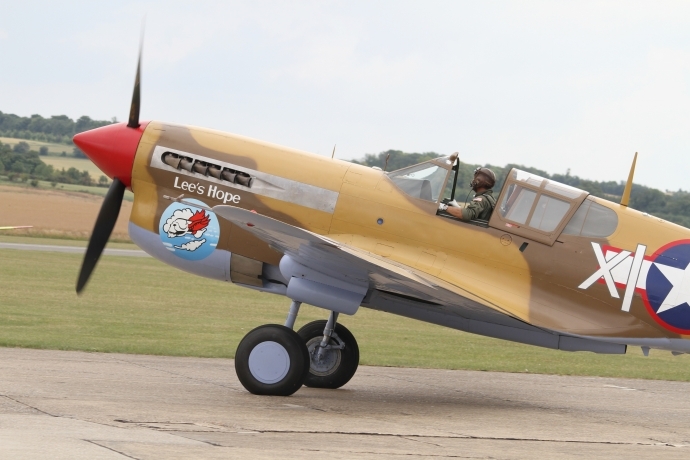 Flying Legends is one of Duxford's busiest shows and with the weather we had this weekend (probably the hottest weekend of the year) this was an event not to be missed. 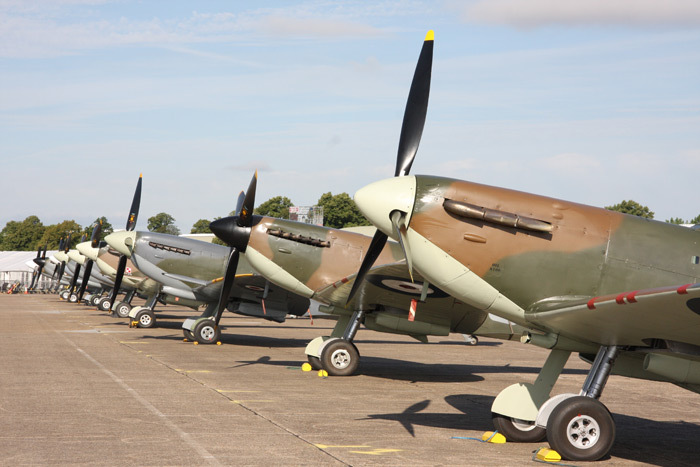 With plenty of things for the public to look at, including the flightline walk, which was well supported. 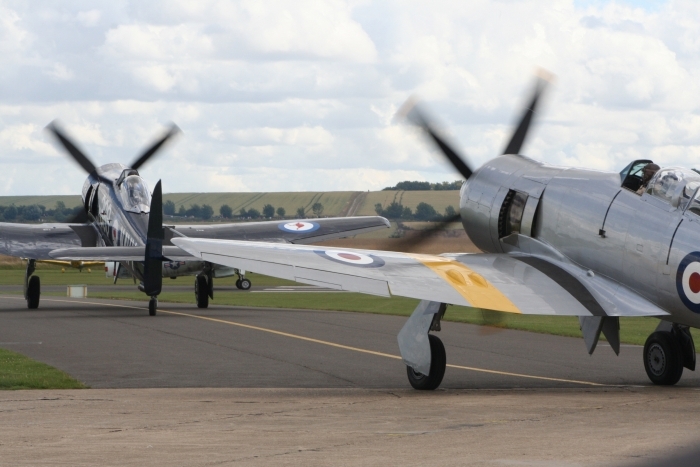 How often is it possible to view these classic aircraft at such close quarters? 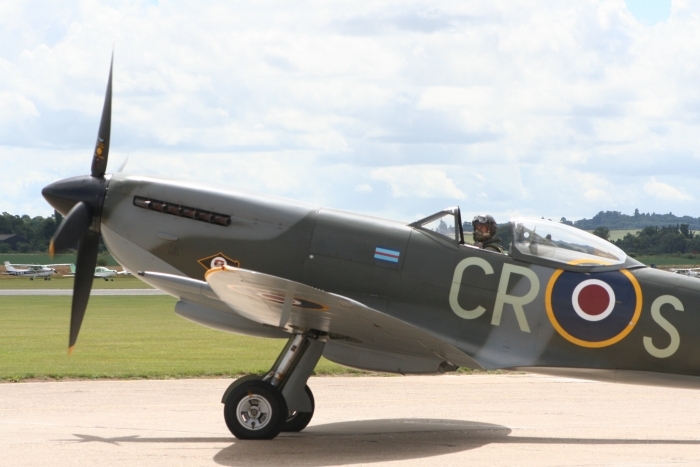 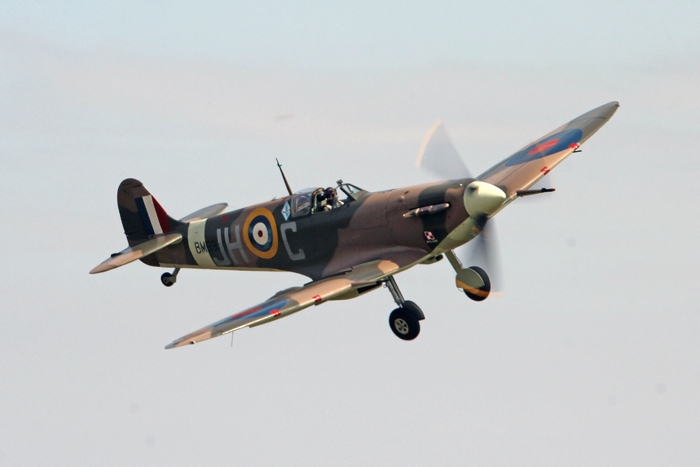 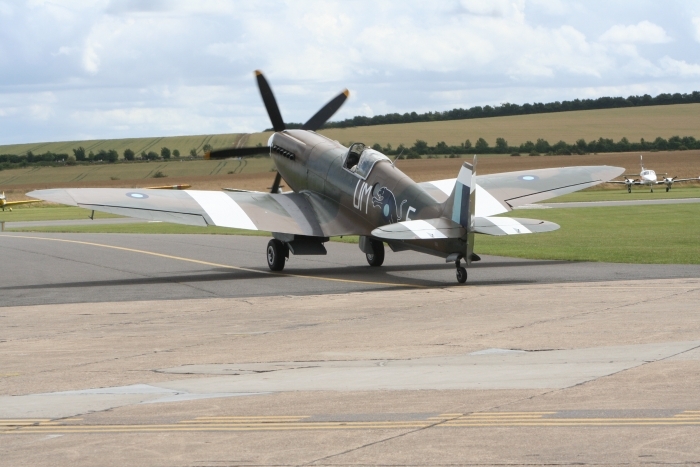 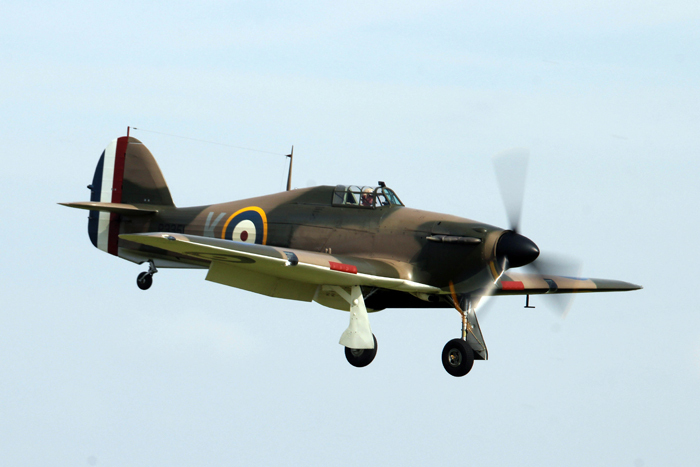 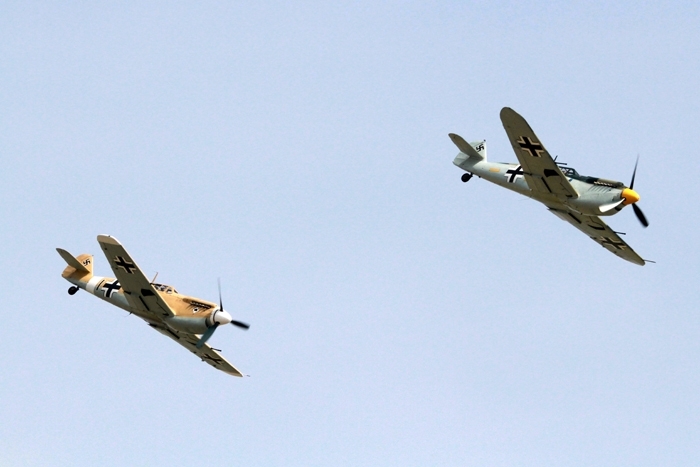 The flying started at 2pm, with the takeoff of eight Spitfires, a Hurricane and a Buchon. 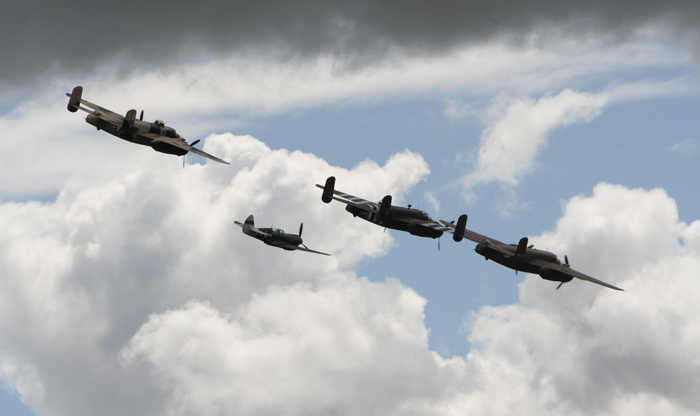 These aircraft thrilled the spectators with some formation flypasts and aerobatics. 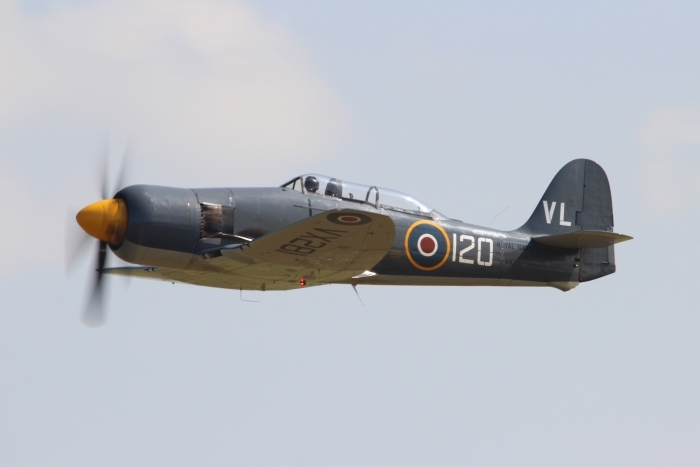 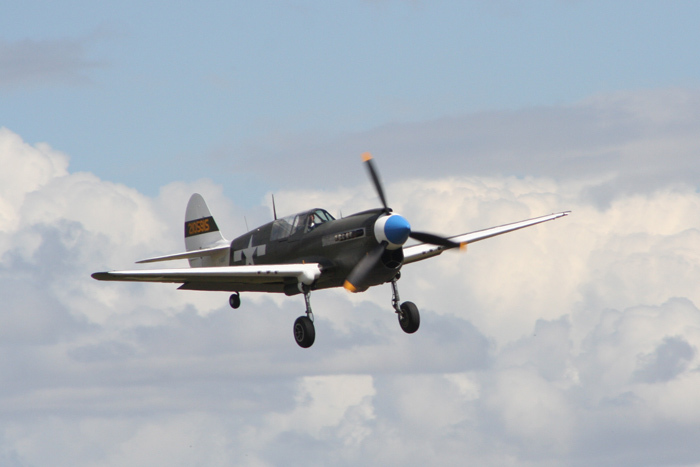 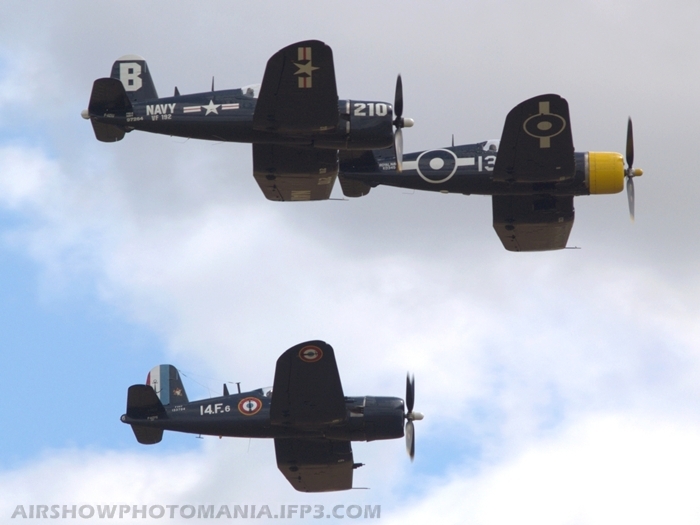 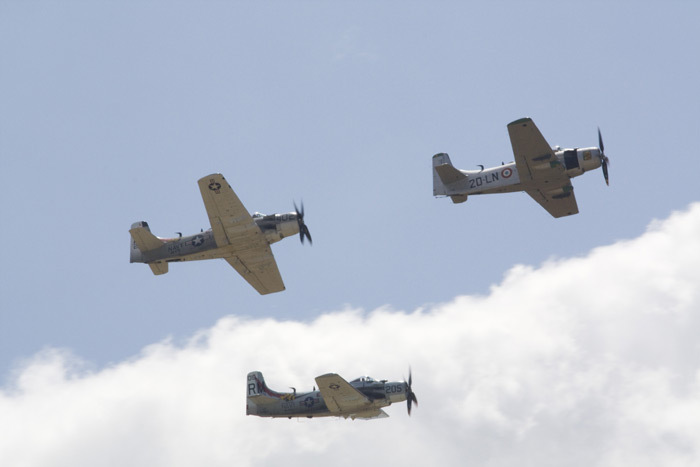 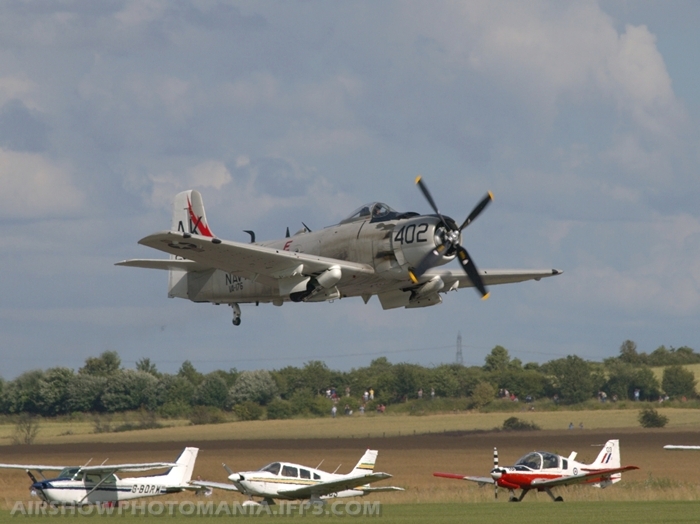 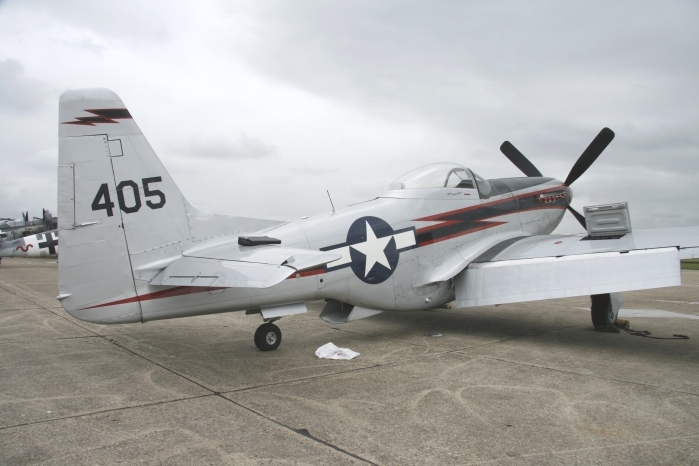 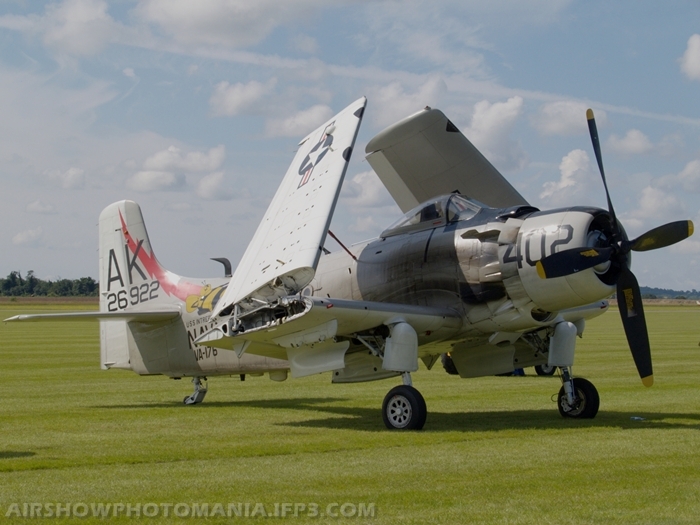 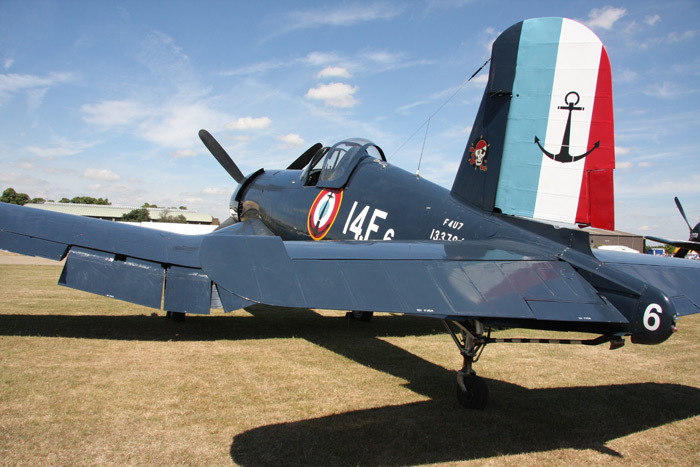 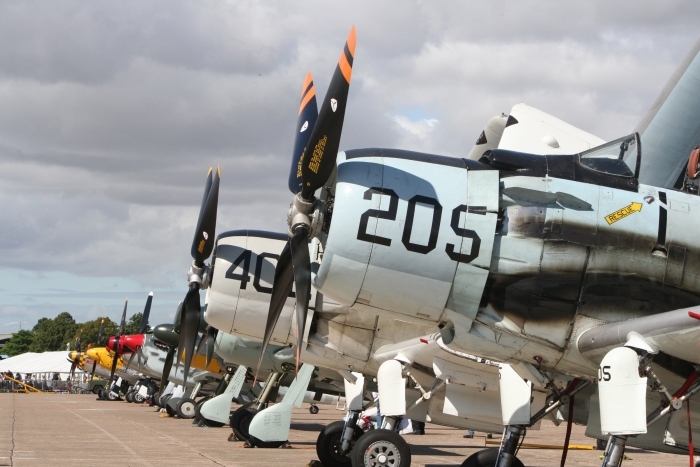 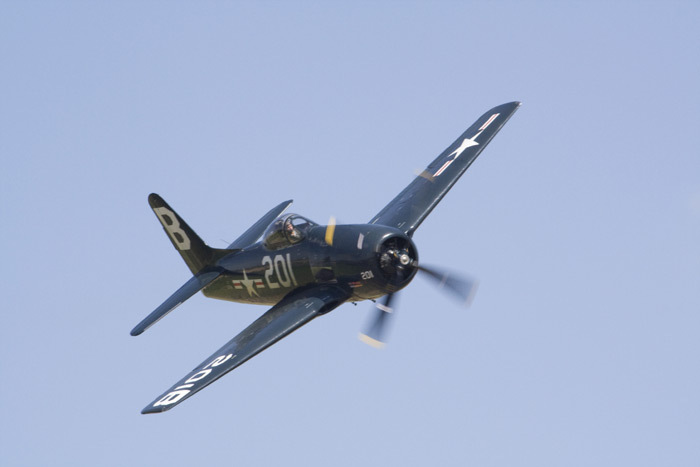 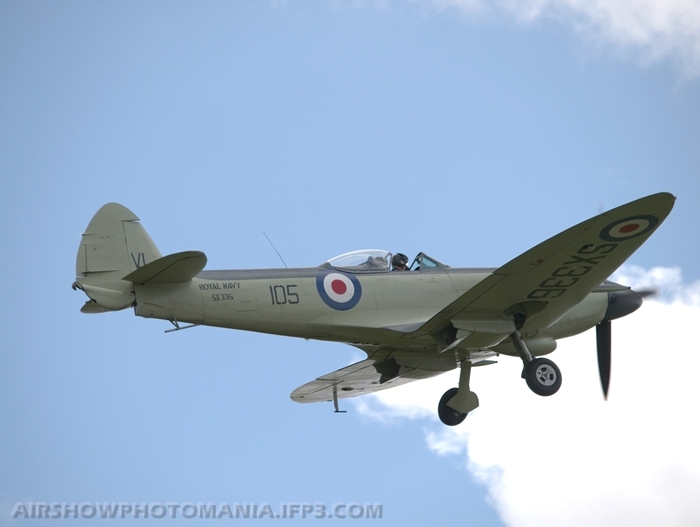 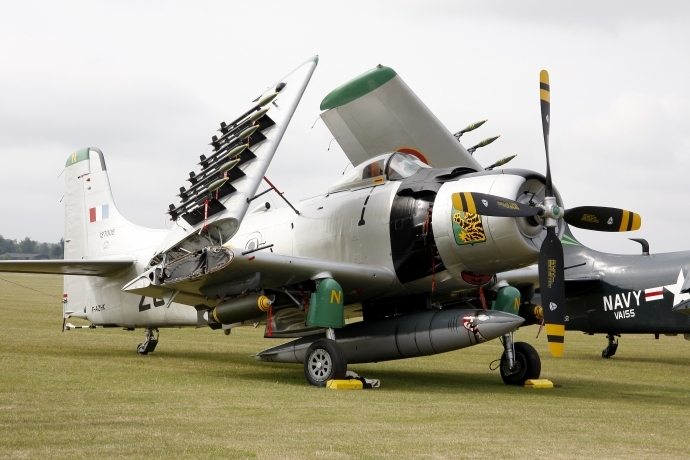 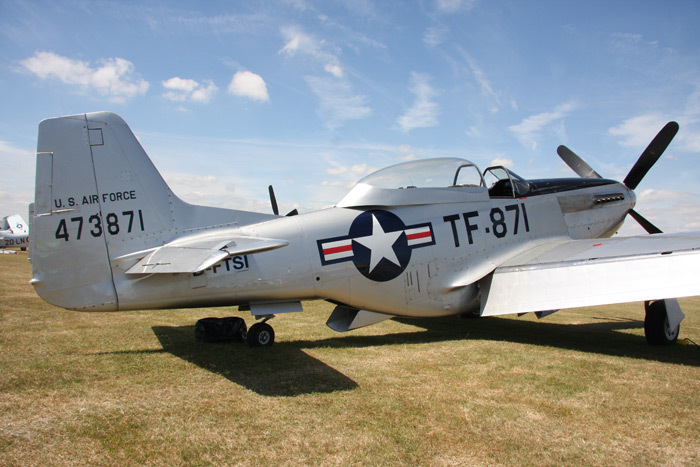 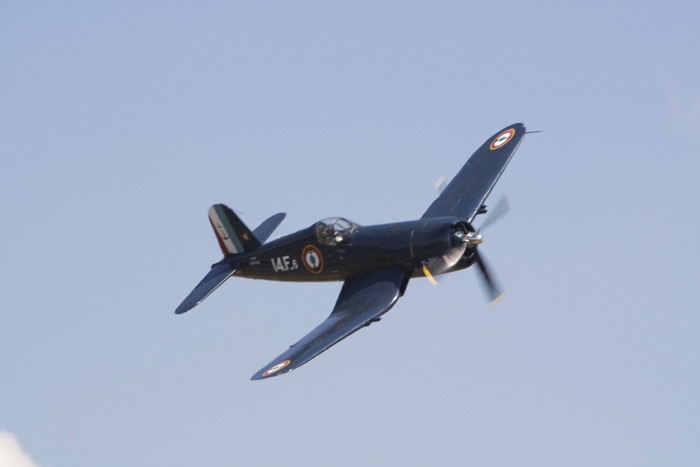 Other aircraft taking part in the air show included three Skyraiders, a Seafire, Sea Fury, a Bearcat and Corsair. 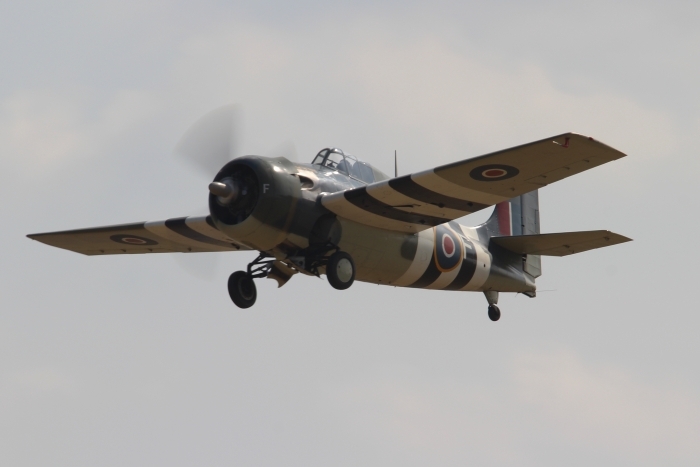 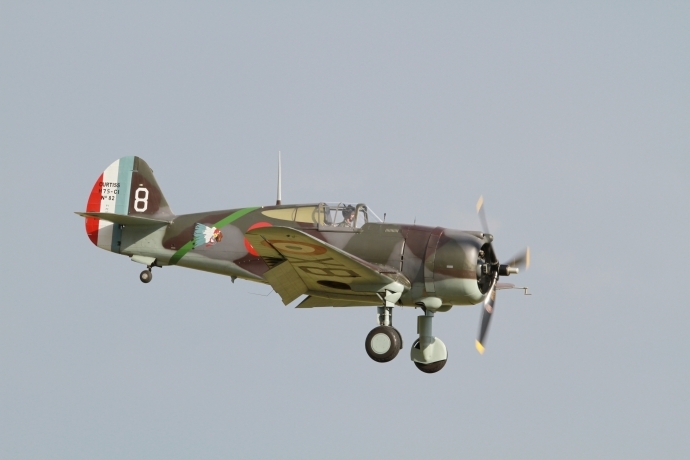 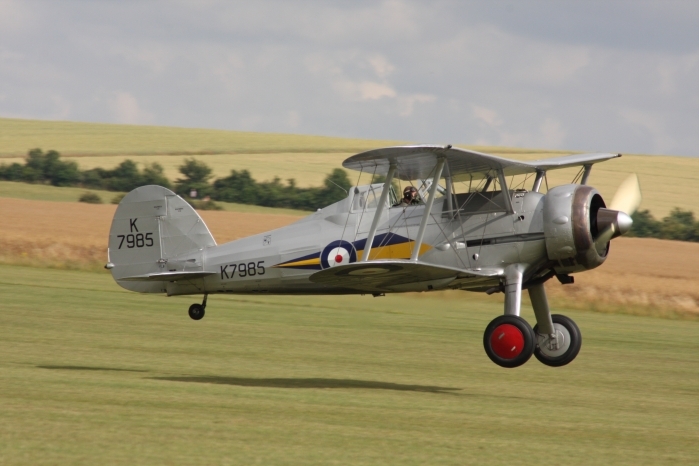 Some of the more sedate aircraft included the Mew Gull, Magister, Gladiator and Lysander. 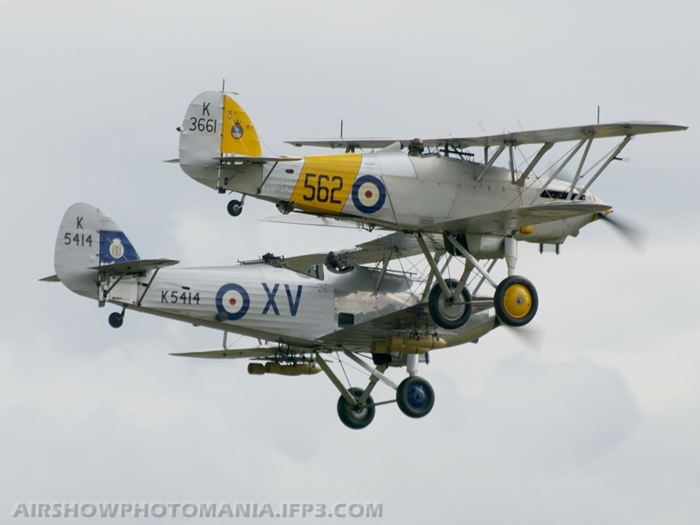 A rare site at Duxford was a display from a Hawker Demon, Hind and Nimrod. 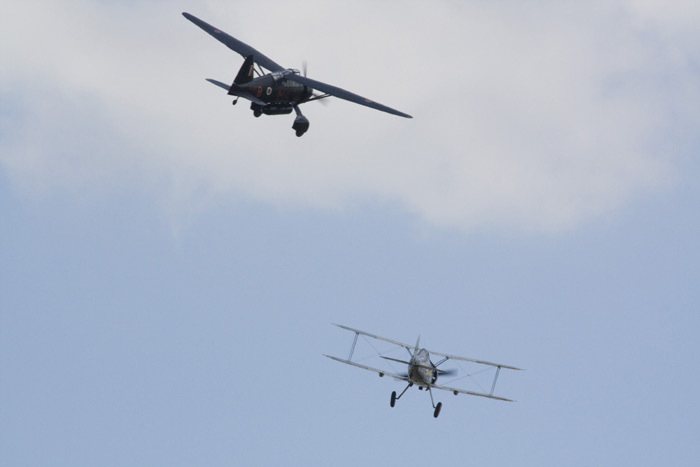 To add a bit of variety to Flying Legends, the crowds were treated to a display by The Breitling Wingwalkers and their Boeing Stearman. 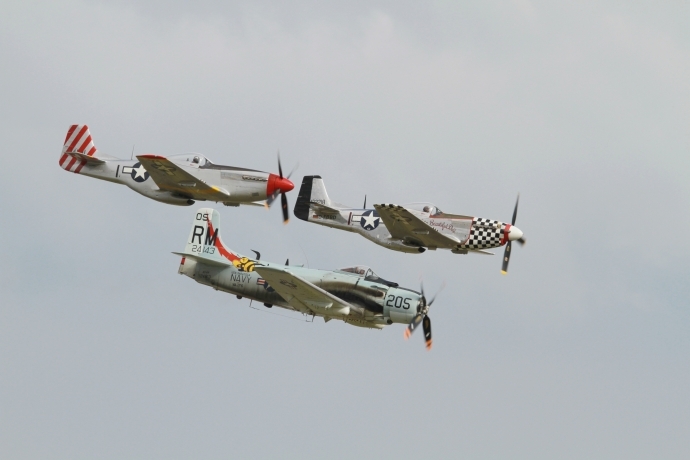 There was also a five-ship of Mustangs. 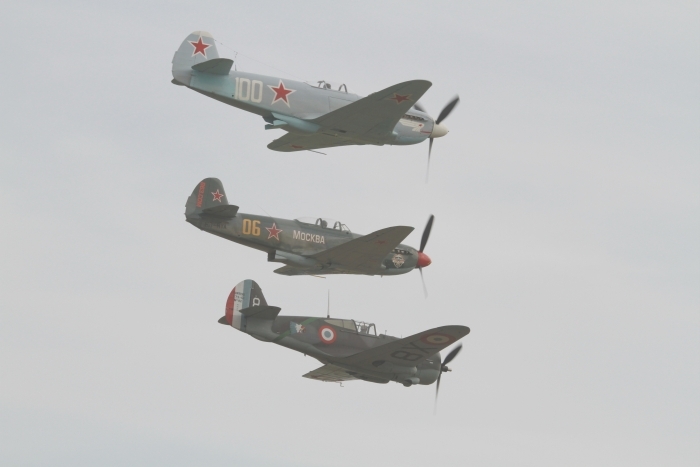 The air show was finished off by the balbo, which consisted of over twenty classic aircraft. 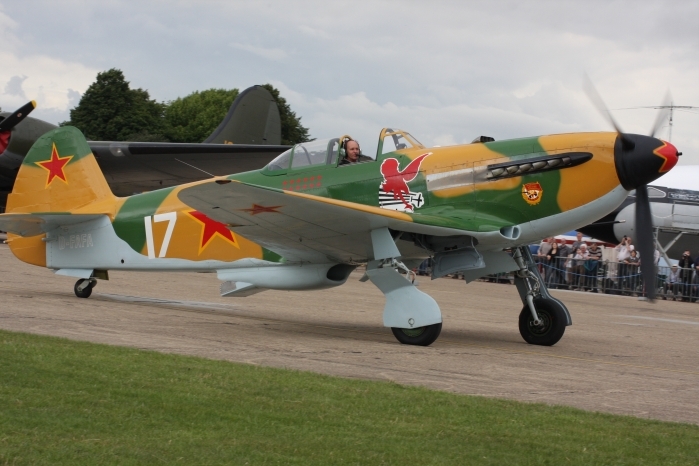 This year's event was overshadowed by most of The Fighter Collection's aircraft not being available for the display. 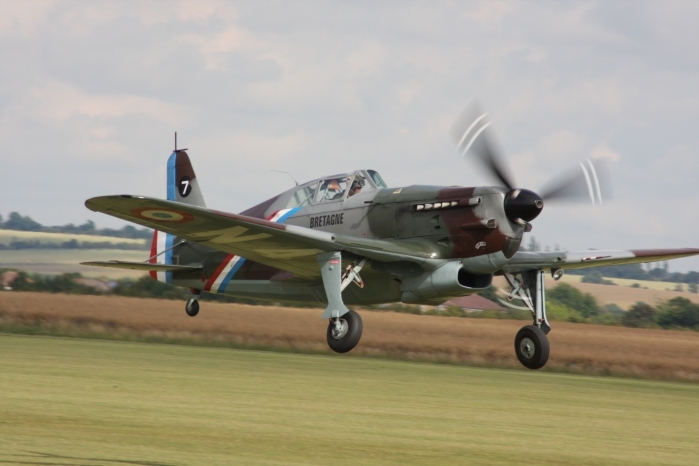 With the usual Cambridgeshire weather both mornings started with rain and mist, with some of the smaller aircraft having to cancel due to the gusting winds. 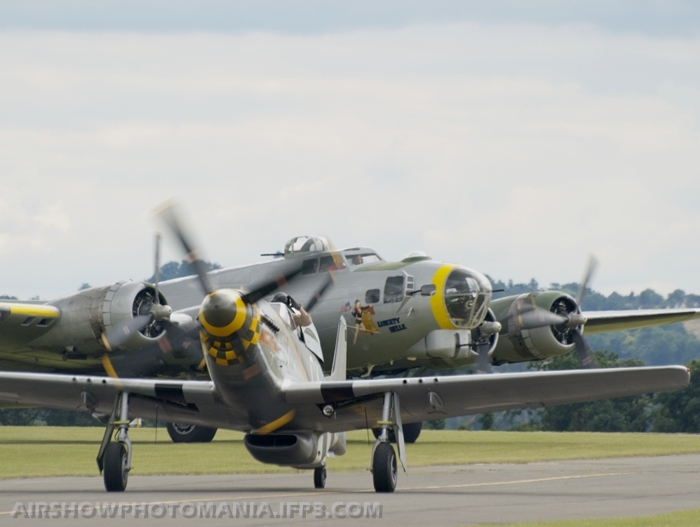 With the B-17 Sally B still being grounded with engineering problems, but in the end the two days turned out to be something very special. 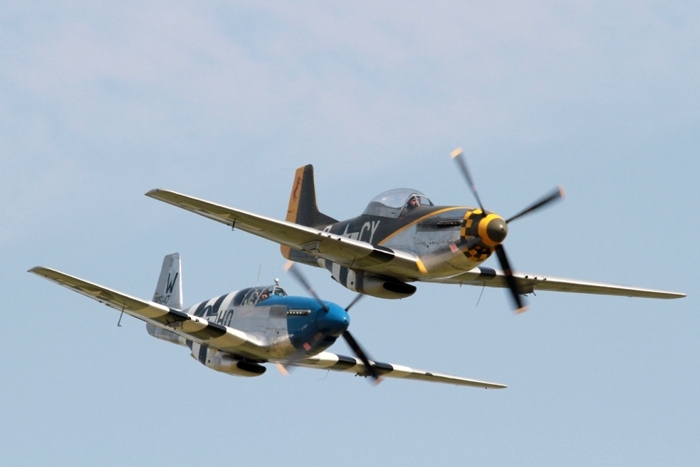 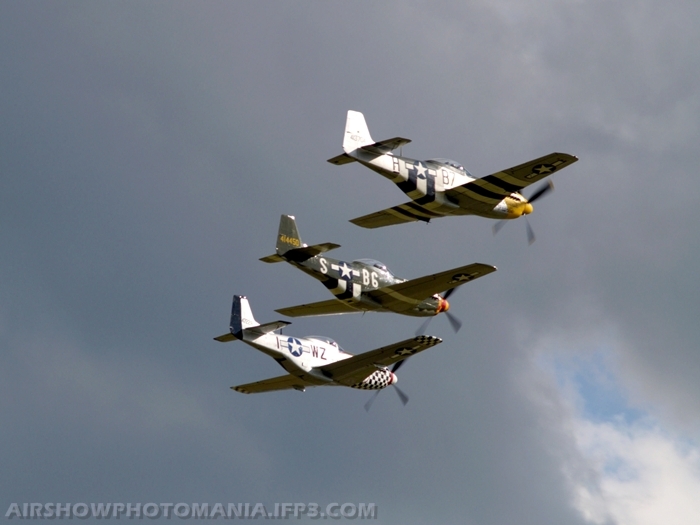 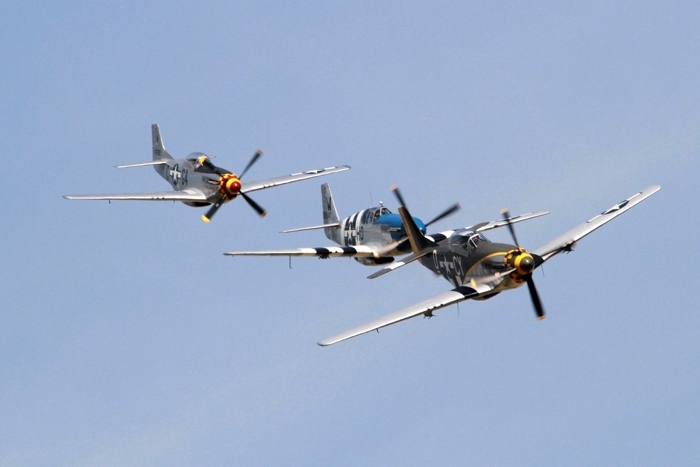 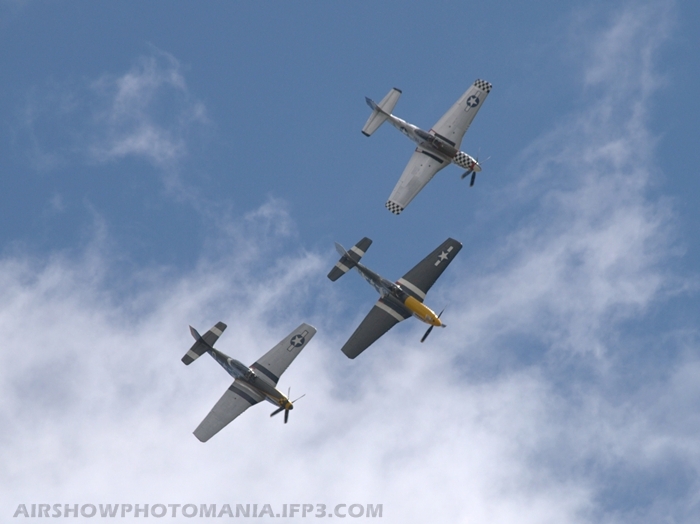 With a line up of six P-51 Mustangs, a pair of Skyraiders and two FW-190s, one on static and one flying. 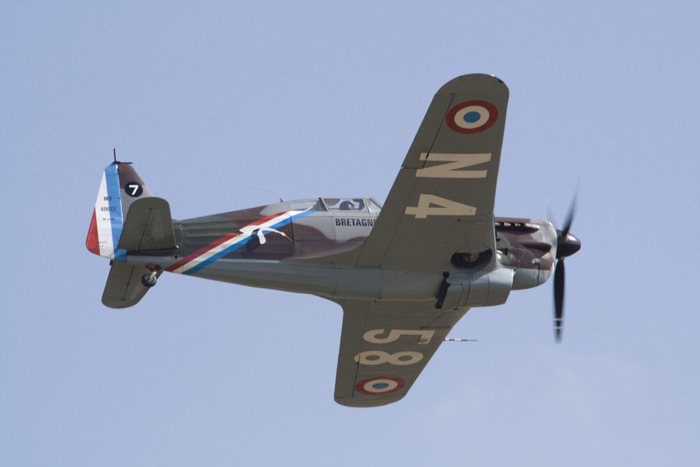 This aircraft is owned by Christophe Jacquard and only flew for the first time a few months ago. 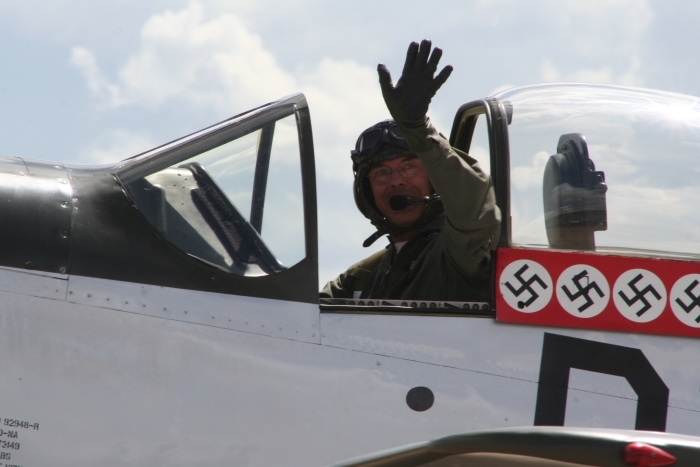 The pilot was Marc 'Leon' Mathis. 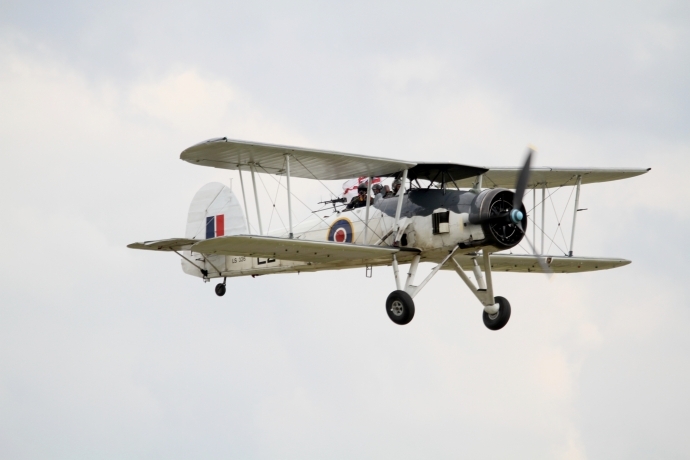 With such a diverse selection of aircraft on show including Spitfires, Hurricanes, a Sea Fury T.20 and more sedate aircraft like the Gladiator and Lysander. 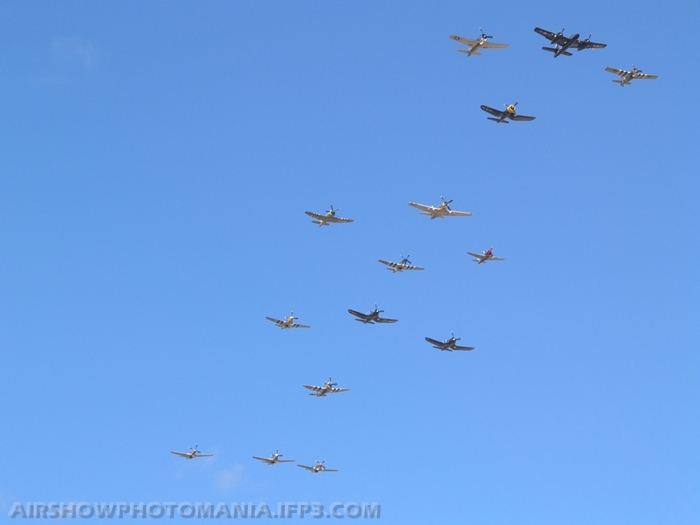 Finished off by the traditional Flying Legends big formation, which had twenty one warbirds taking part. 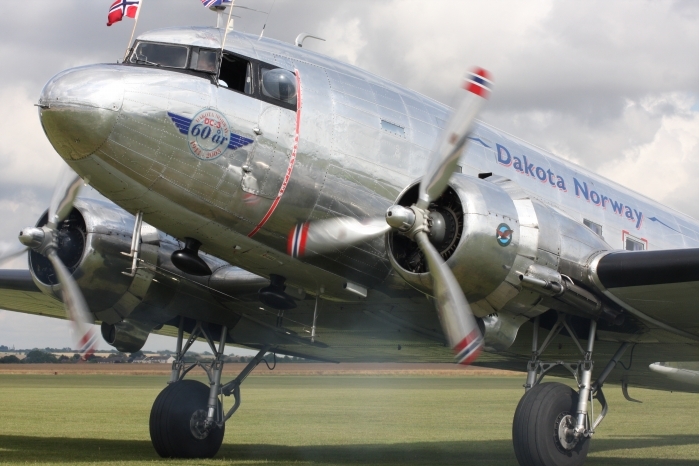 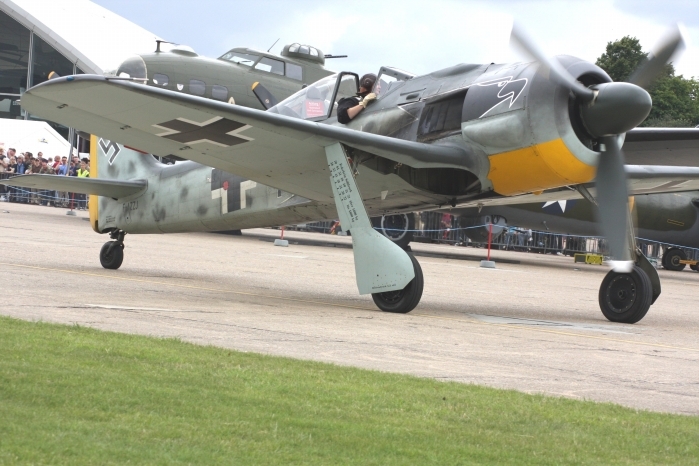 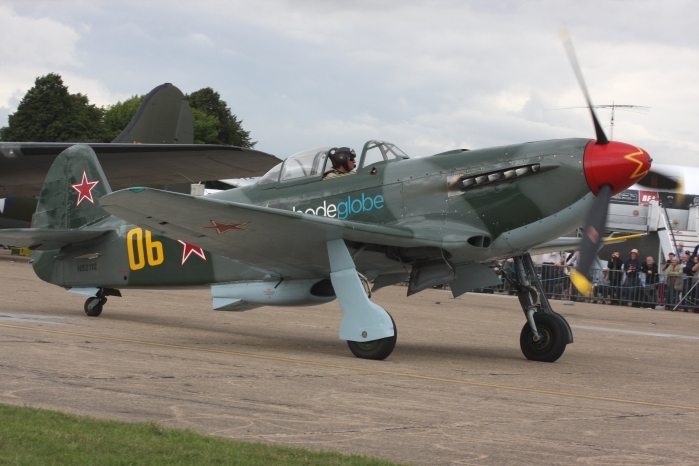 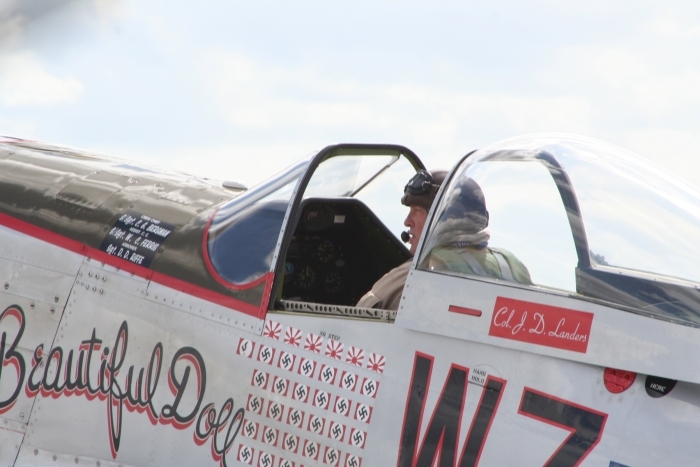 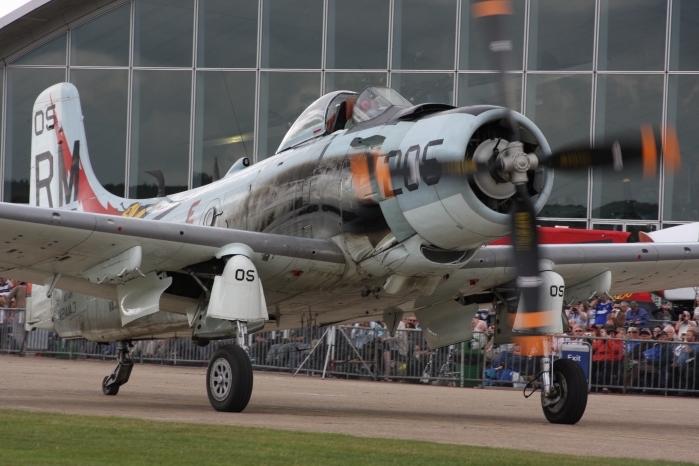 With the terrible weather forcing the cancellation of Fairford's RIAT show this year, many of the enthusiasts made the journey up to Duxford's Flying Legends Show and they were not disappointed. 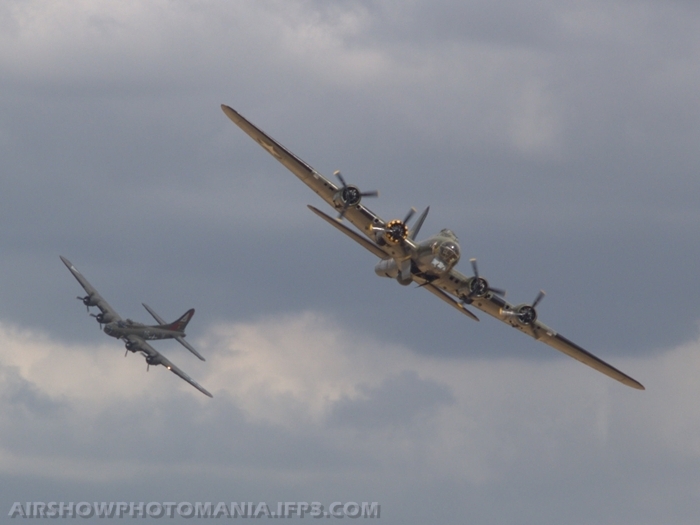 With no less than three B-17 Flying Fortresses at Duxford. 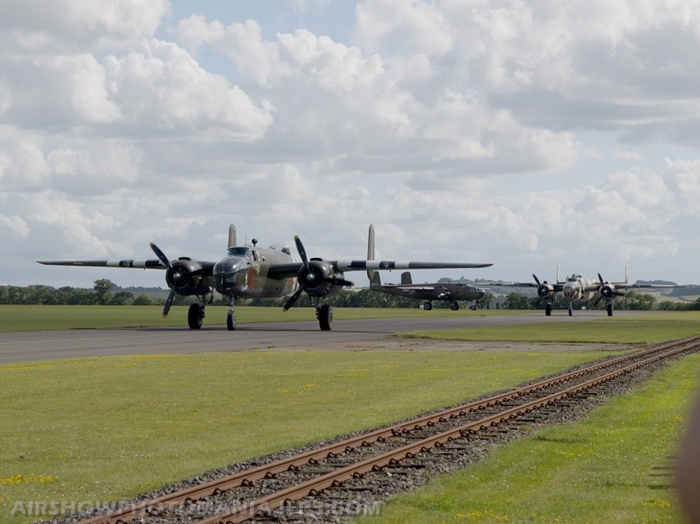 Liberty Belle, Pink Lady and Sally B, who unfortunately had engine trouble and was unable to fly with the other two aircraft. 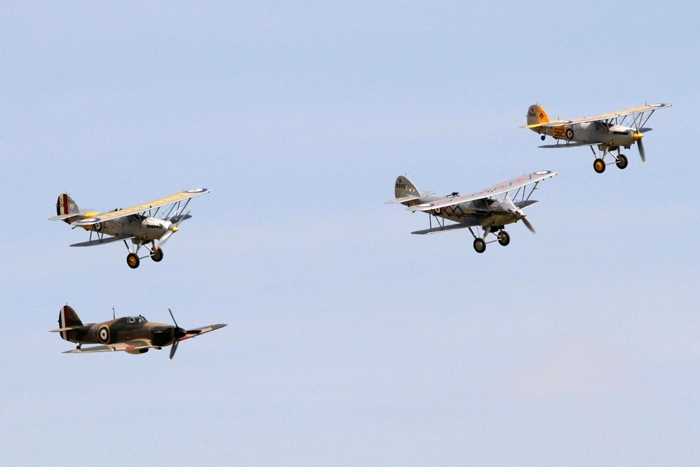 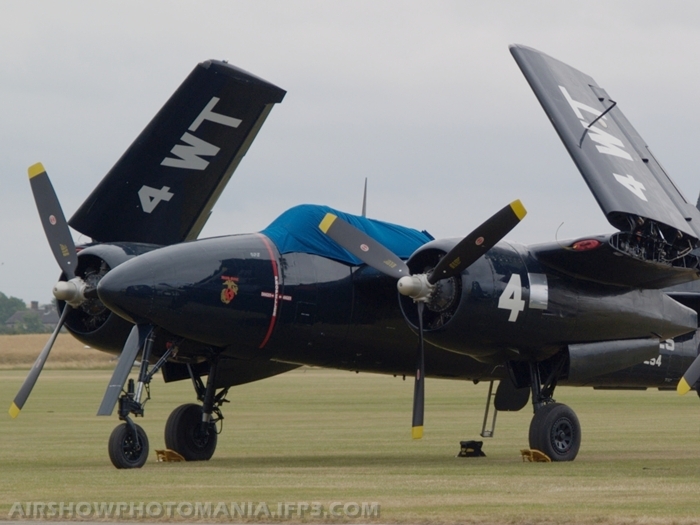 As usual there was the tail-chase of Spitfires, other aircraft included the five-ship Mustang tail-chase, with a welcome return to Duxford for The Scandinavian Historic Flight's AV-26B Invader. 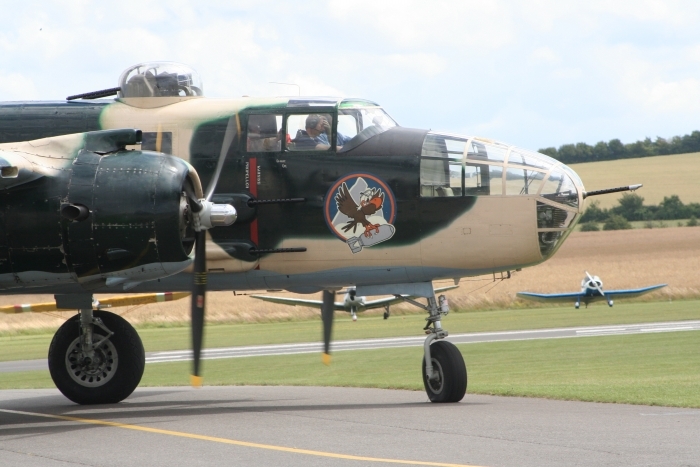 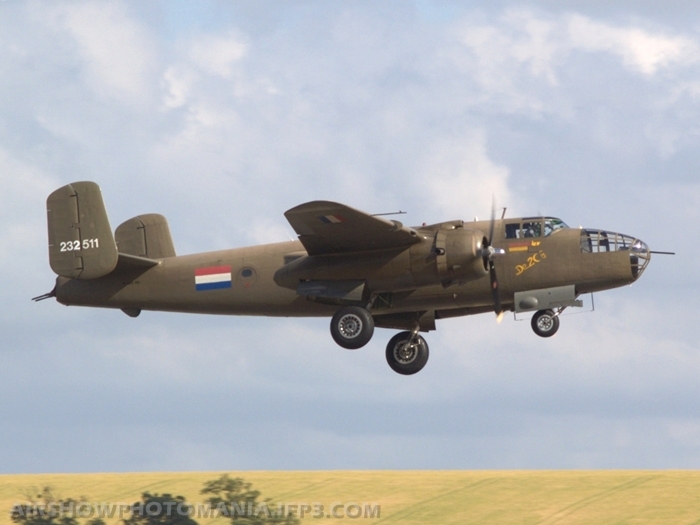 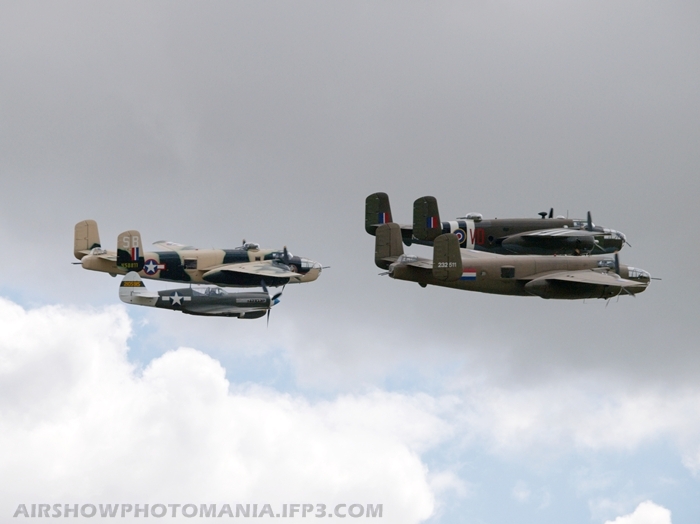 Also displaying were the Duke of Brabant Air Force B-25J Mitchell, as well as some of the smaller aircraft such as the Hawker Hind and Hawker Nimrod. 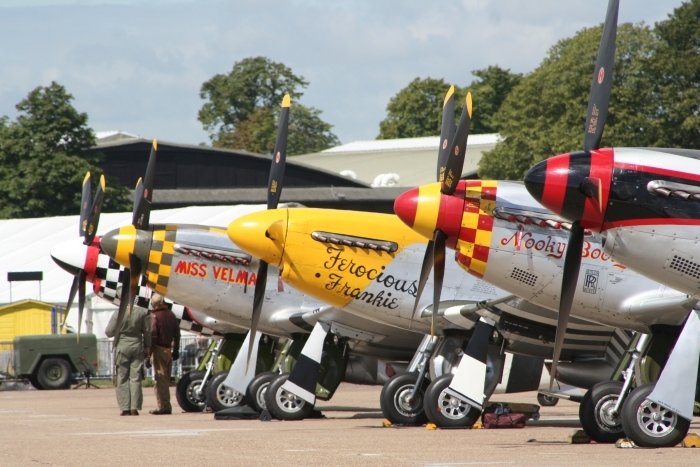 Flying Legends is probably the most popular of Duxford's air shows because it generally presents a number of new arrivals or special displays each year. 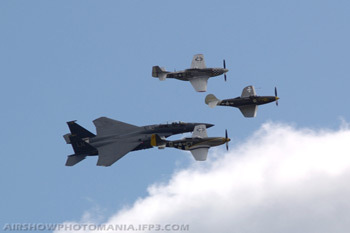 An unusual aircraft for Flying Legends was the F-15E Strike Eagle from Lakenheath, this aircraft was put through its paces and certainly got the attention of the watching crowd. 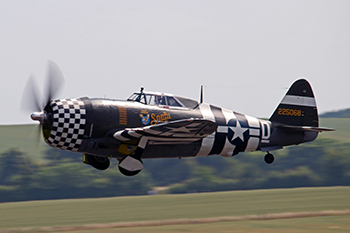 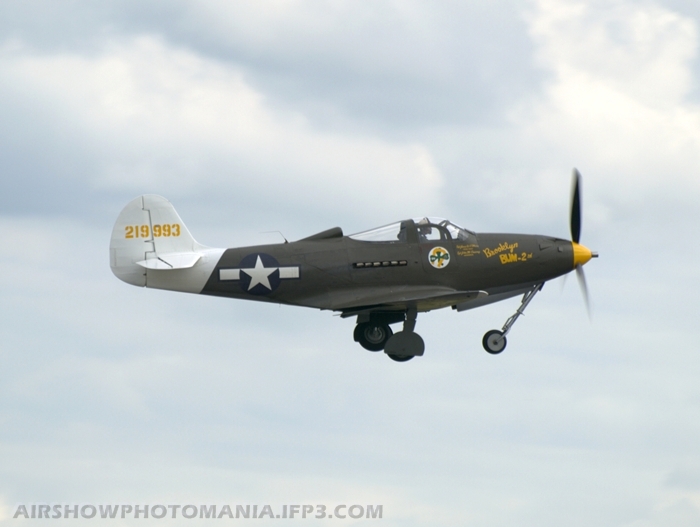 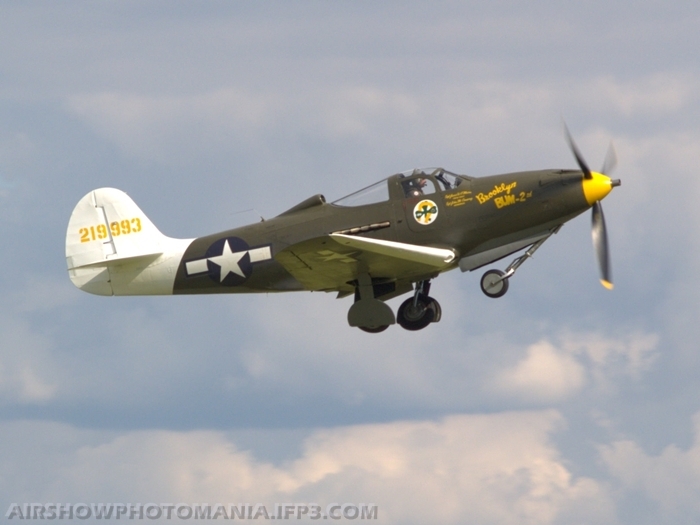 It later joined up with three aircraft from The Fighter Collection, the P-39Q Airacobra, the TF-51D and P-51D Mustangs were all flown by American Heritage Flight pilots. 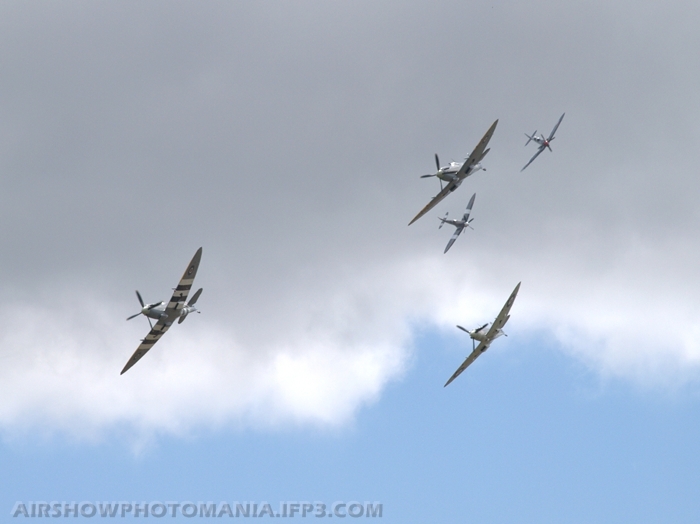 The show was graced by the usual massed flypast of Spitfires. 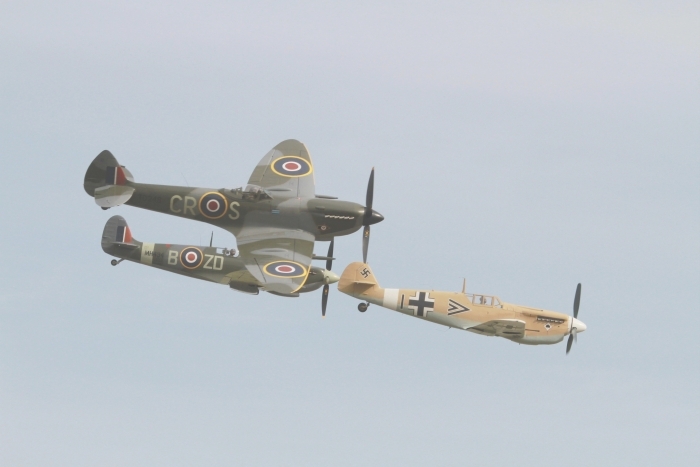 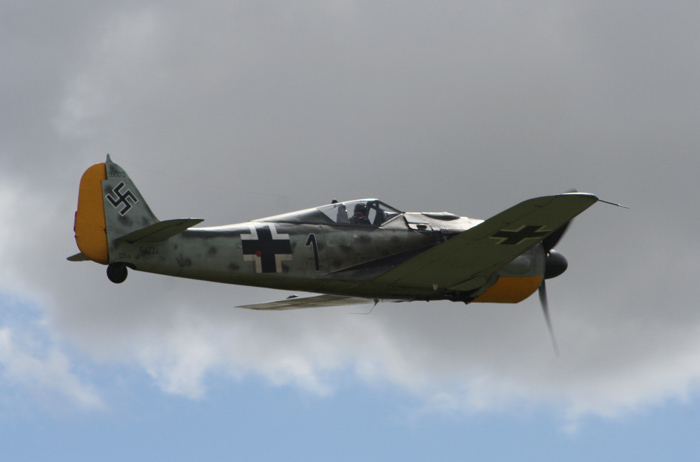 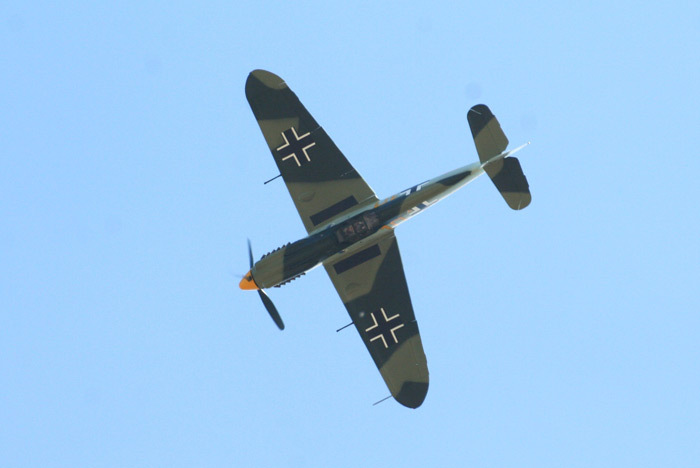 Other aircraft taking to the skies over the weekend included Hurricanes, The Battle of Britain Flight, Seafire and Sea Fury, and a pair Junkers Ju-52. 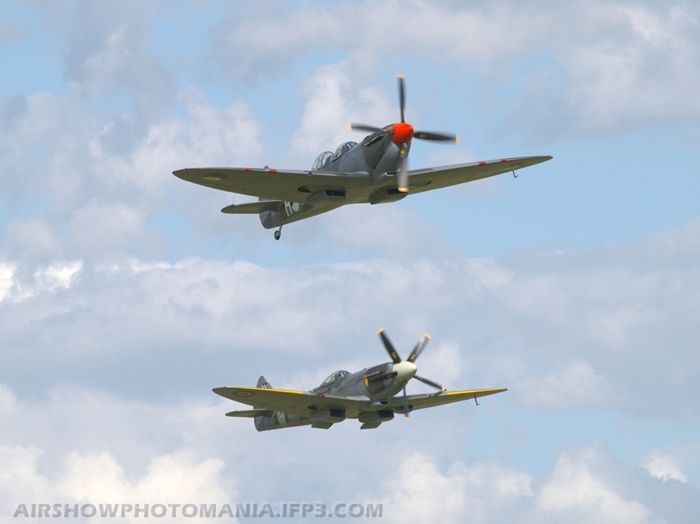 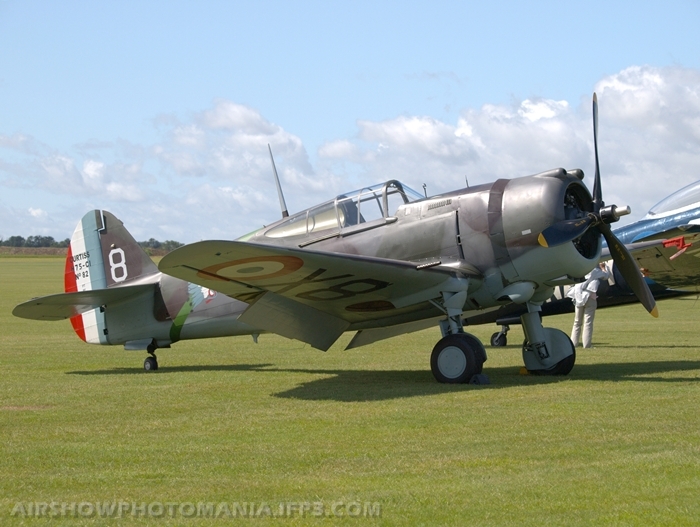 Flying legends 2006, one of Duxford's premier aviation events. 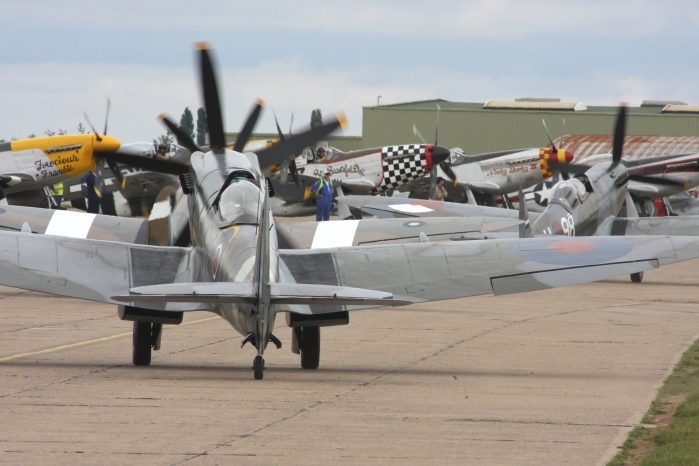 Starting with the flightline walk, which gives the public the chance to get up close and personal with the aircraft, even if you just want to look and take in the nostalgia of these fine machines. 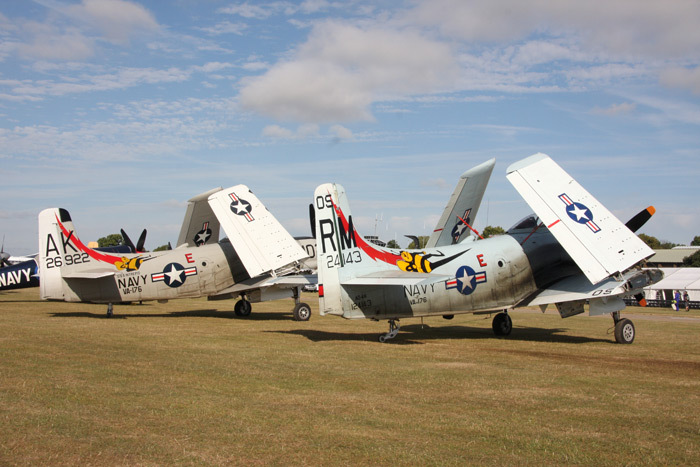 This year's show had several rare aircraft previously not seen at Legends. 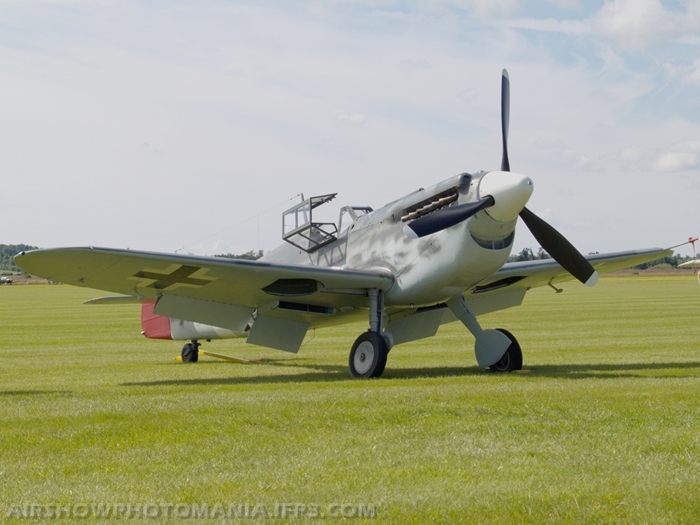 Breitling's Hispano Buchon, basically a Spanish built Me 109 with a Merlin engine, a Dakota from Norway finished in its very attractive bare metal and a French World War II Morane 406, which is the only airworthy example. 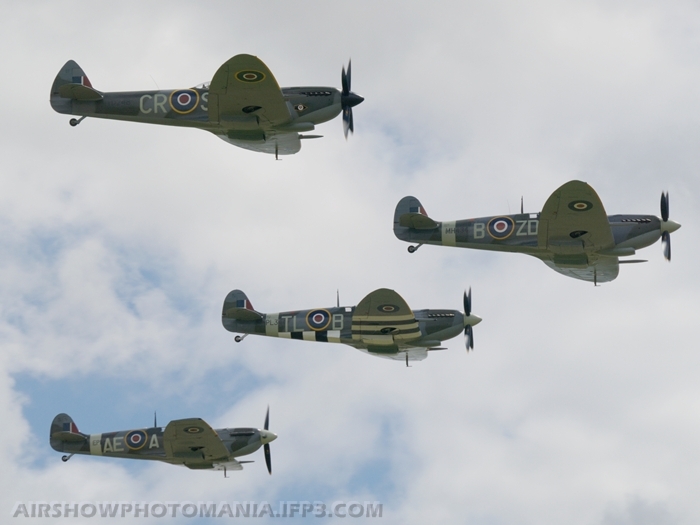 The display by ten Spitfires tail-chasing brought back memories of Duxford being a former Spitfire station. 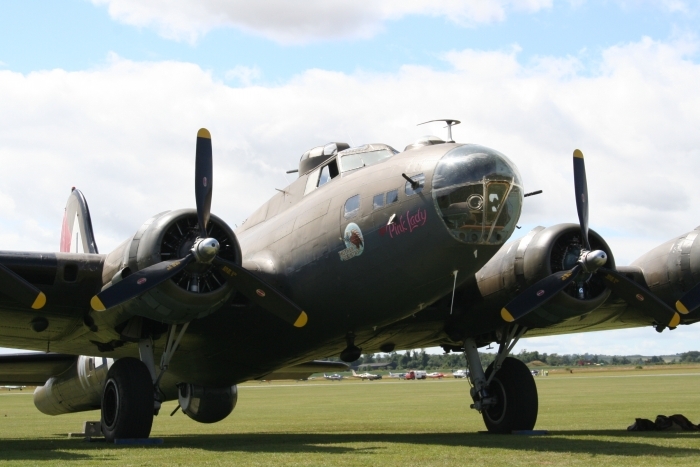 Other aircraft represented were the B-17 'Sally B' and B-17 'Pink Lady' and the Mitchell B-25. 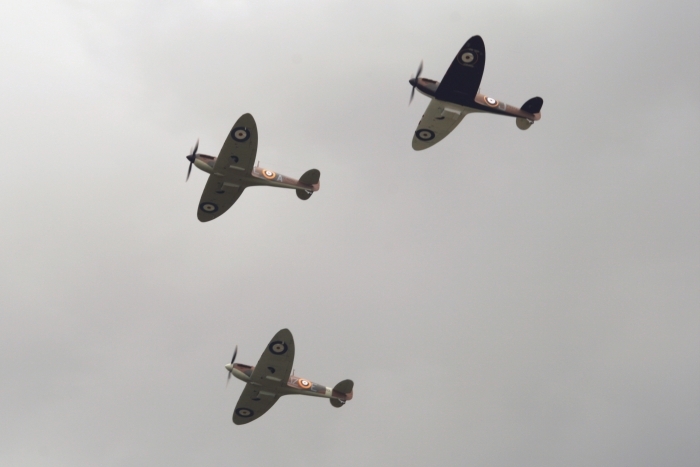 Overall a good show of approximately three hours duration, with the added bonus of Stephen Grey's famous 'Balbo' massed formation flypast.